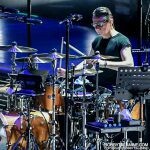 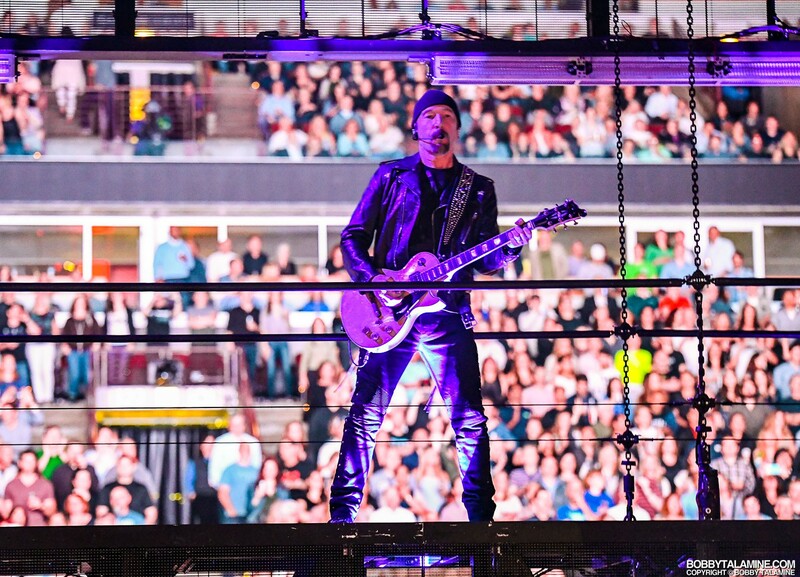 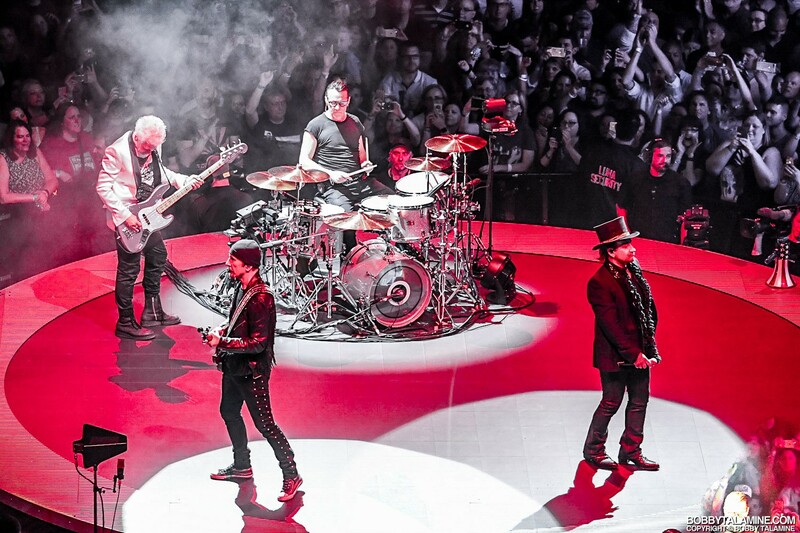 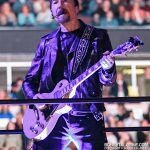 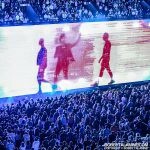 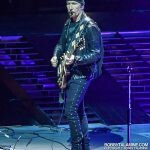 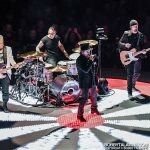 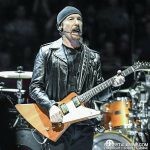 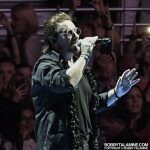 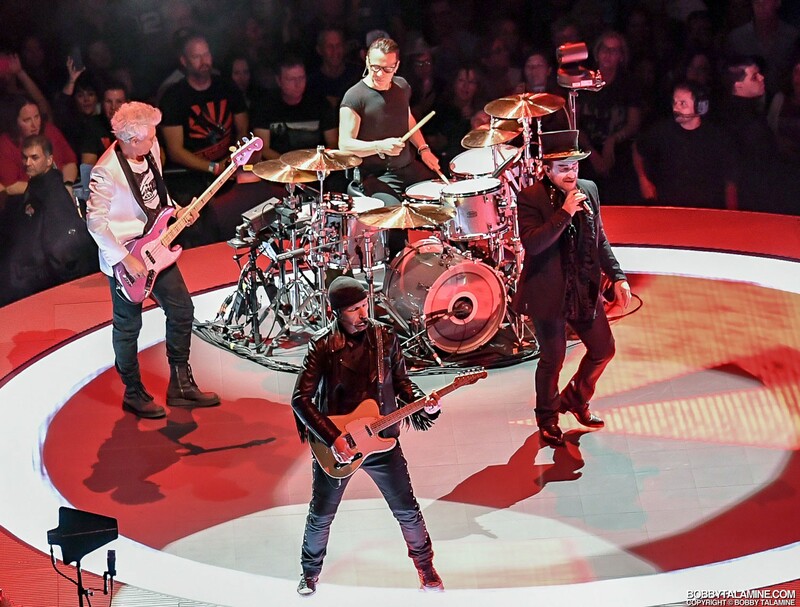 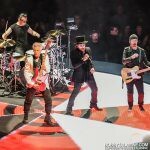 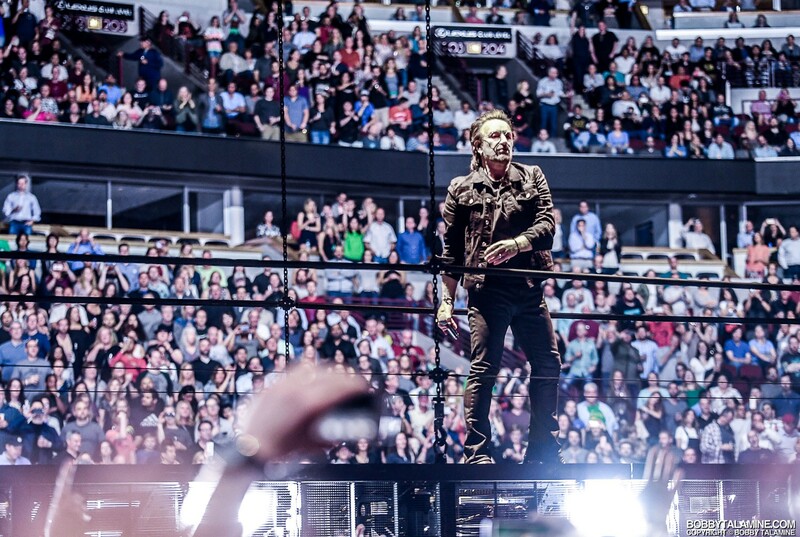 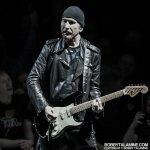 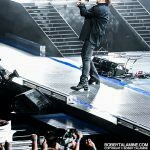 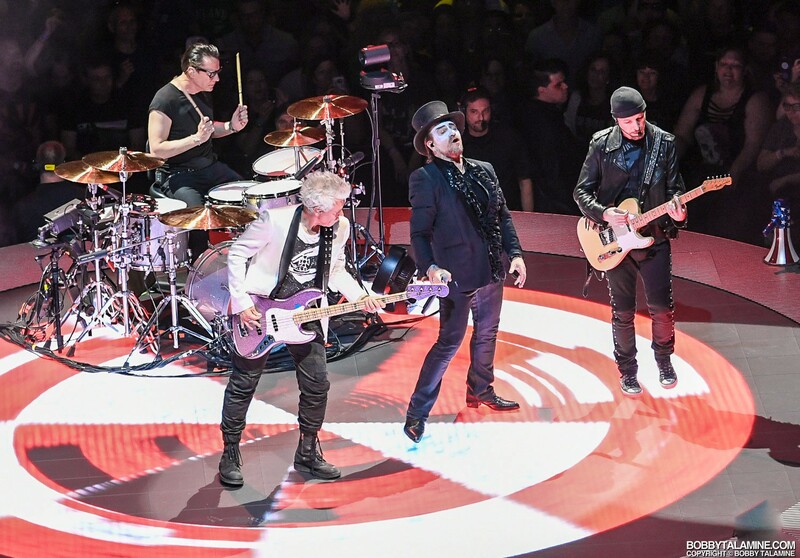 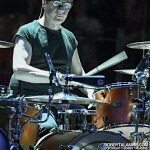 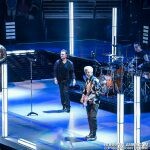 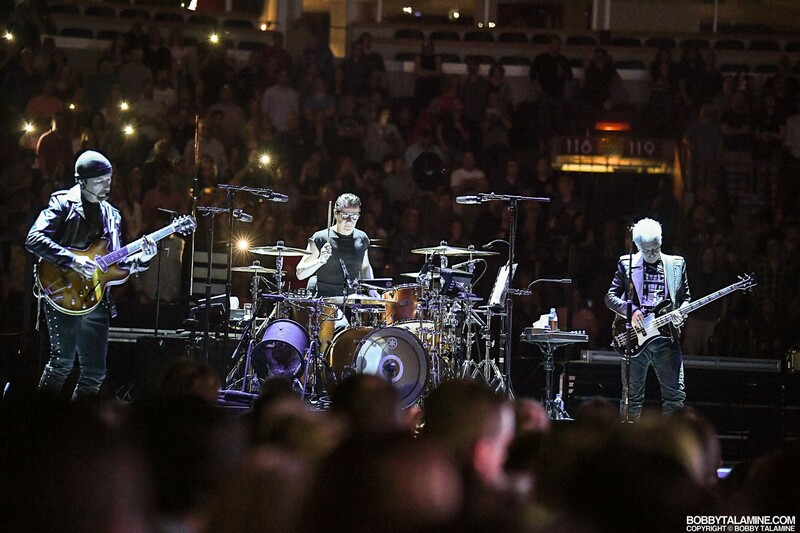 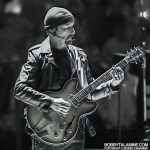 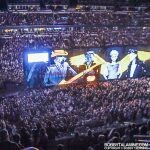 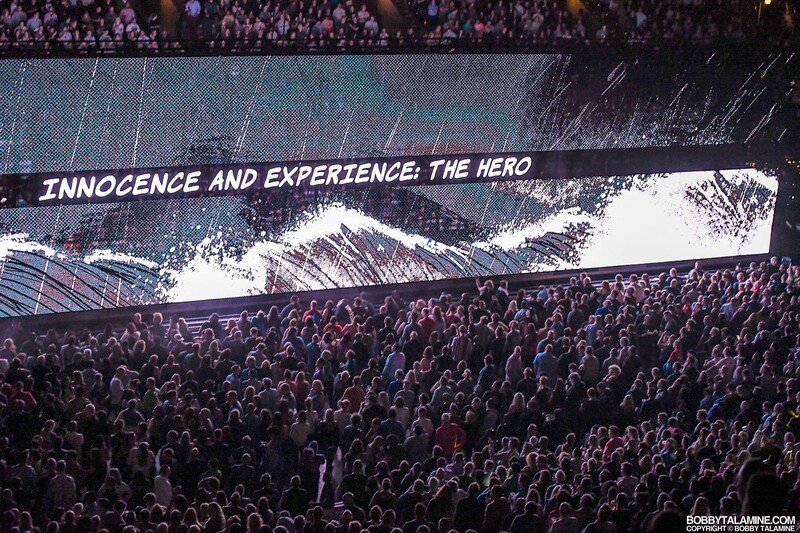 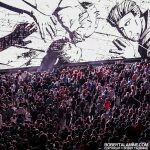 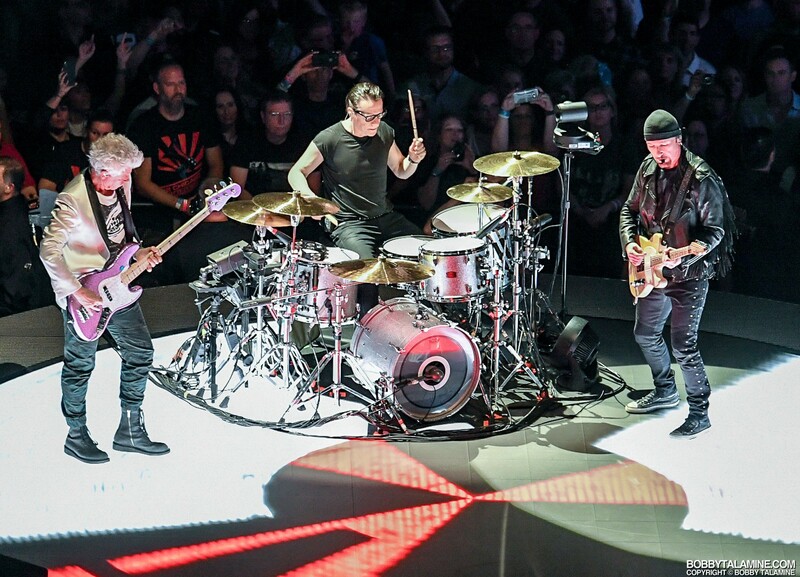 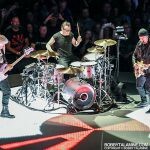 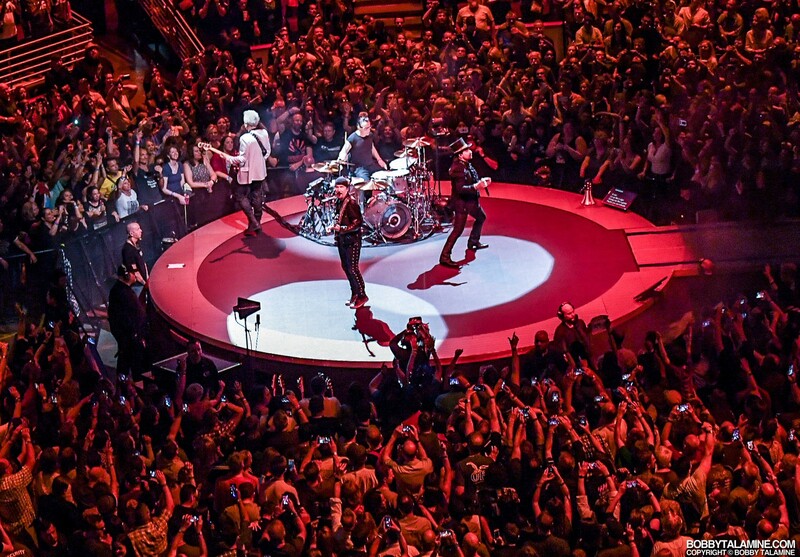 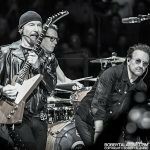 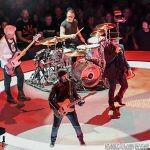 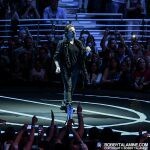 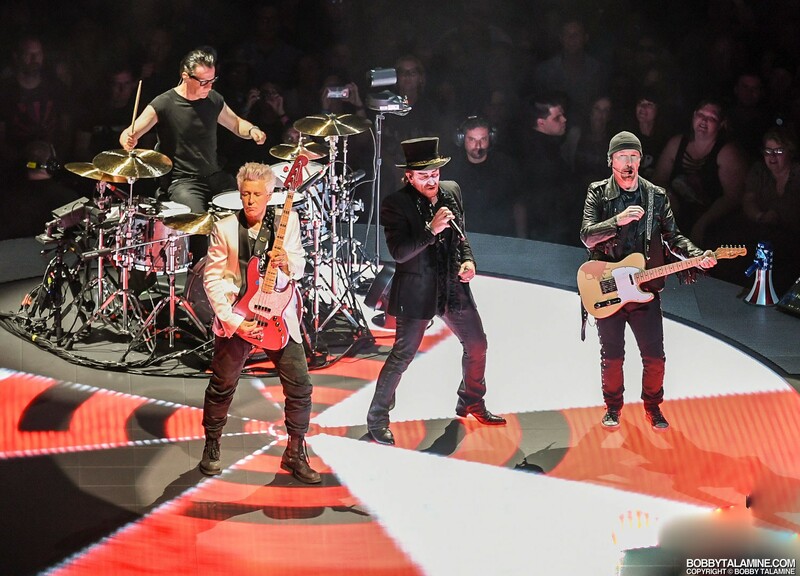 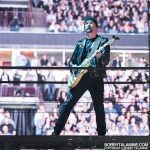 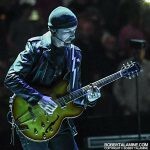 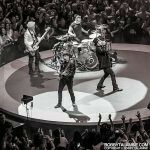 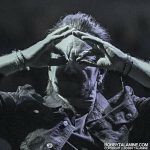 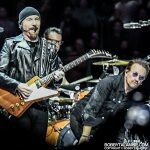 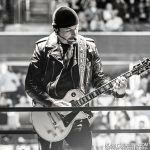 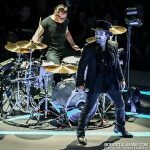 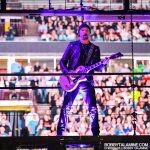 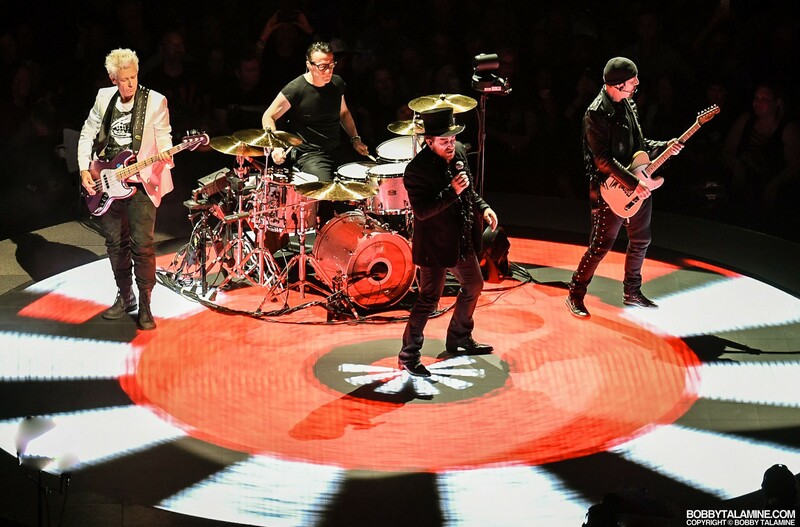 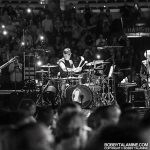 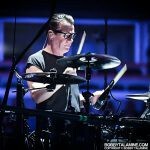 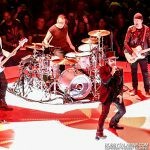 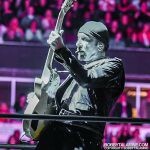 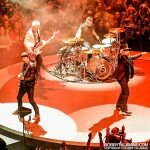 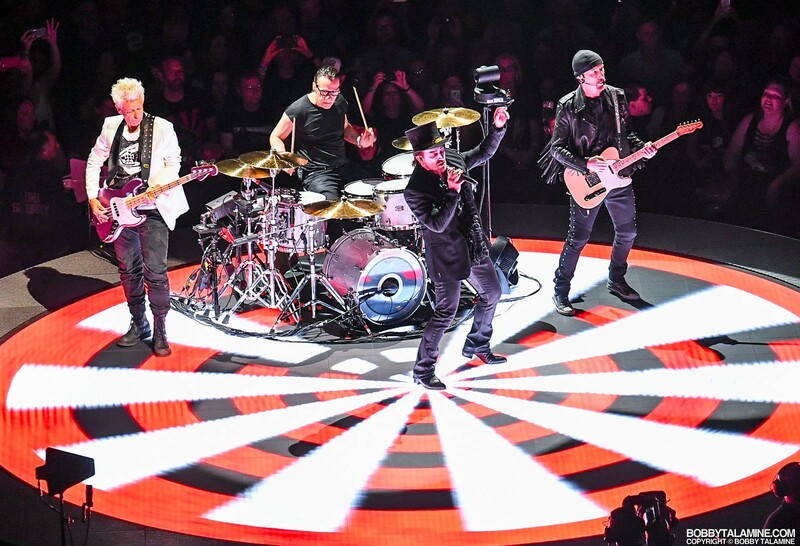 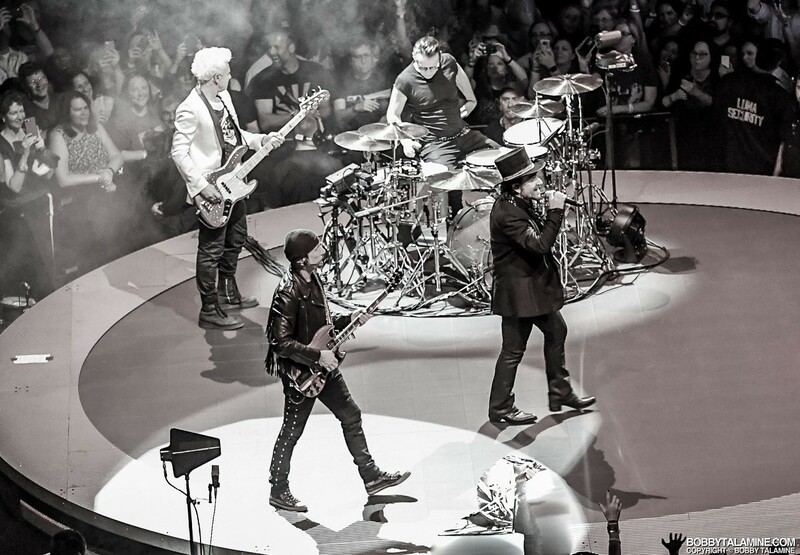 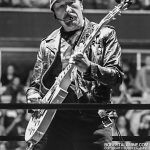 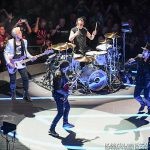 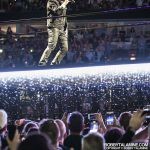 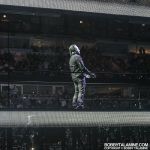 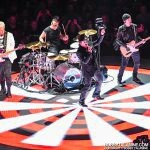 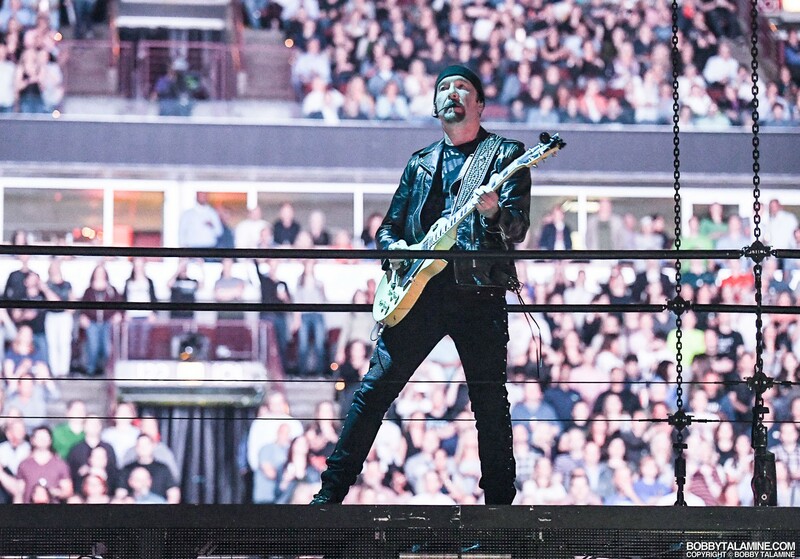 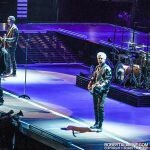 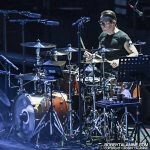 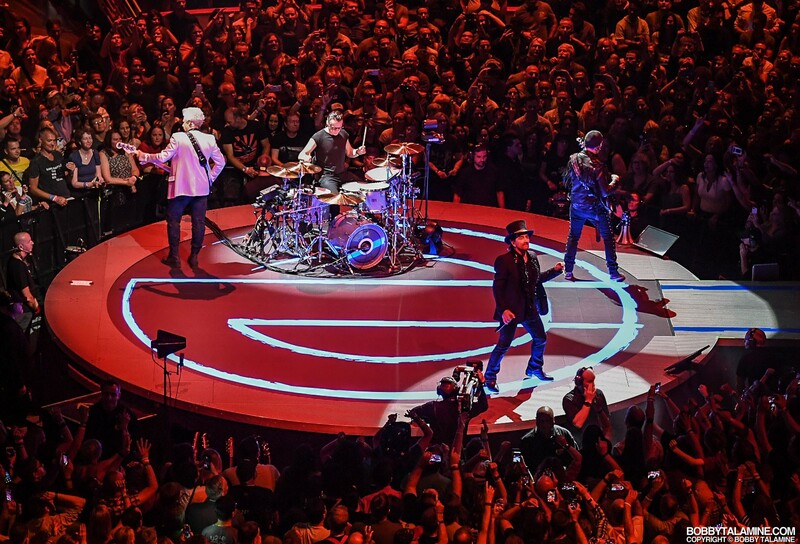 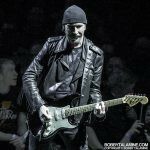 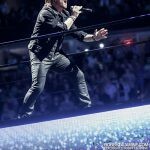 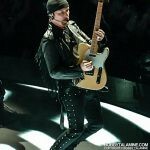 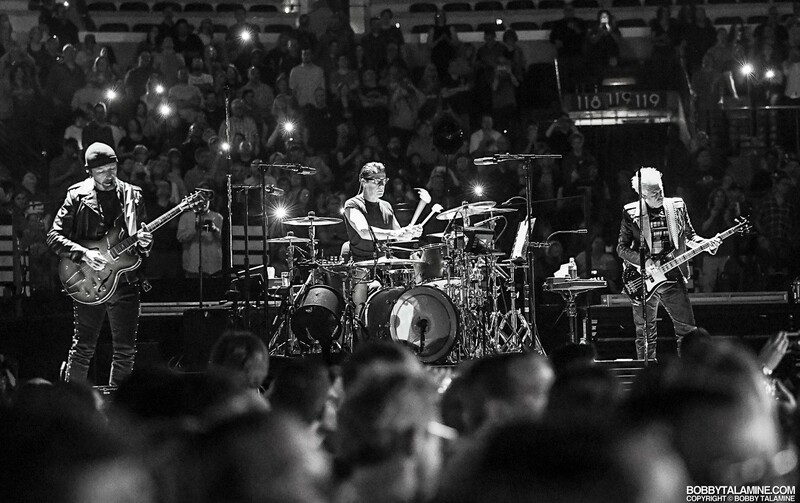 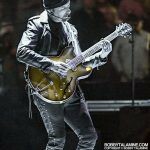 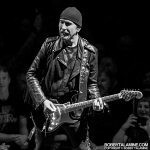 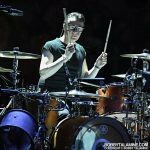 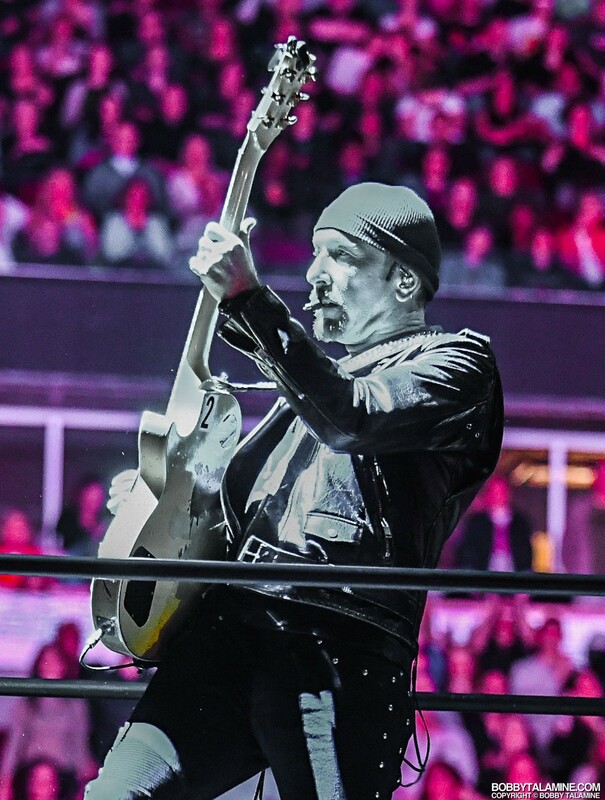 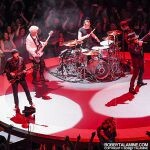 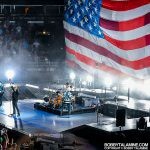 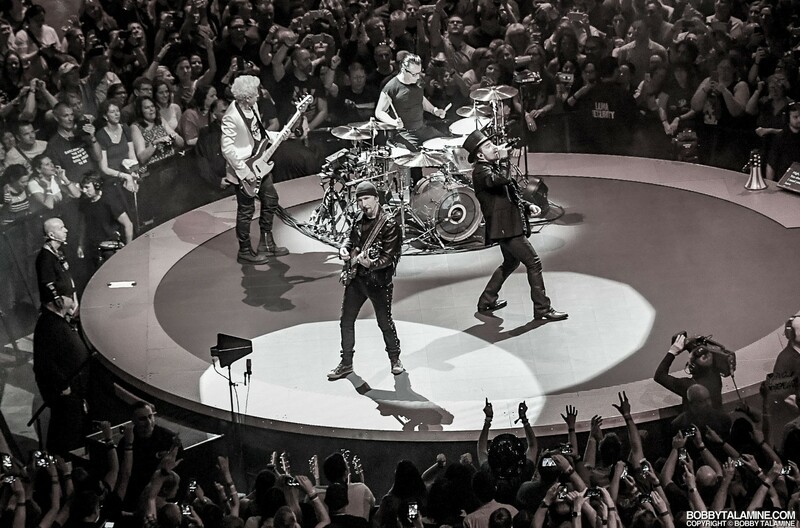 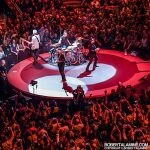 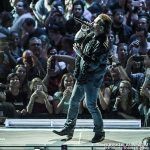 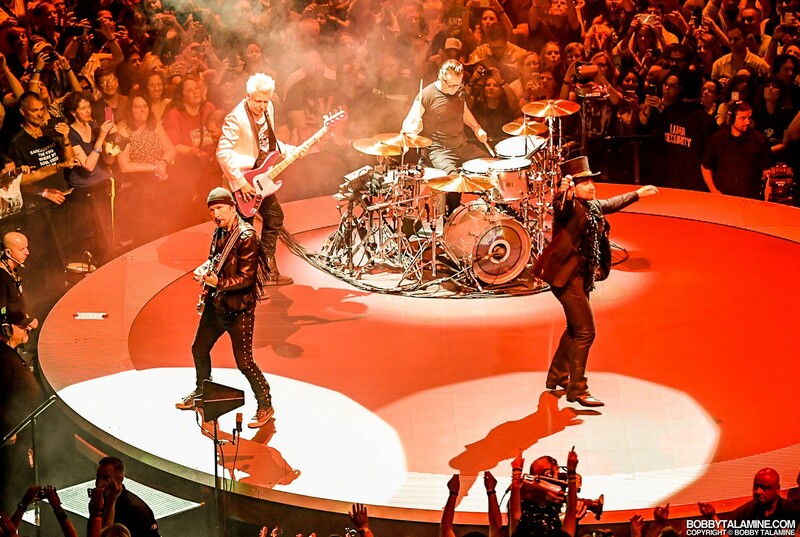 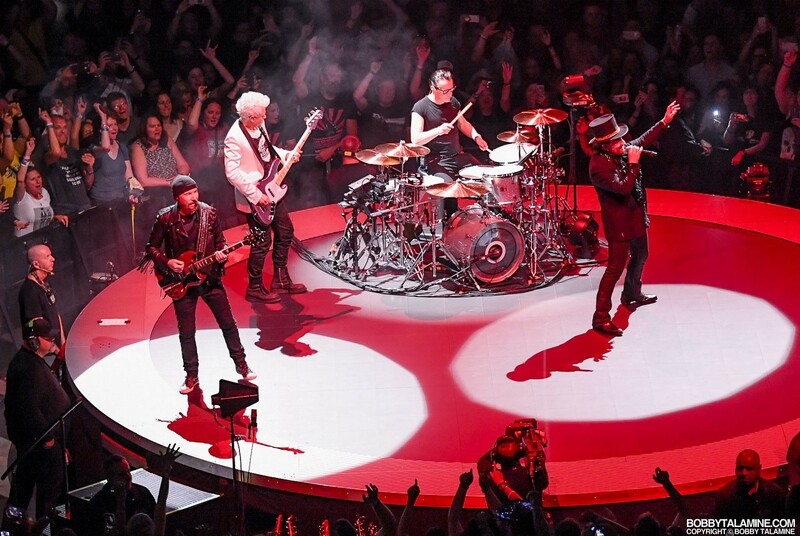 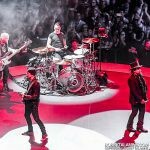 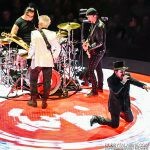 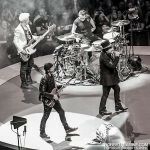 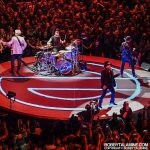 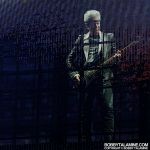 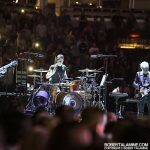 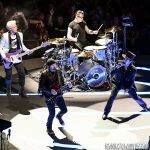 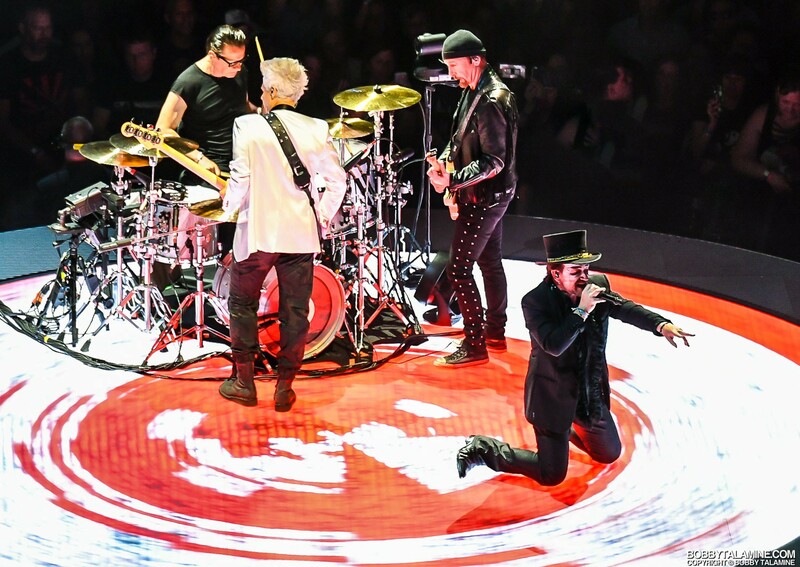 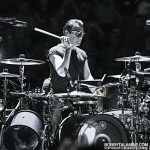 U2 taking their multimedia extravagant multimedia production of eXPERIENCE + iNNOCENCE tour across North America one more time. 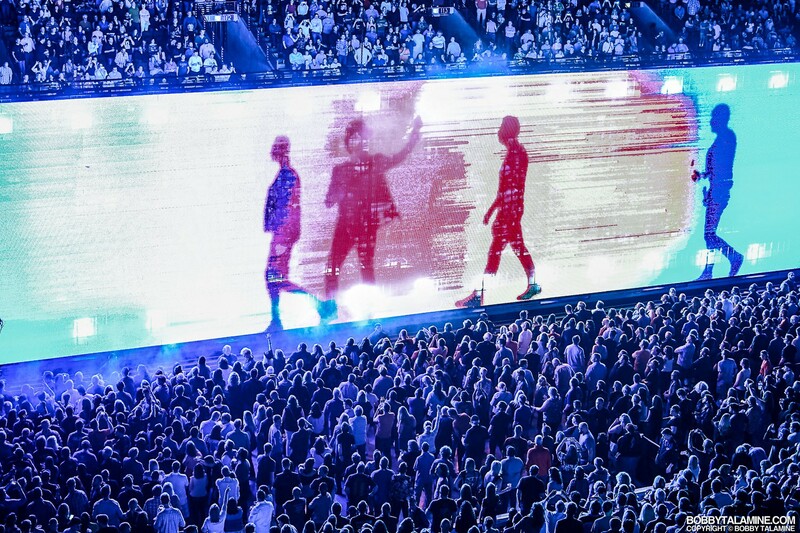 This “brand new show” is in so many ways a continuation of U2’s tour that finished three years ago- Innocence and Experience, and even using the same stage that separates the indoor arenas that it is being played in into two halves, with a giant immersive video / LED screen that literally all band members enter at exit freely from point A to Point B. 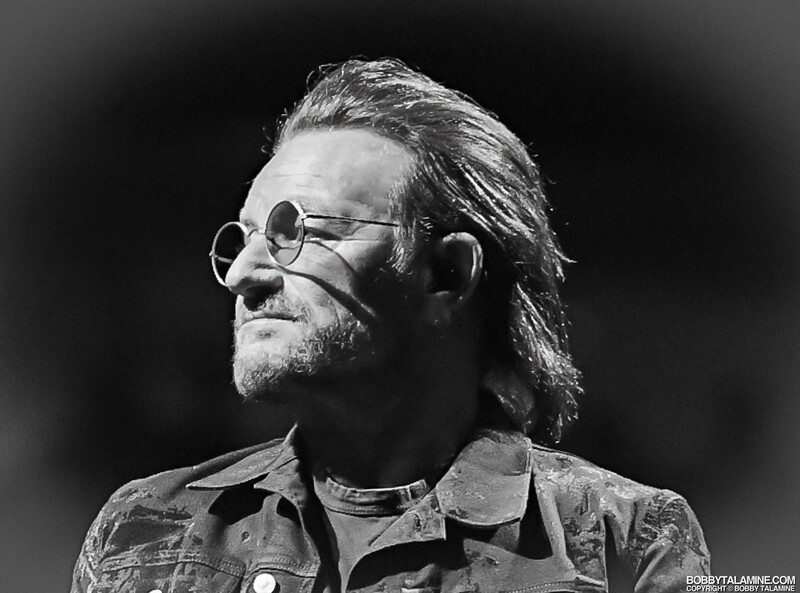 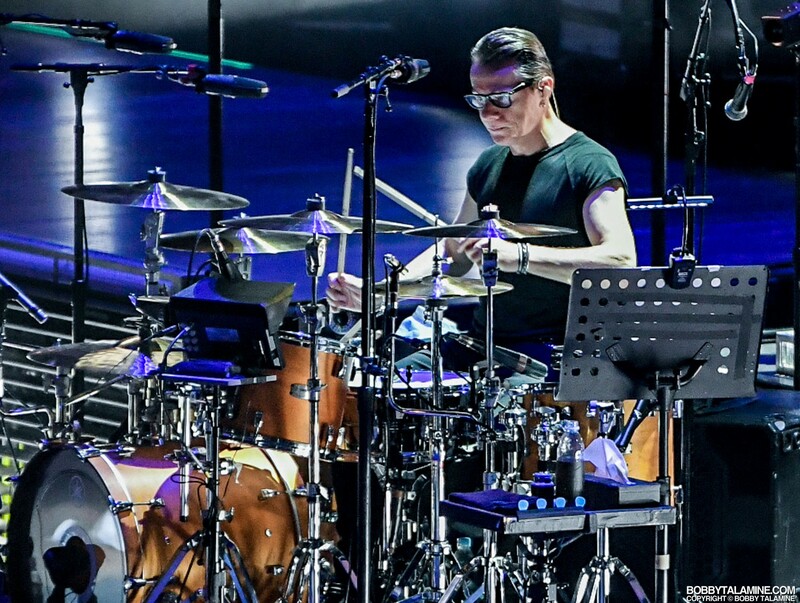 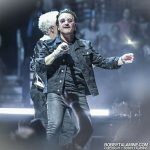 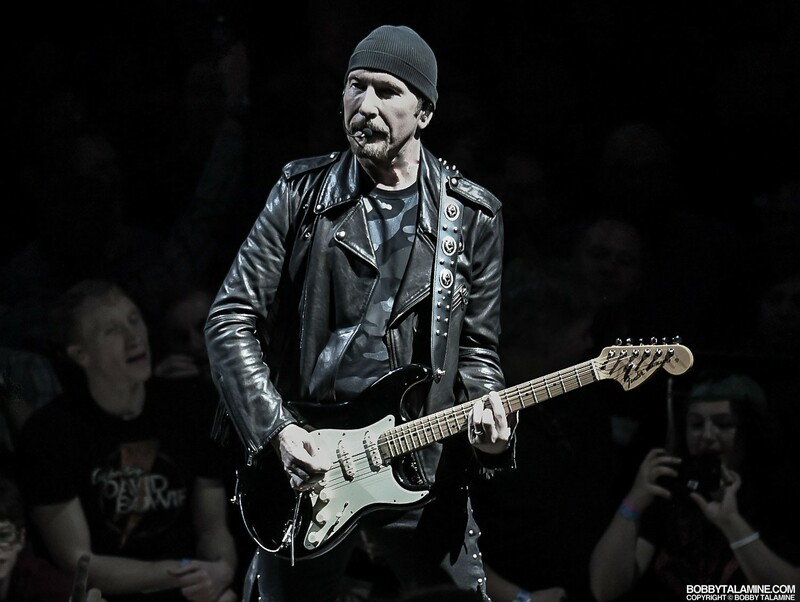 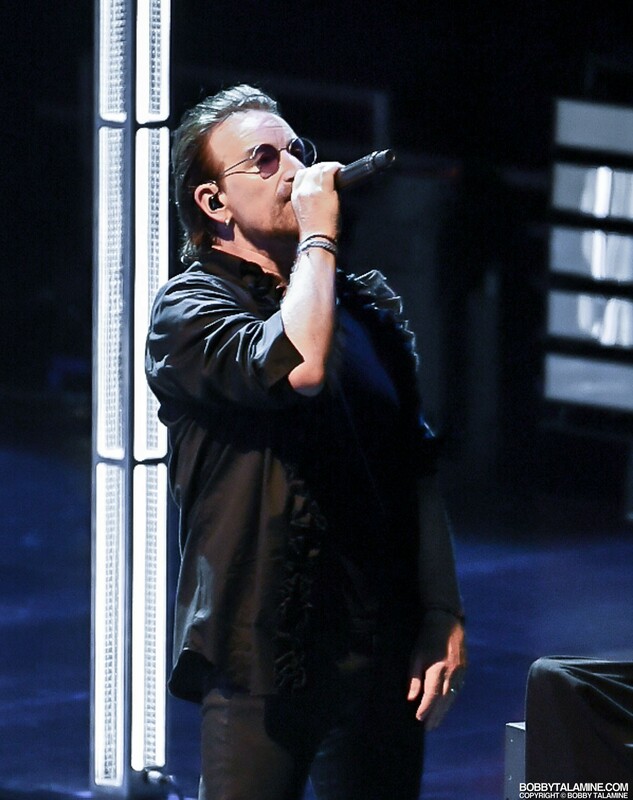 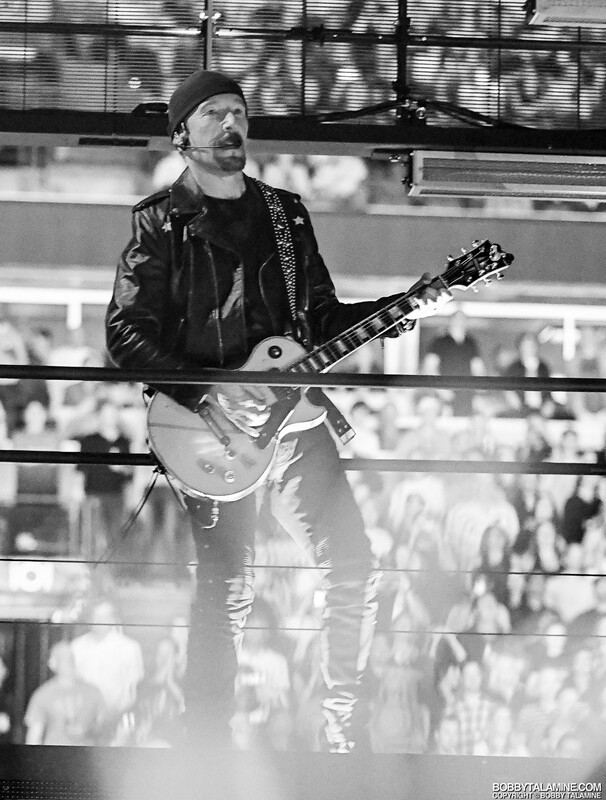 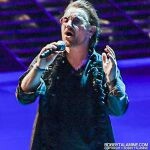 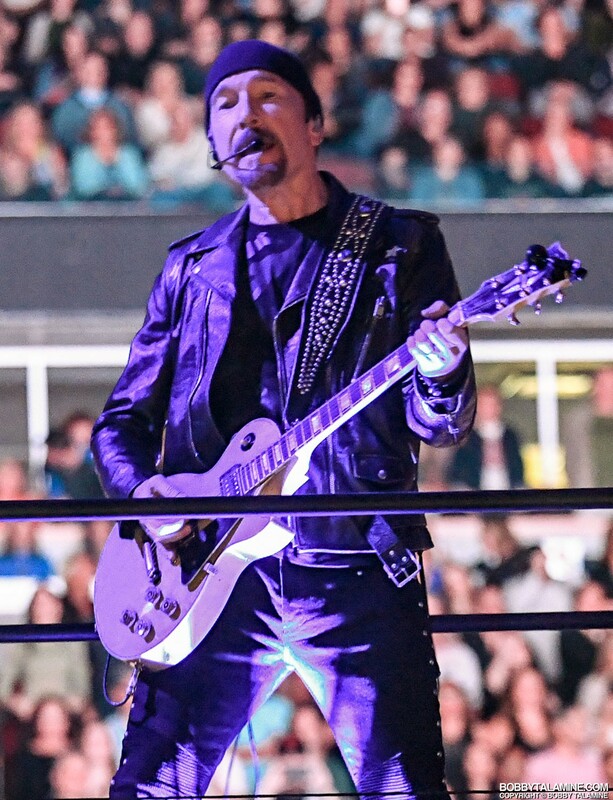 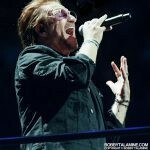 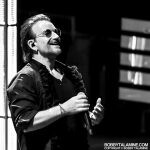 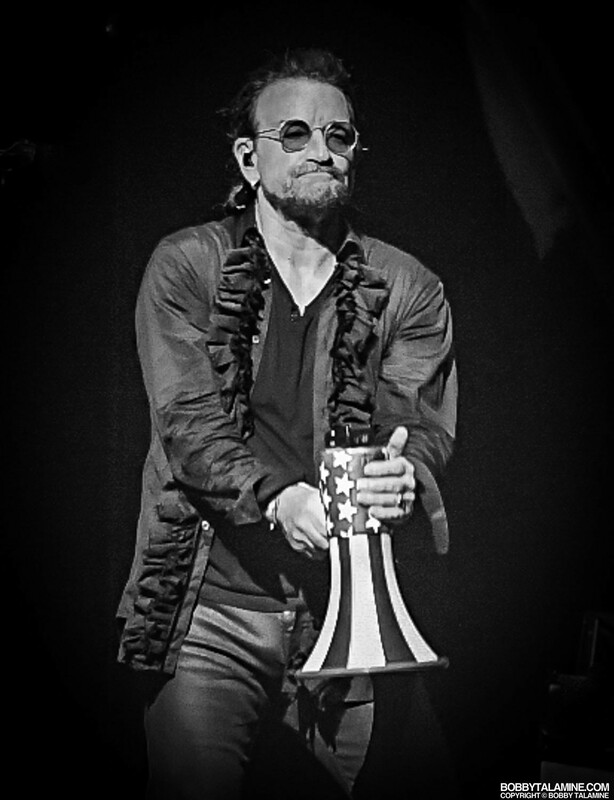 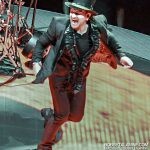 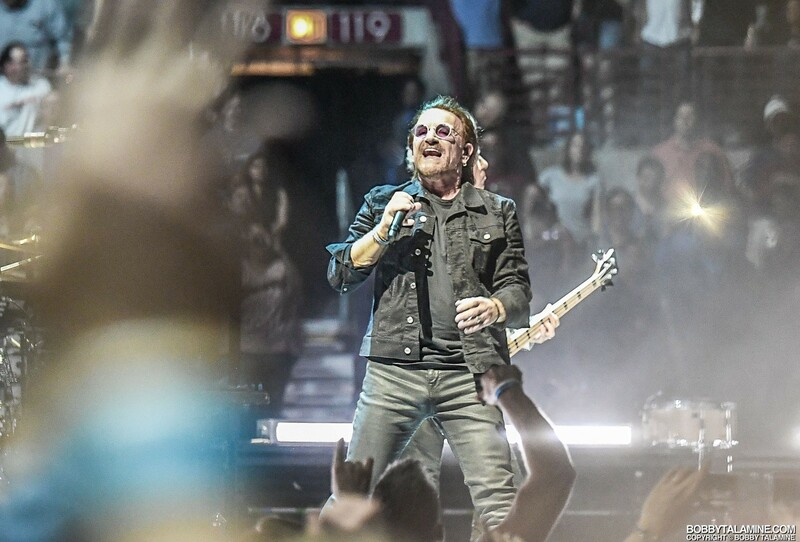 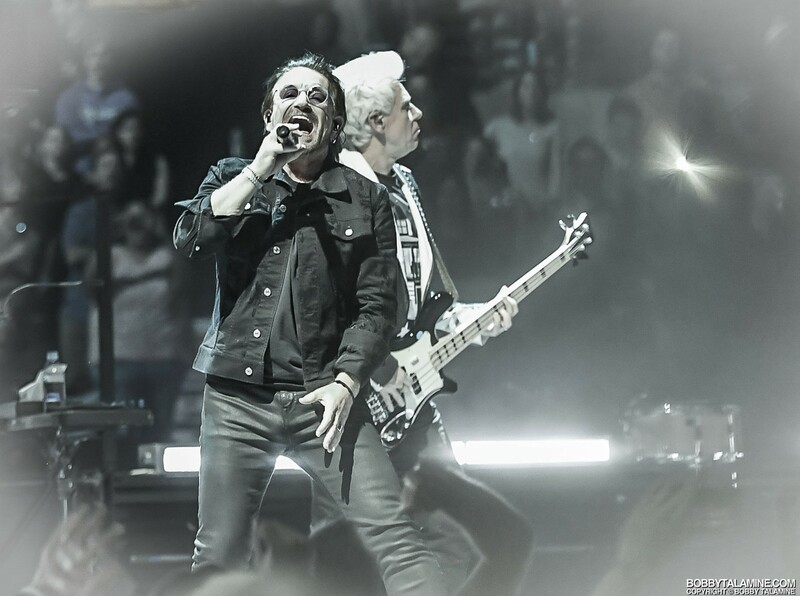 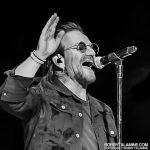 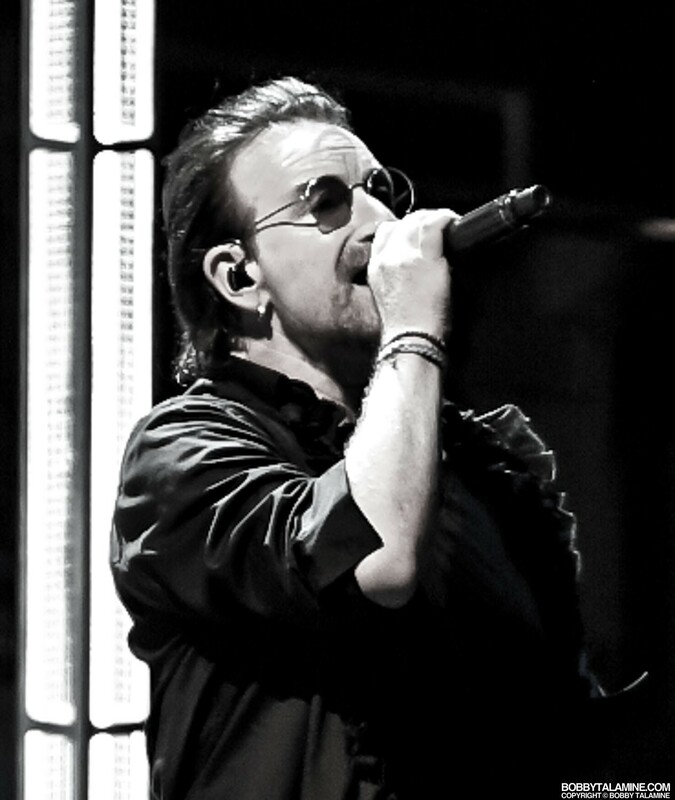 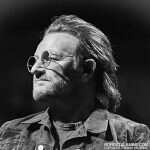 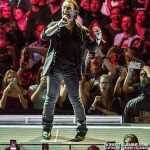 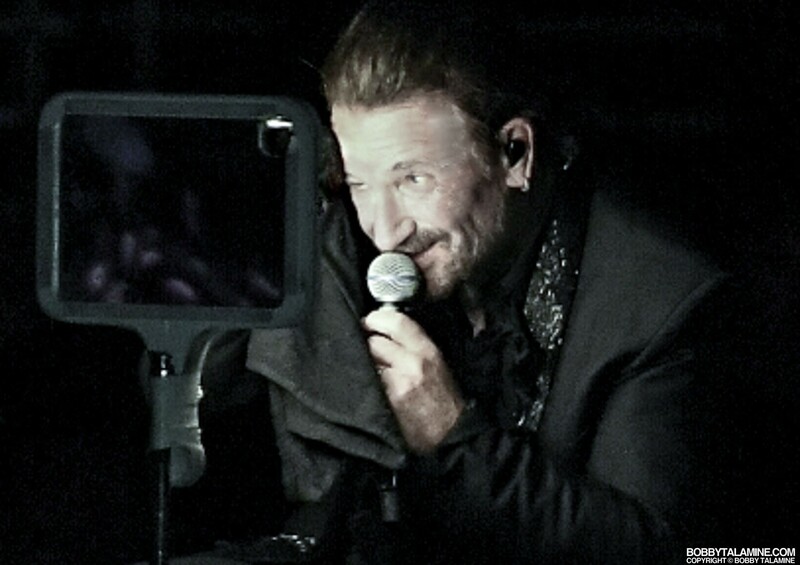 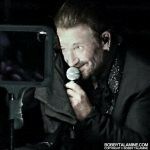 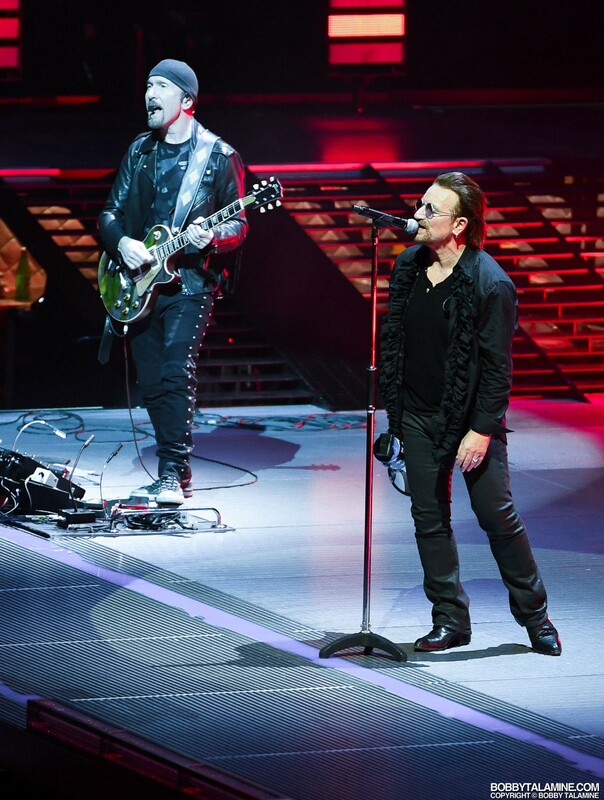 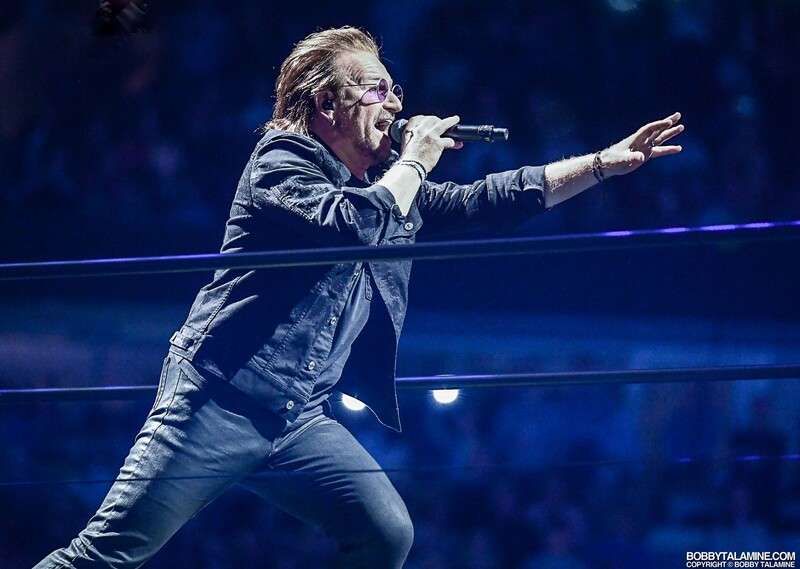 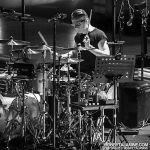 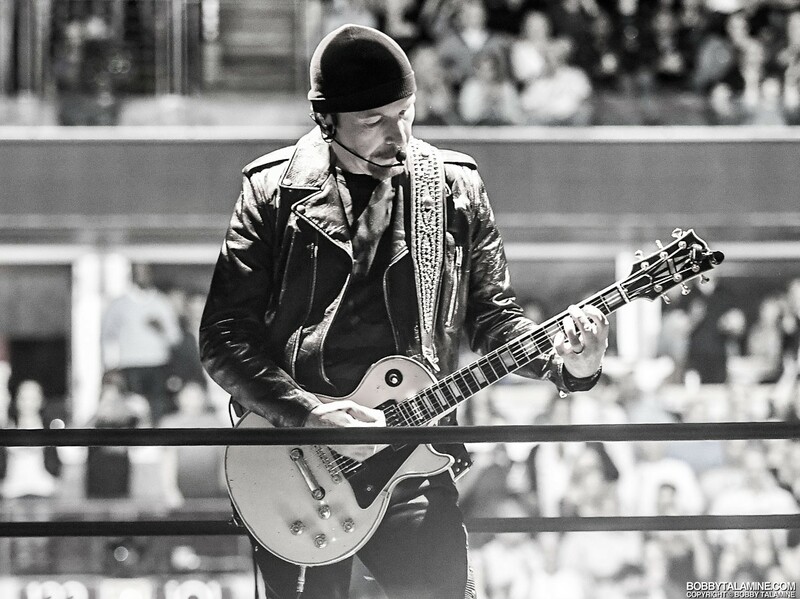 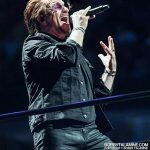 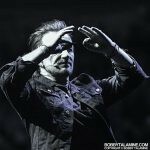 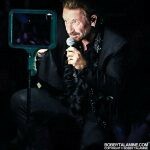 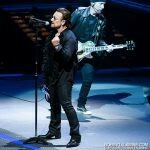 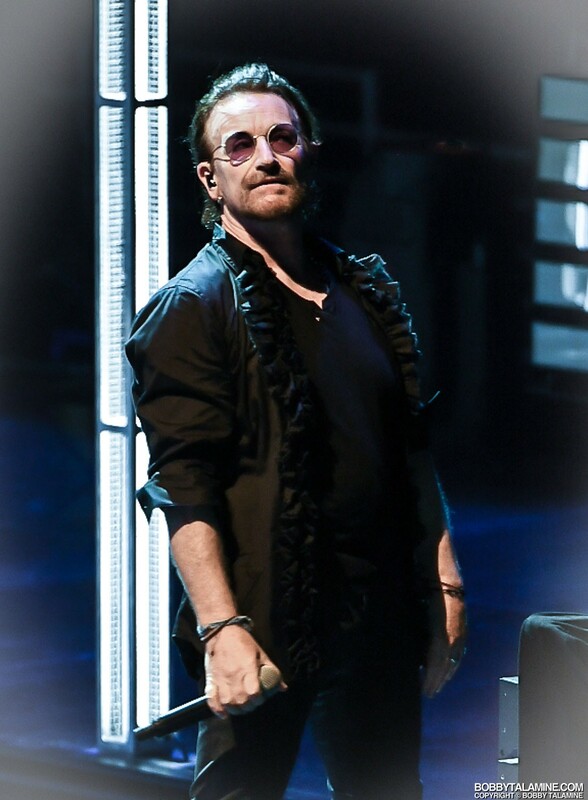 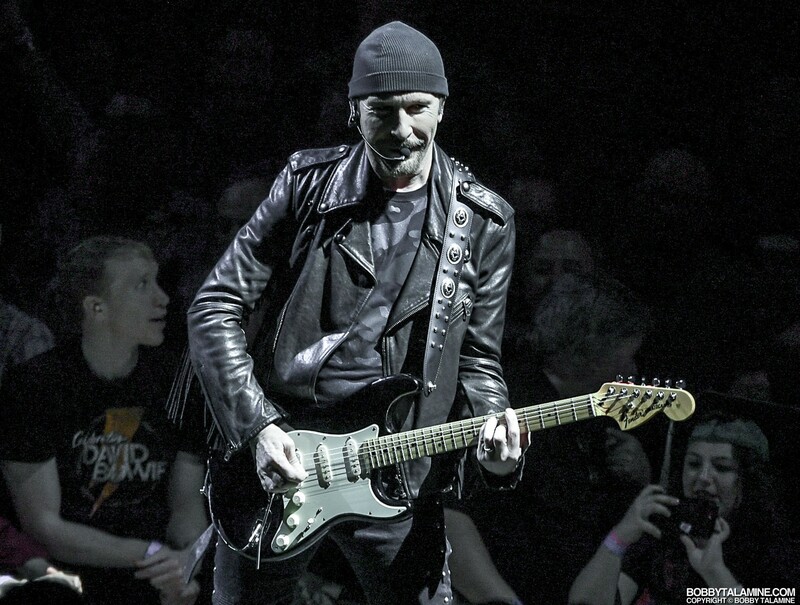 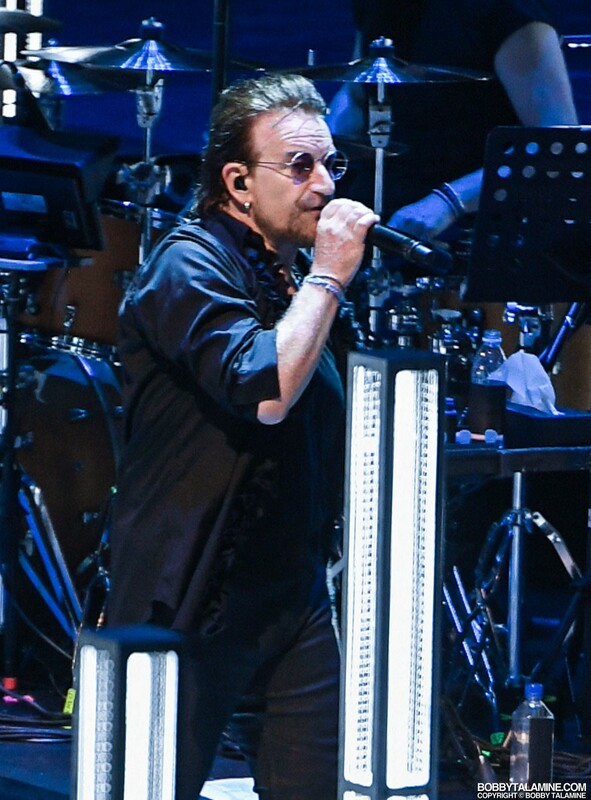 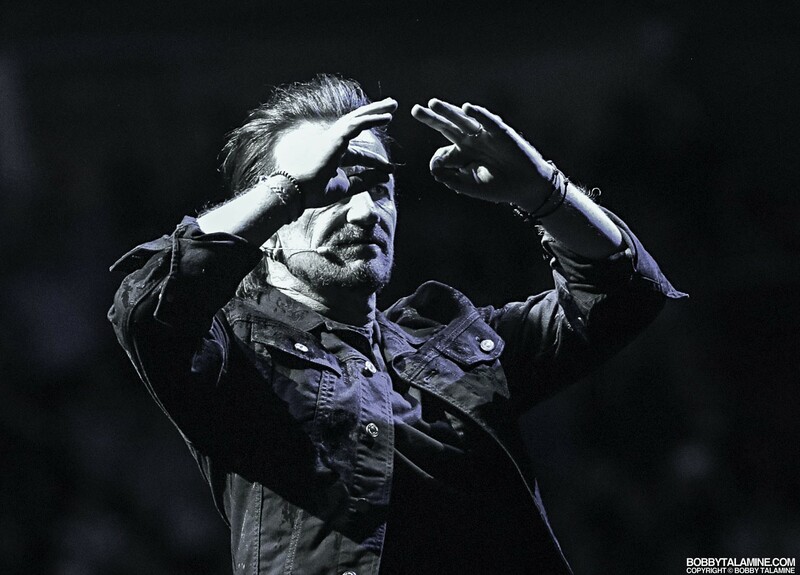 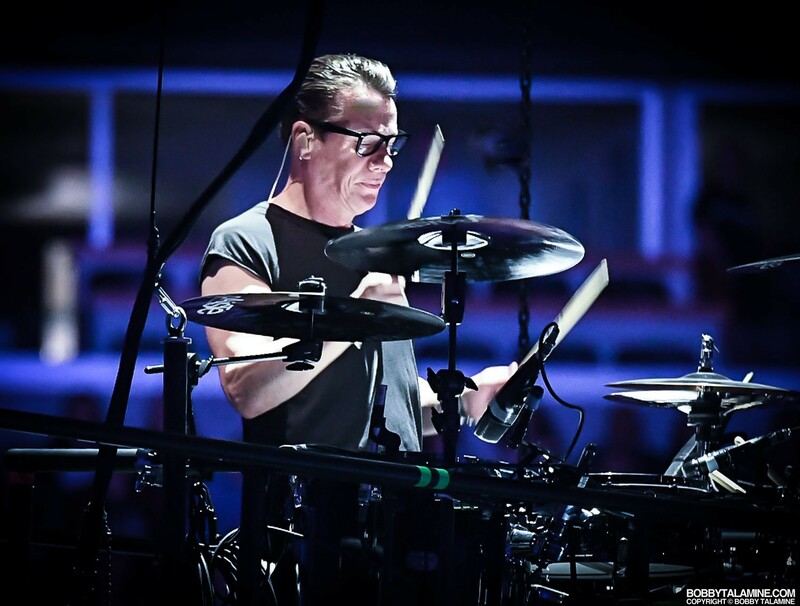 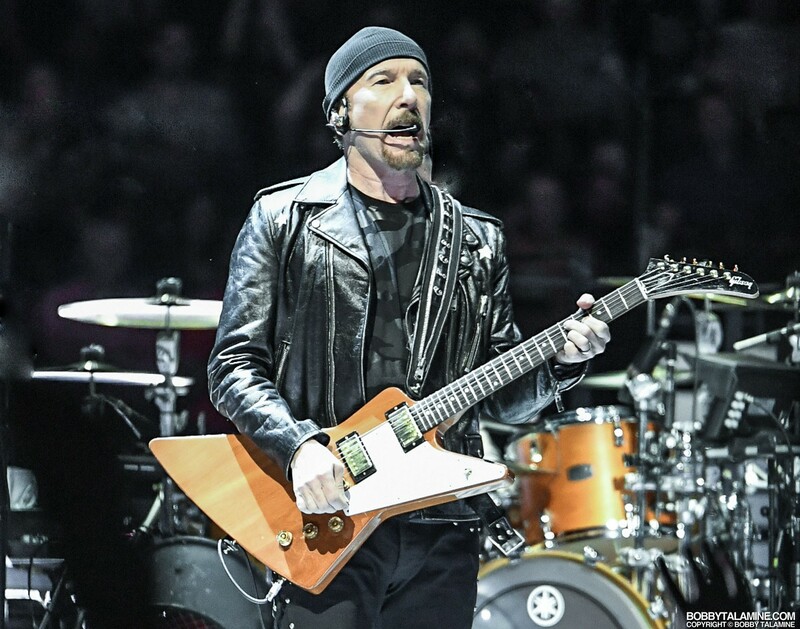 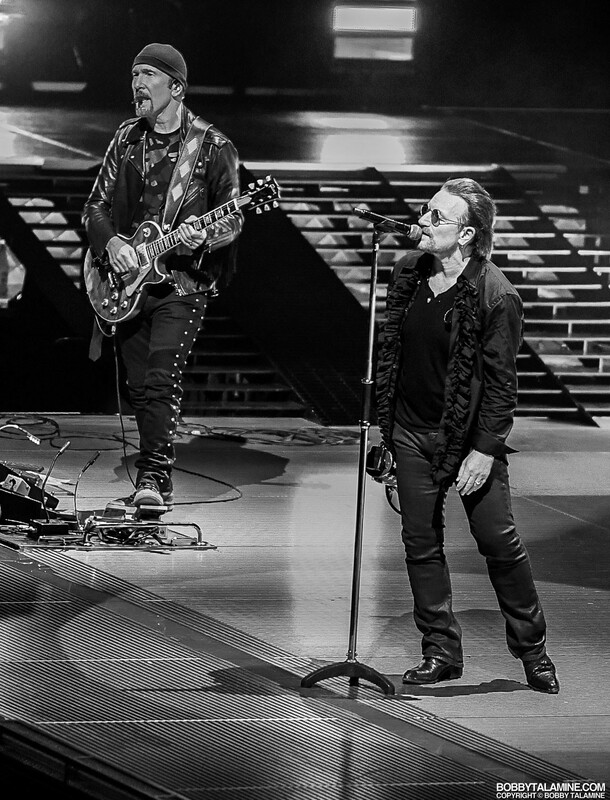 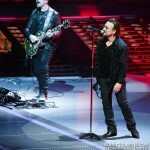 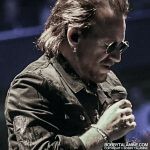 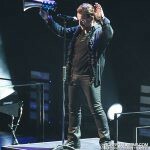 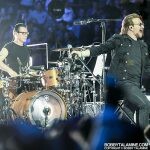 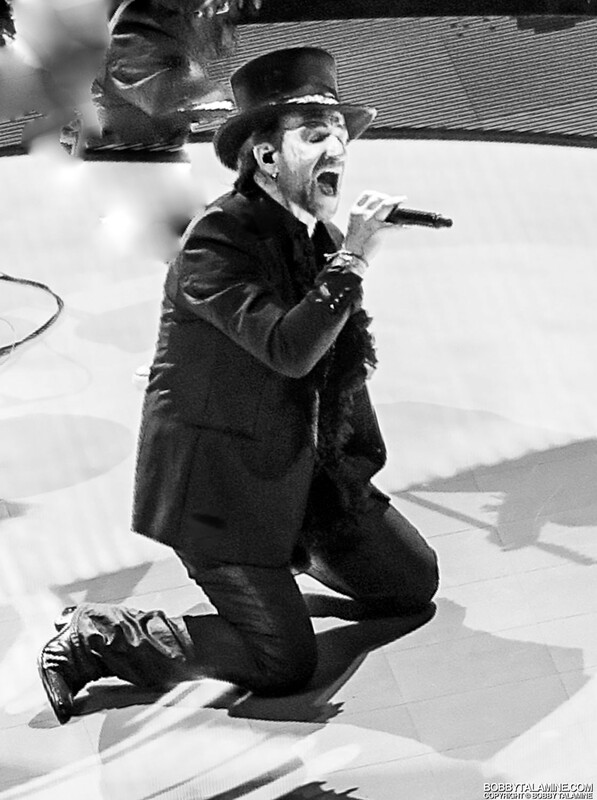 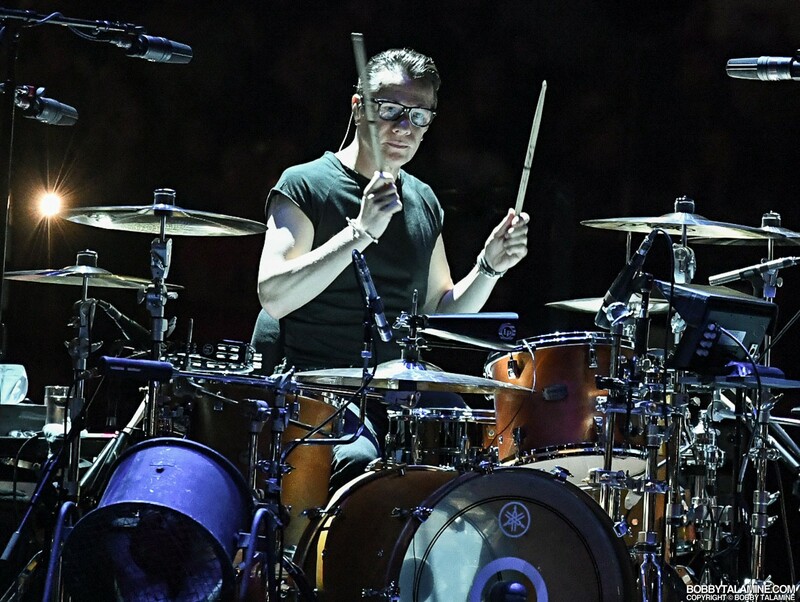 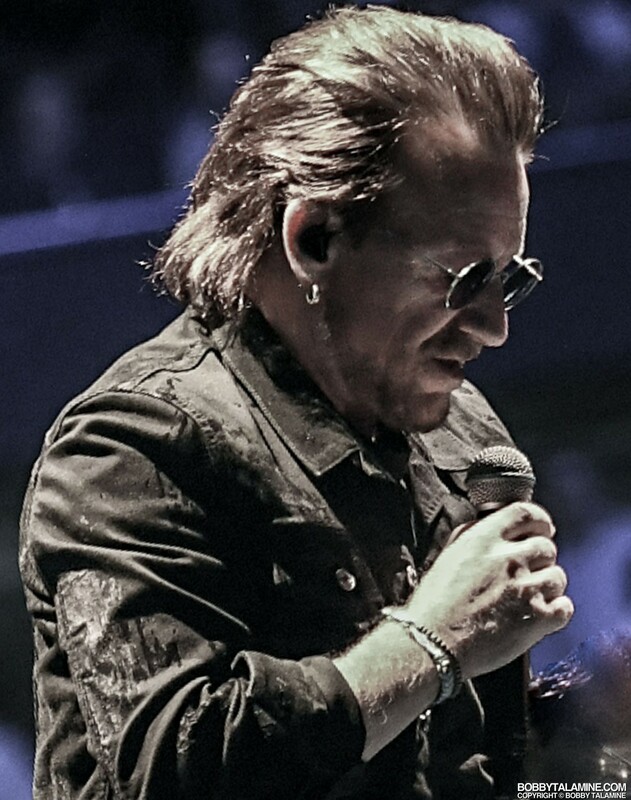 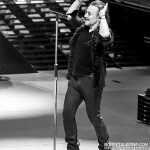 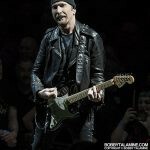 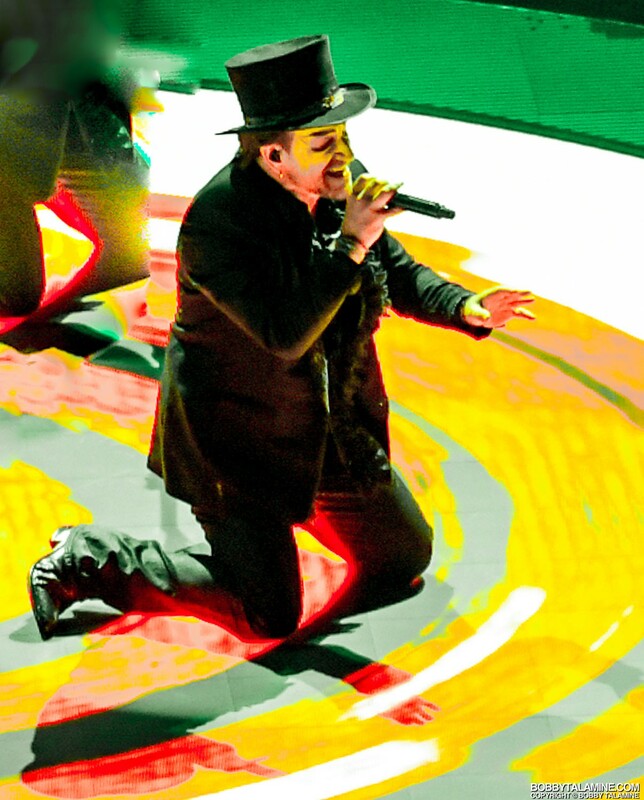 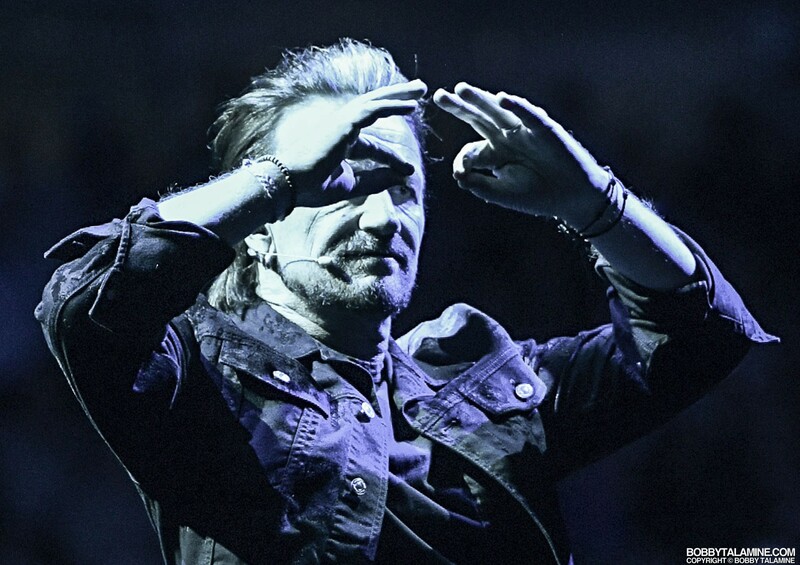 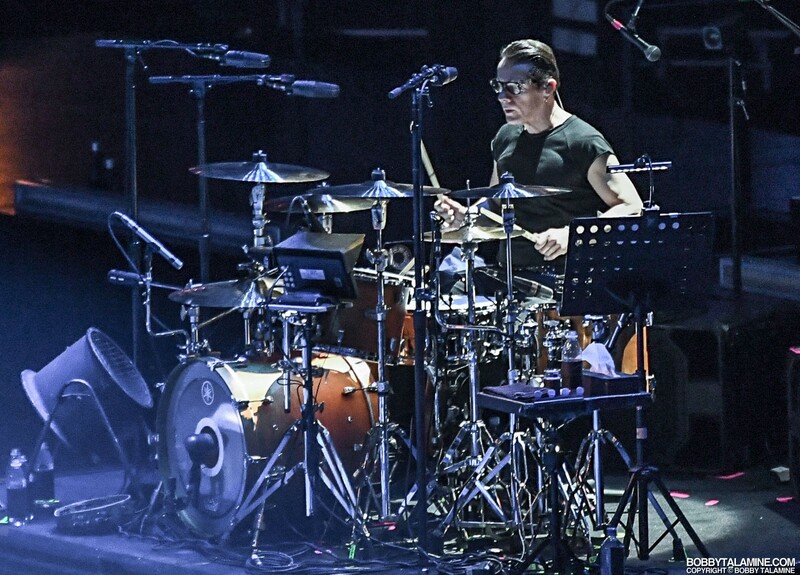 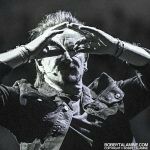 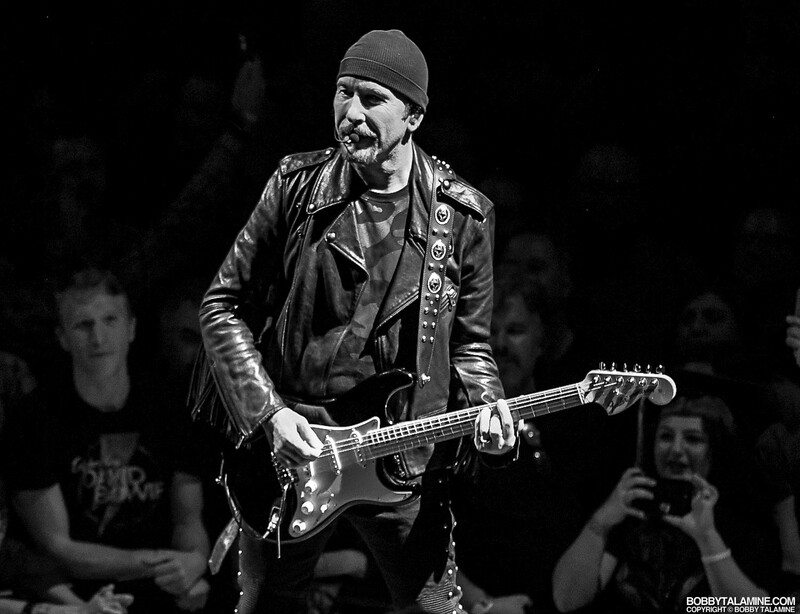 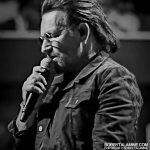 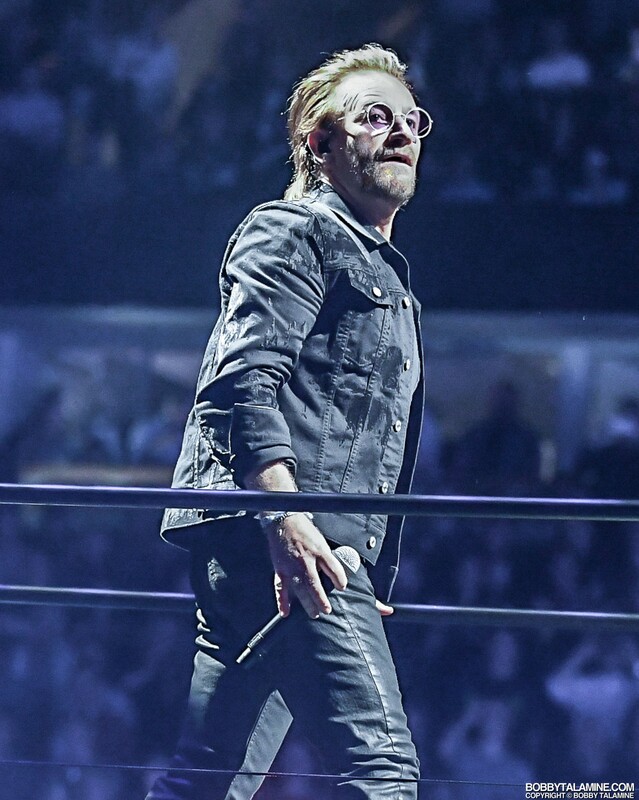 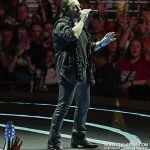 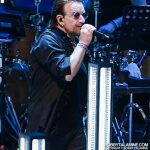 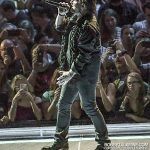 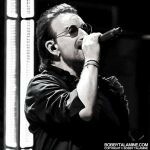 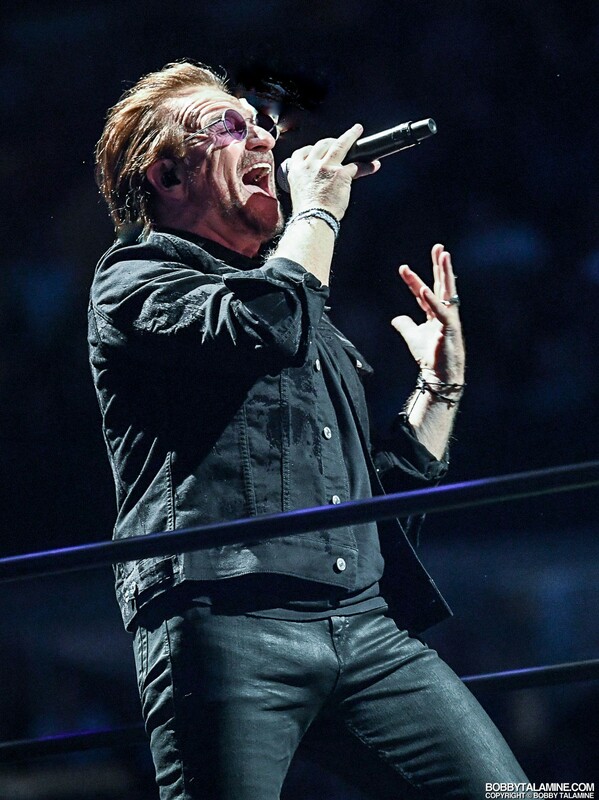 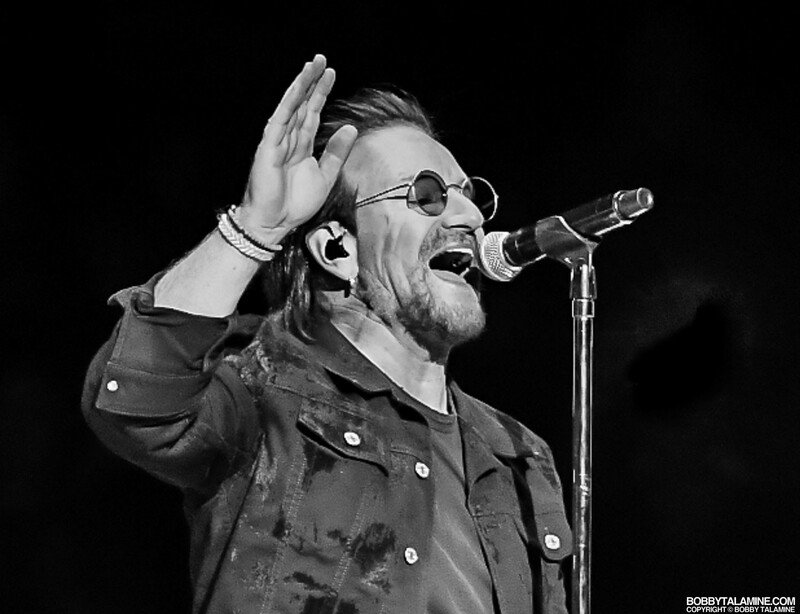 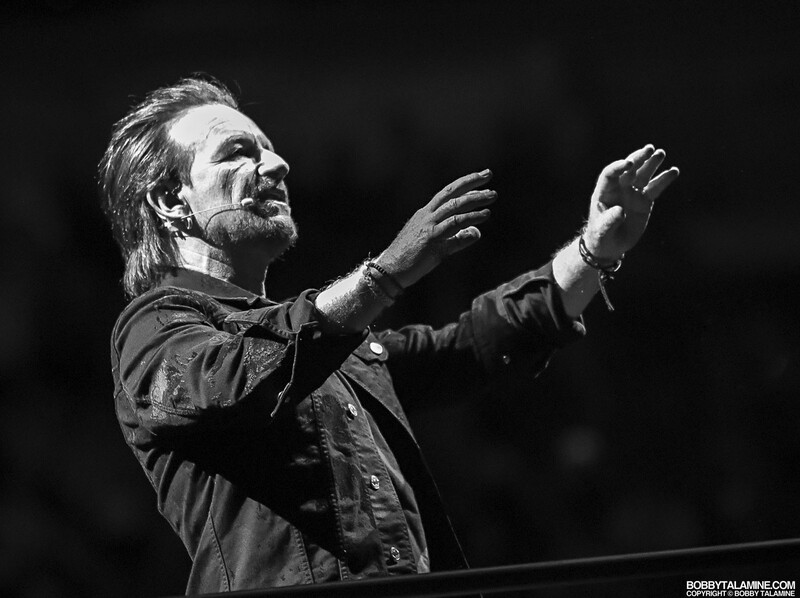 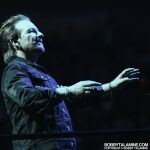 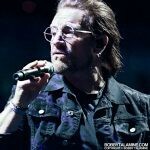 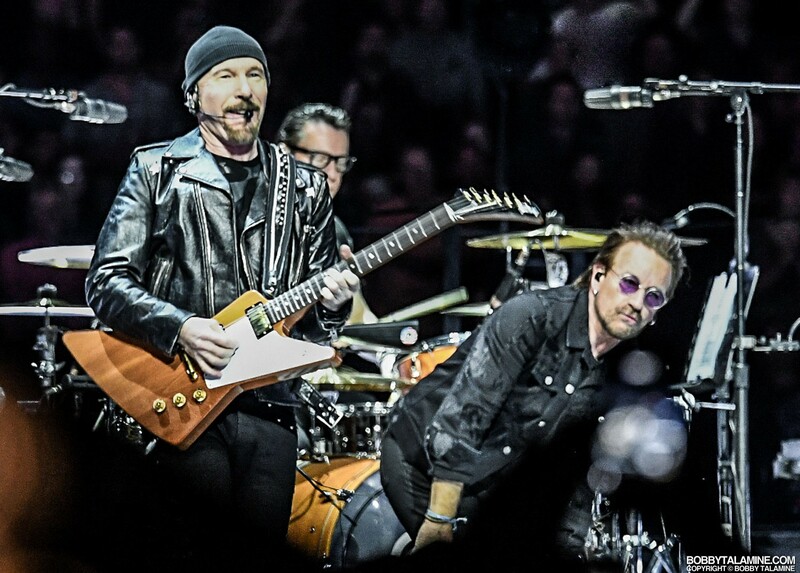 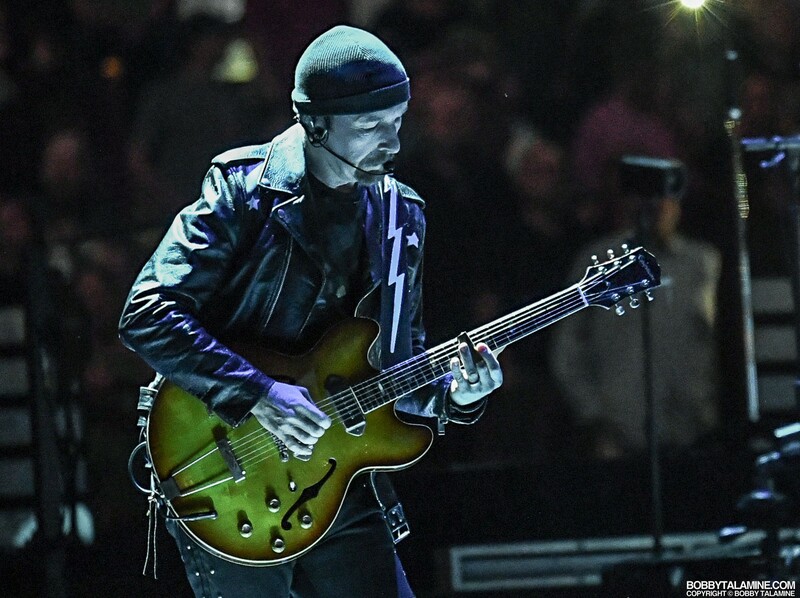 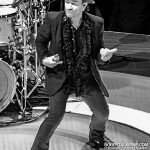 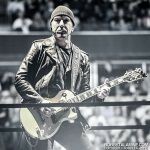 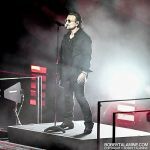 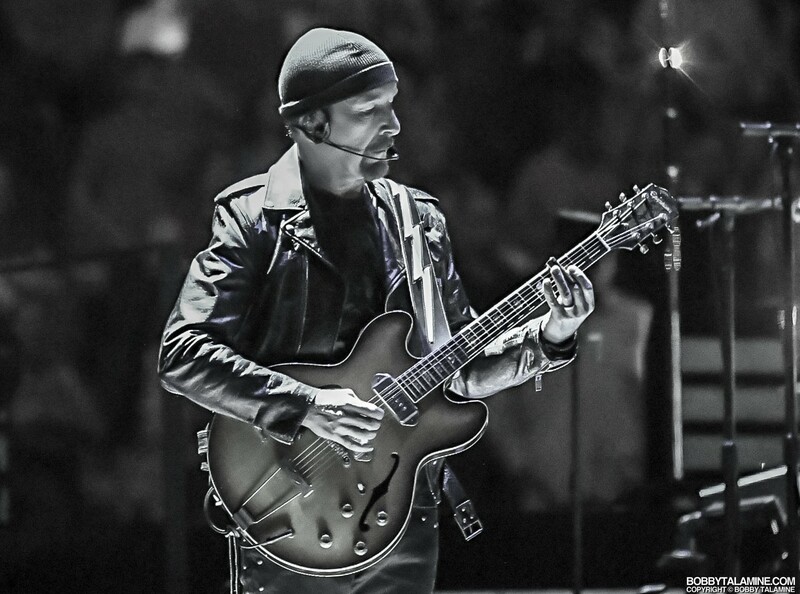 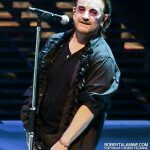 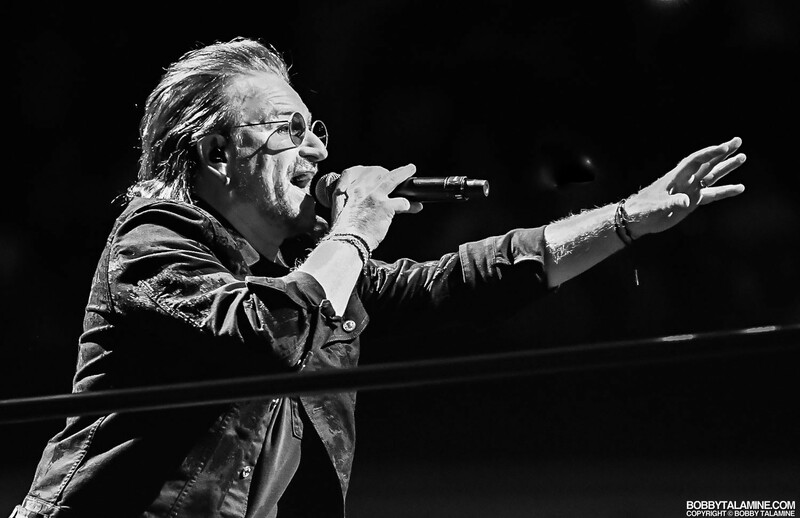 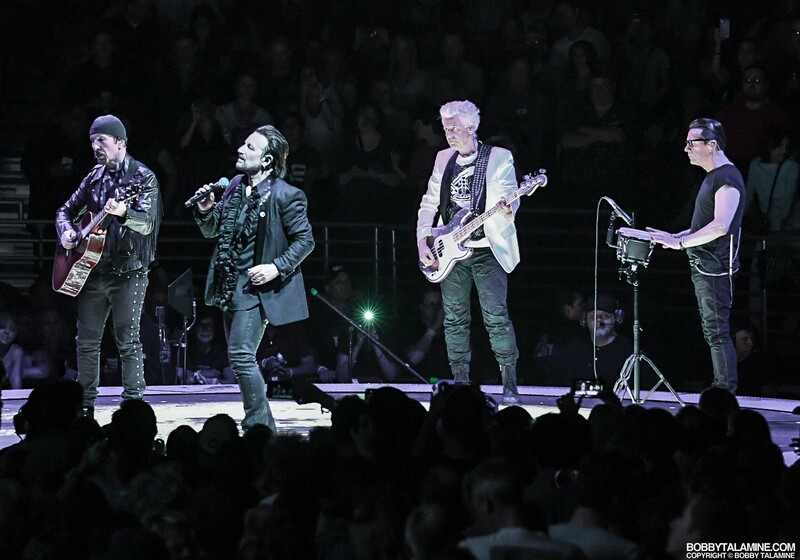 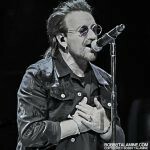 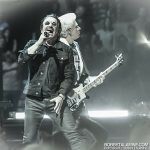 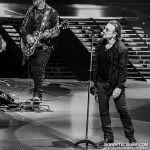 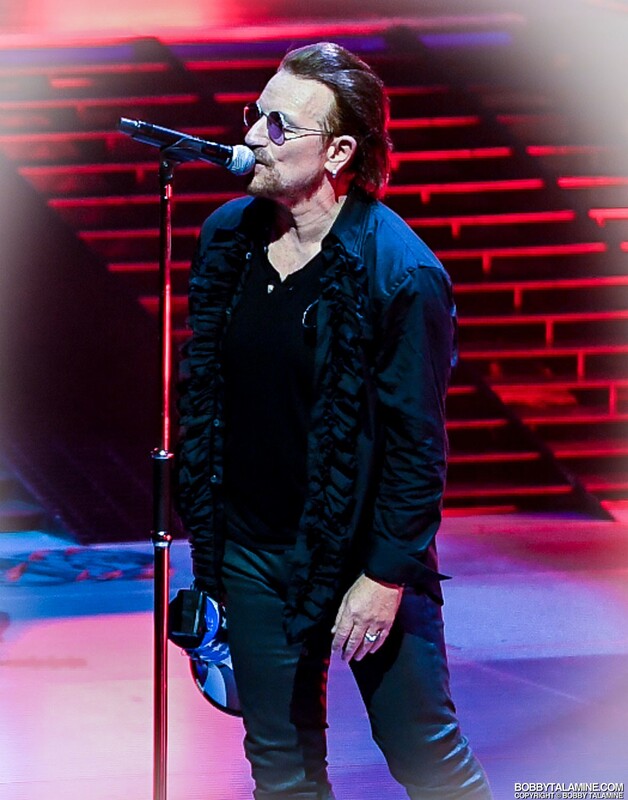 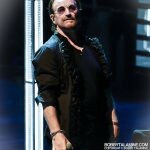 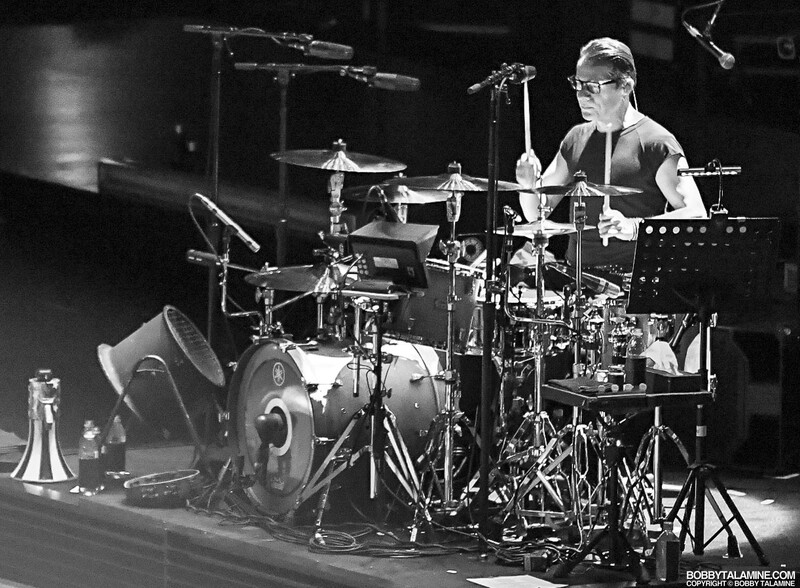 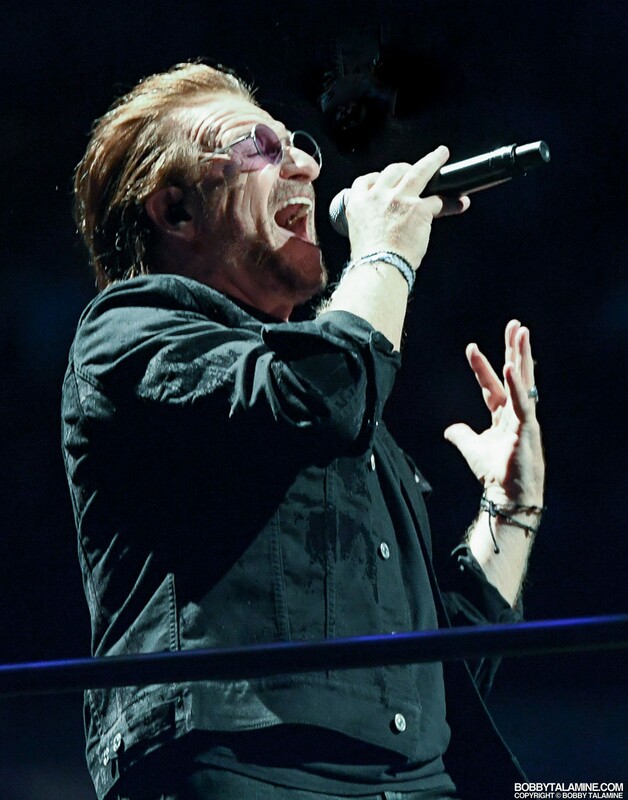 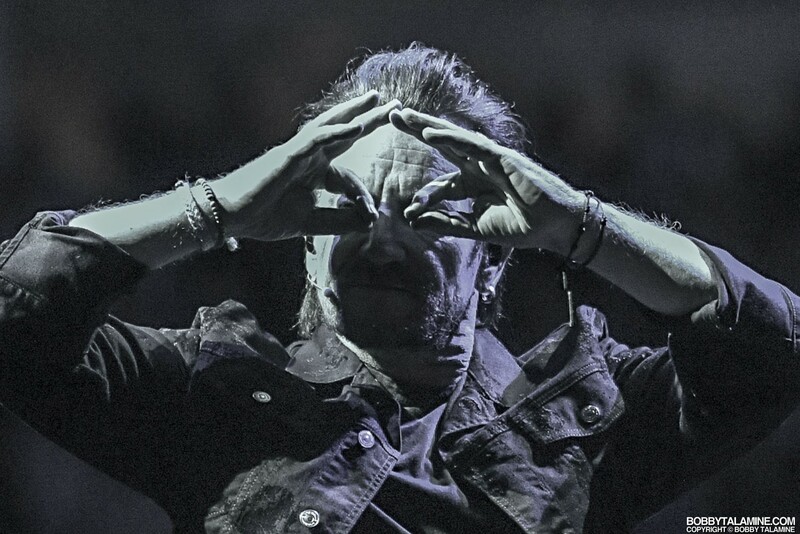 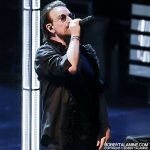 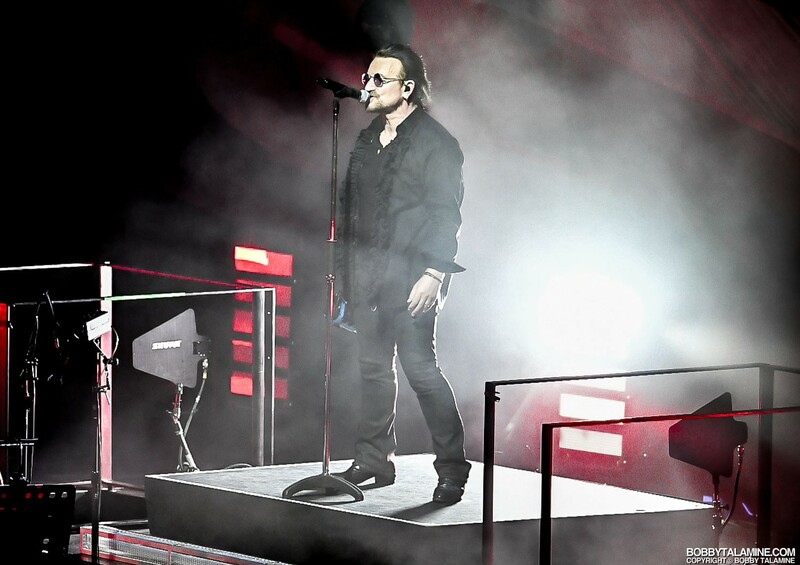 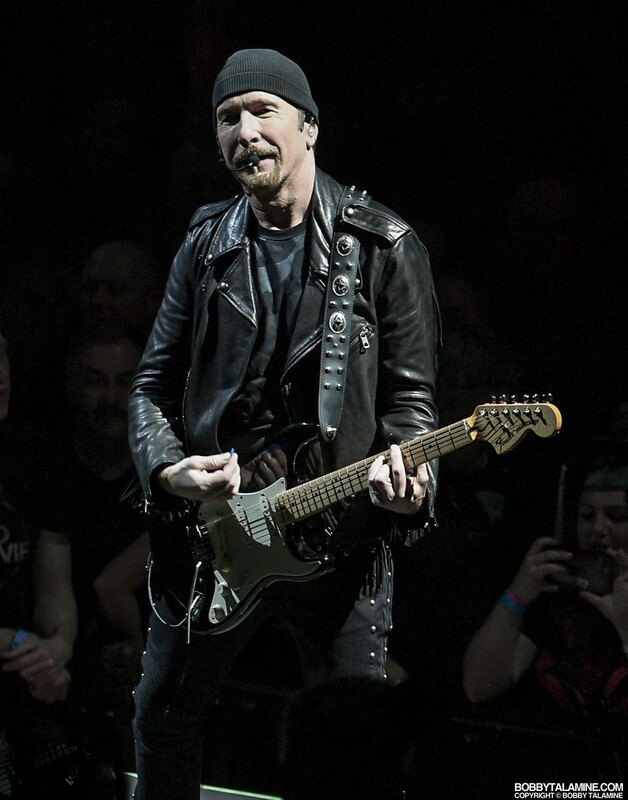 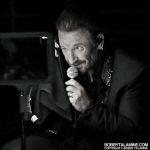 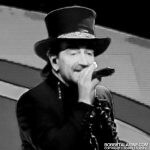 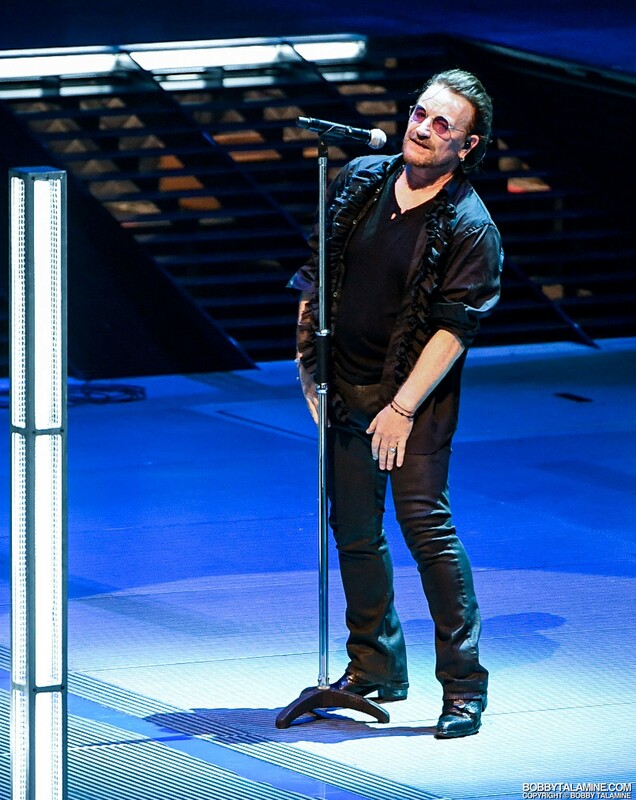 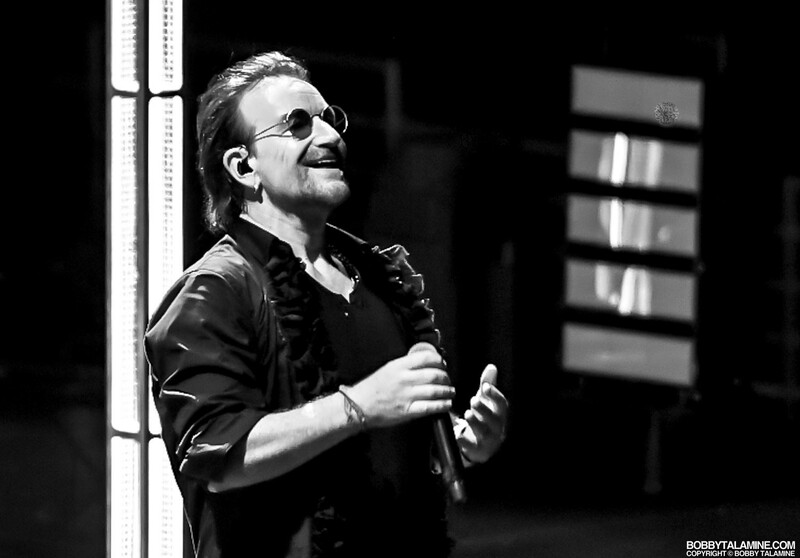 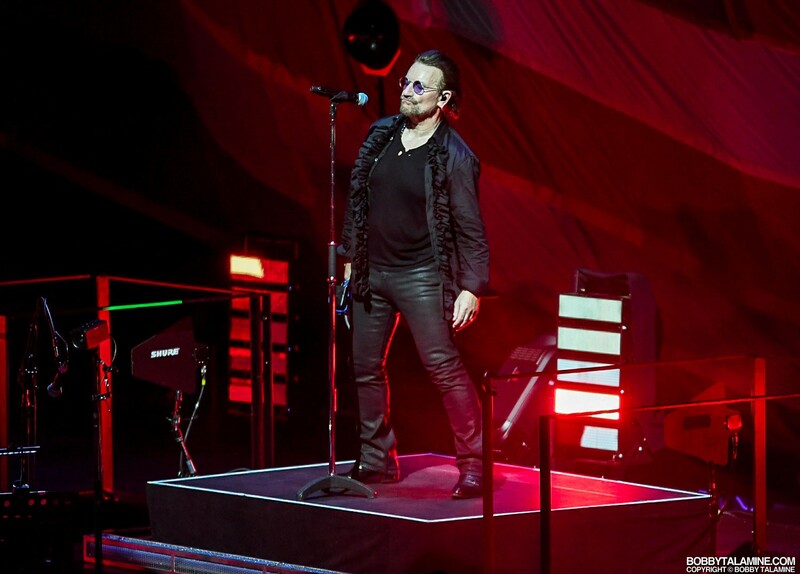 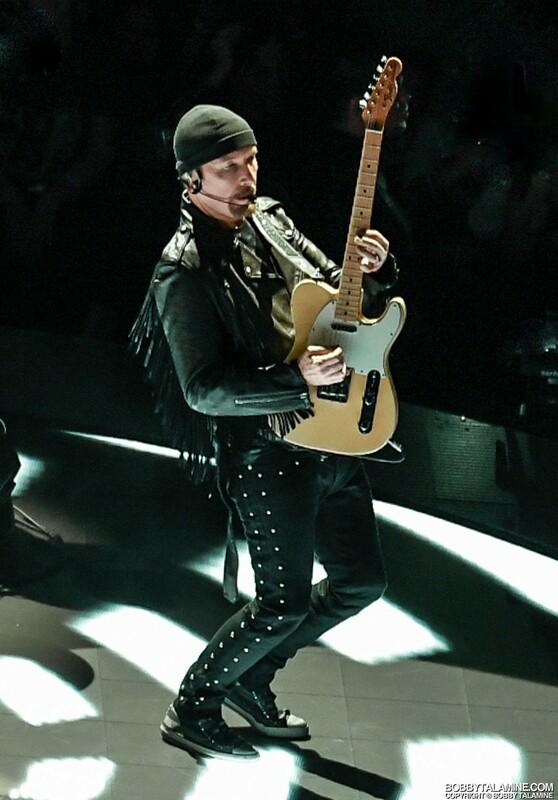 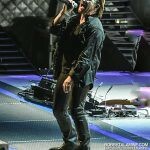 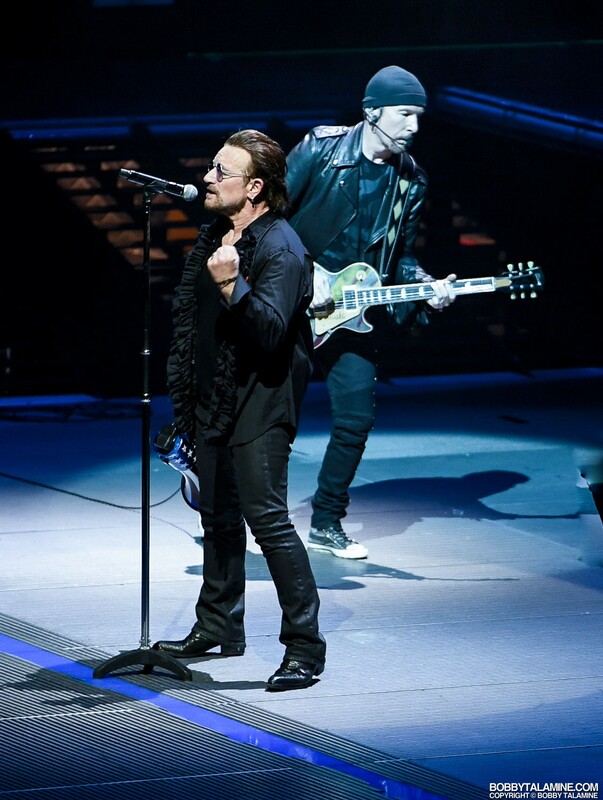 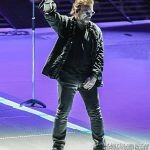 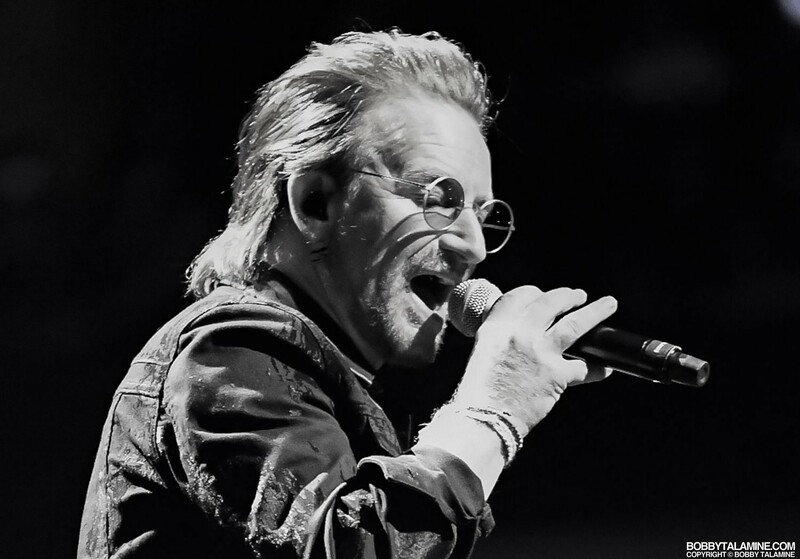 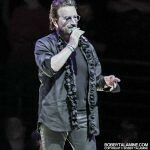 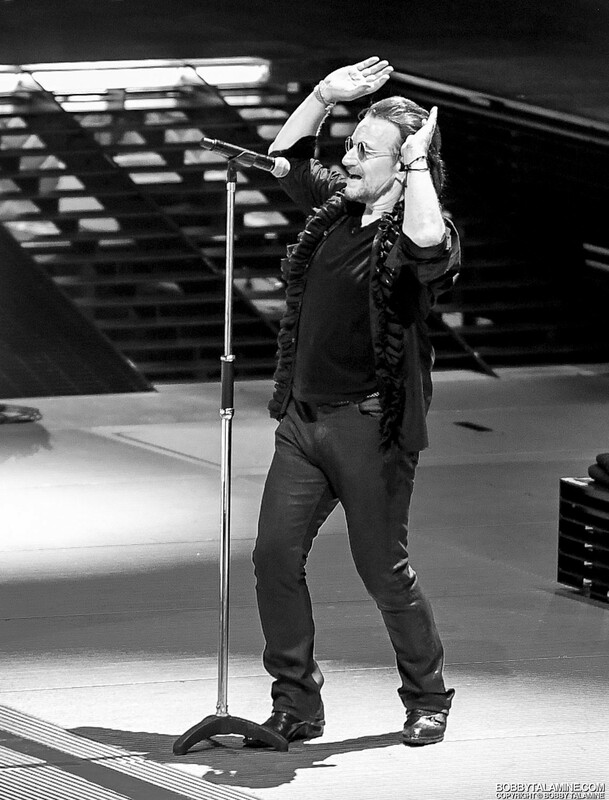 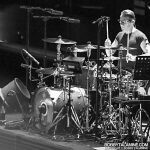 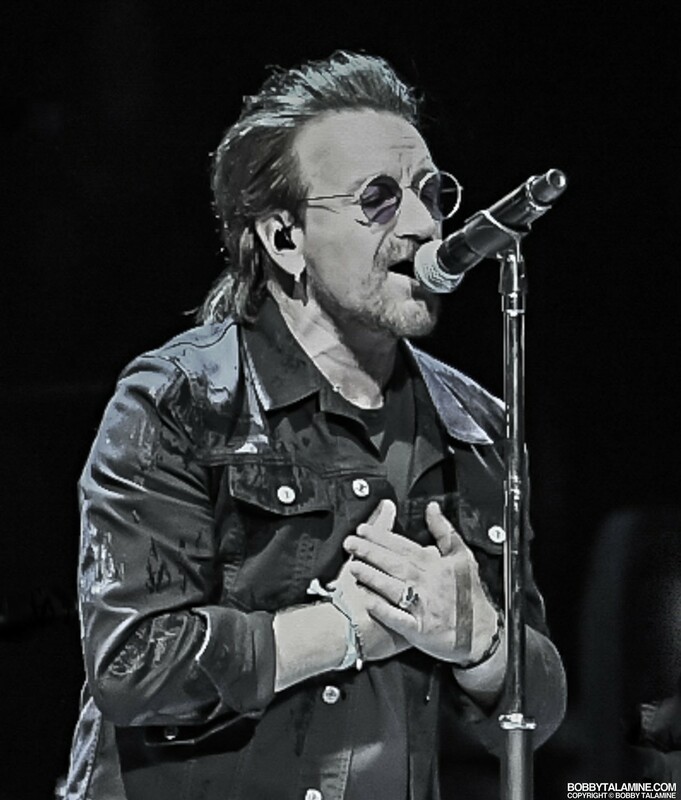 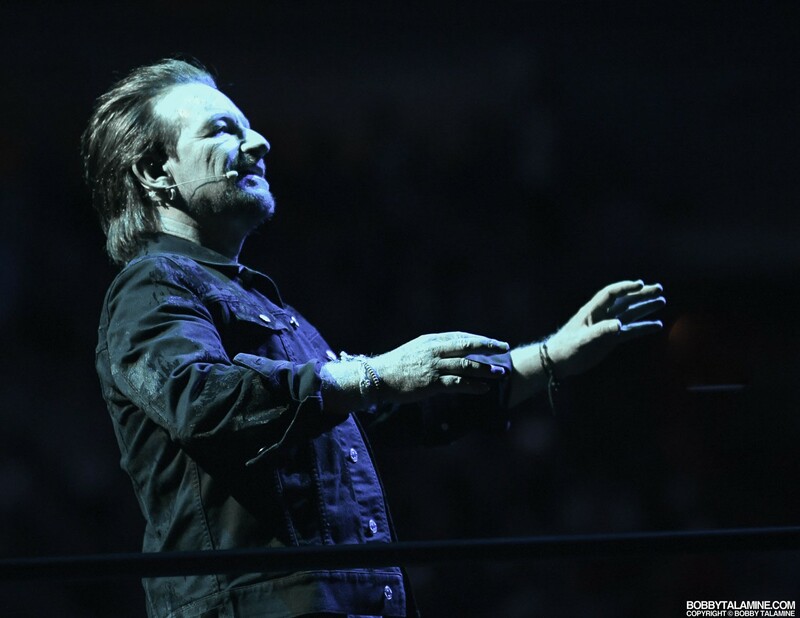 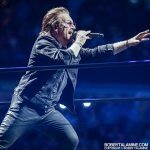 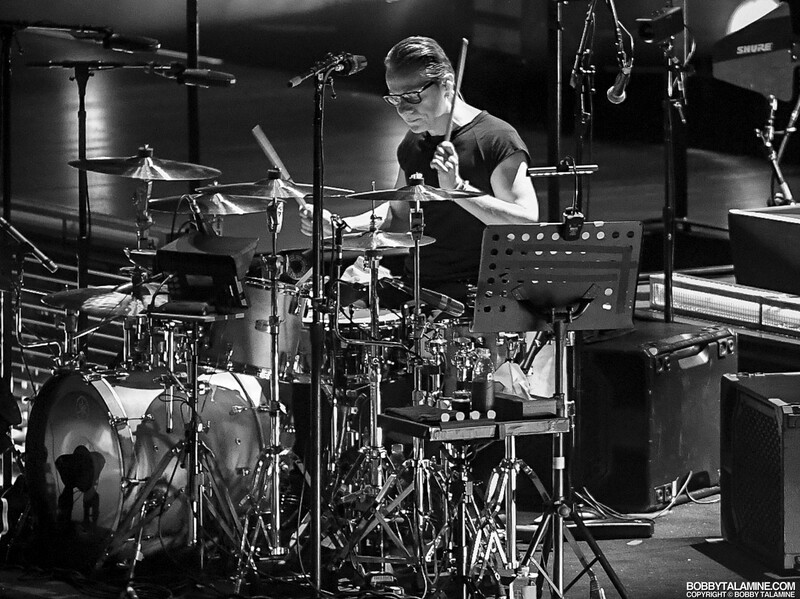 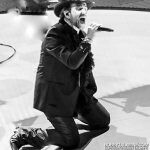 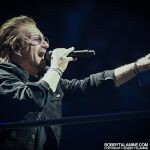 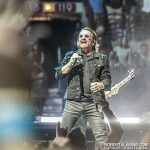 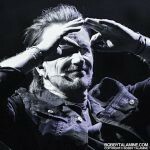 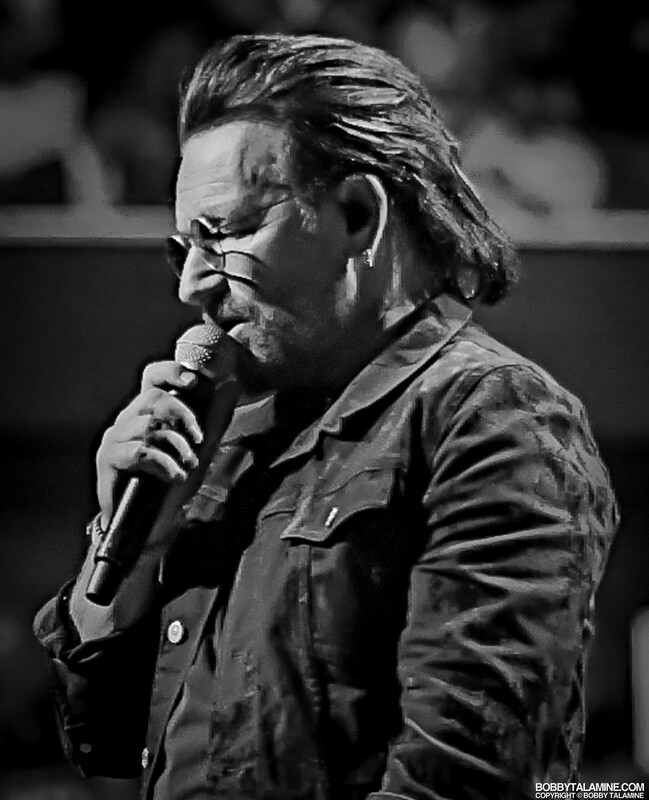 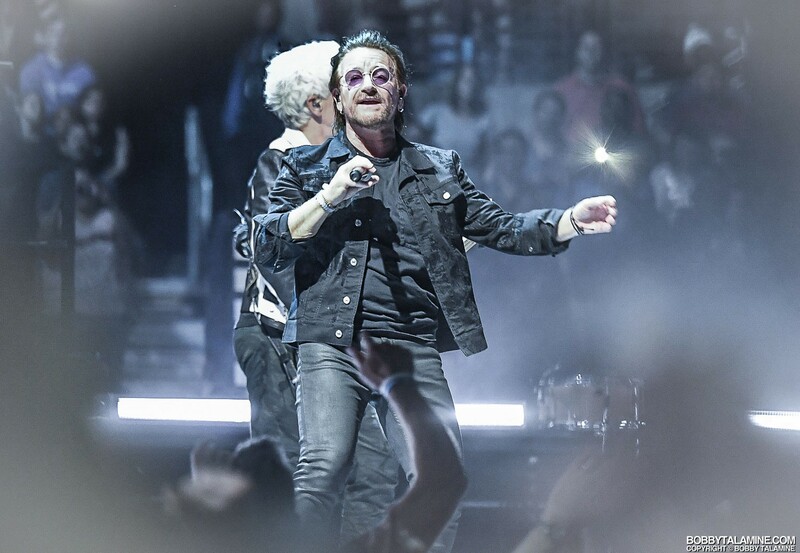 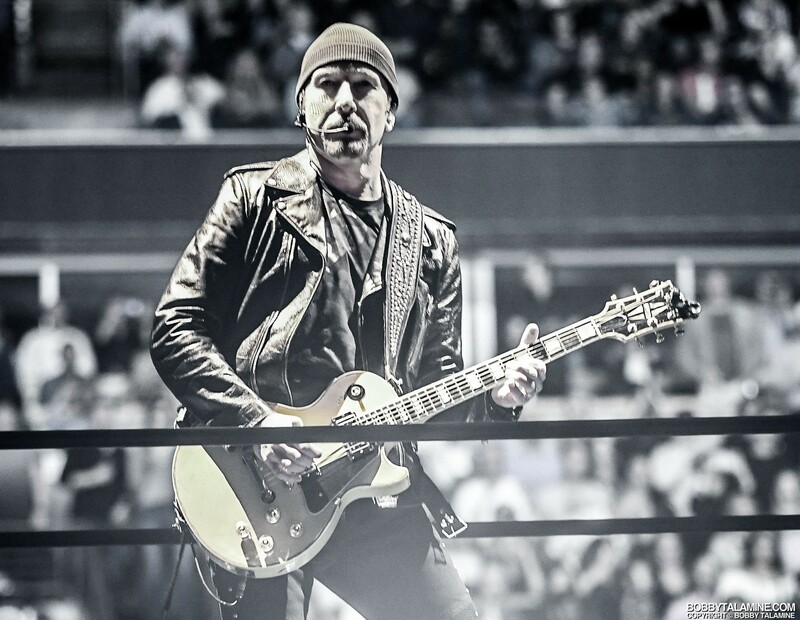 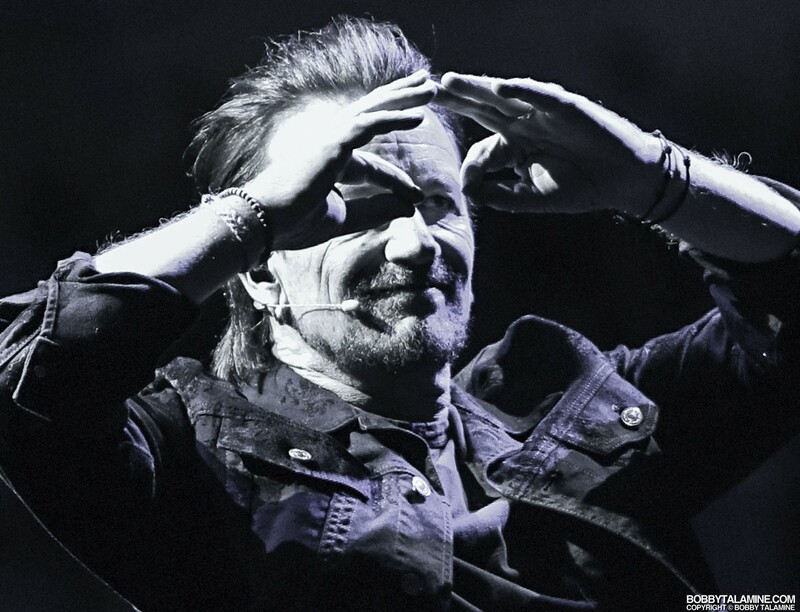 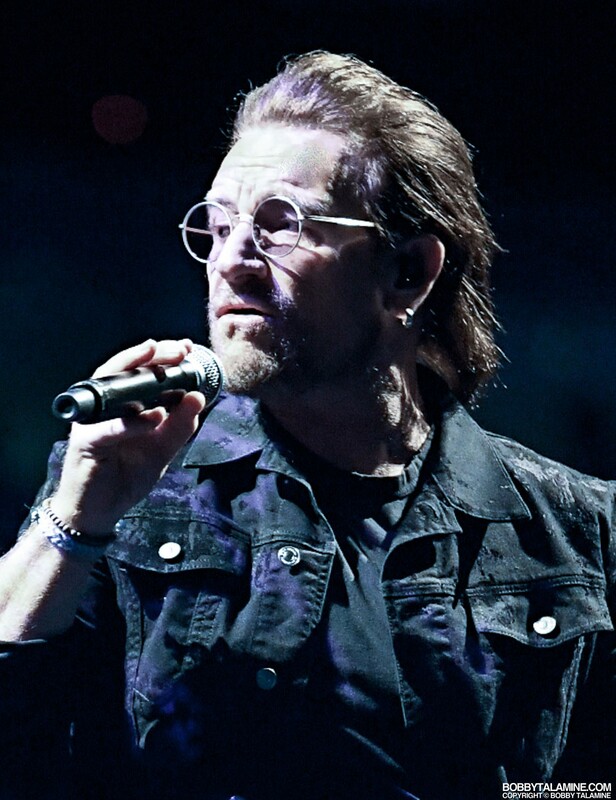 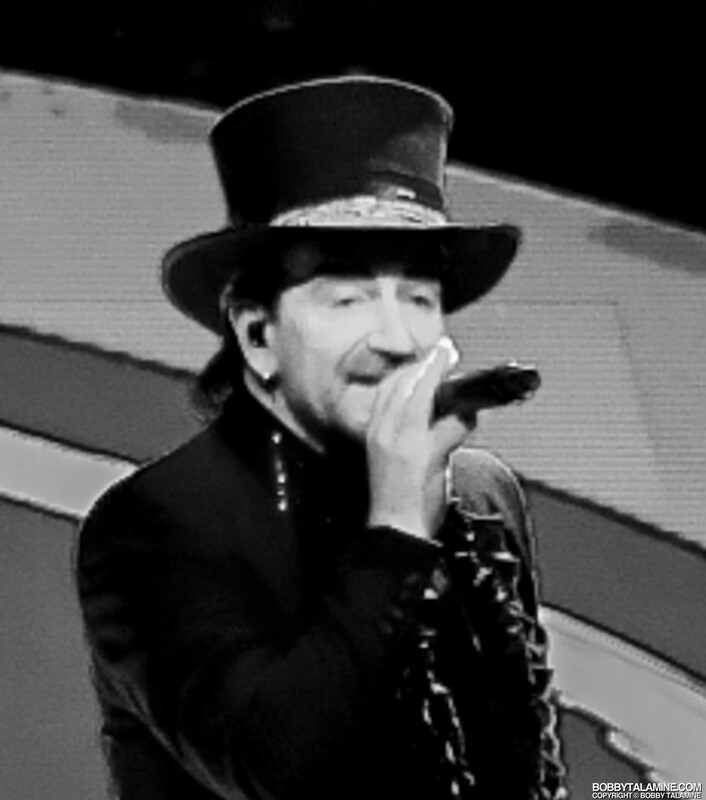 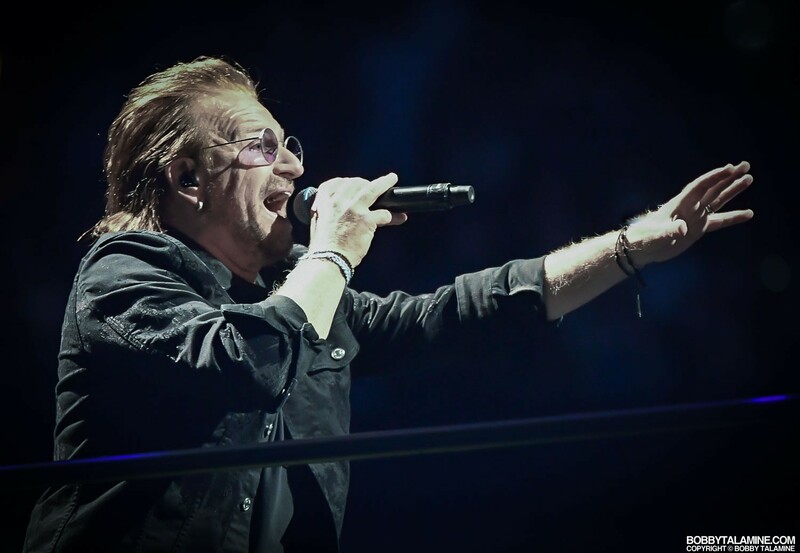 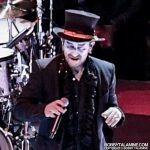 The heart of the show, the meat of the show is the first seven song block, devoted to Bono’s childhood and the loss of his mother at an early age, during a very turbulent time in Northern Ireland. 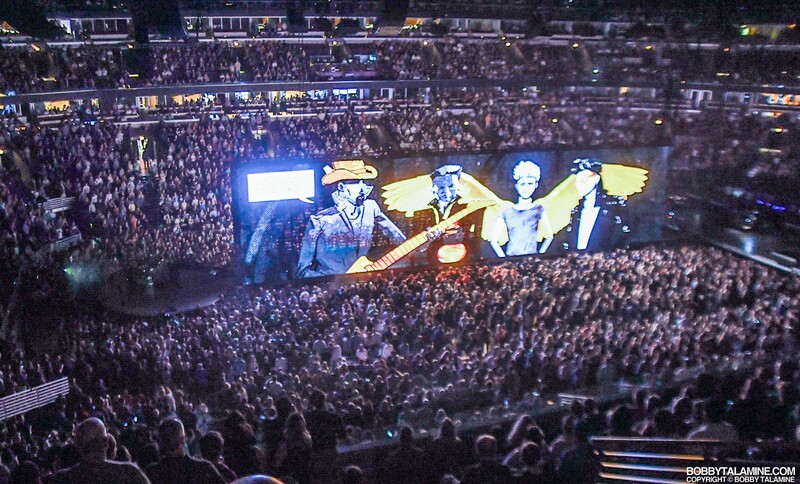 Although technically this is identical to the show which was at the United Center from three years ago, no matter. 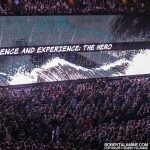 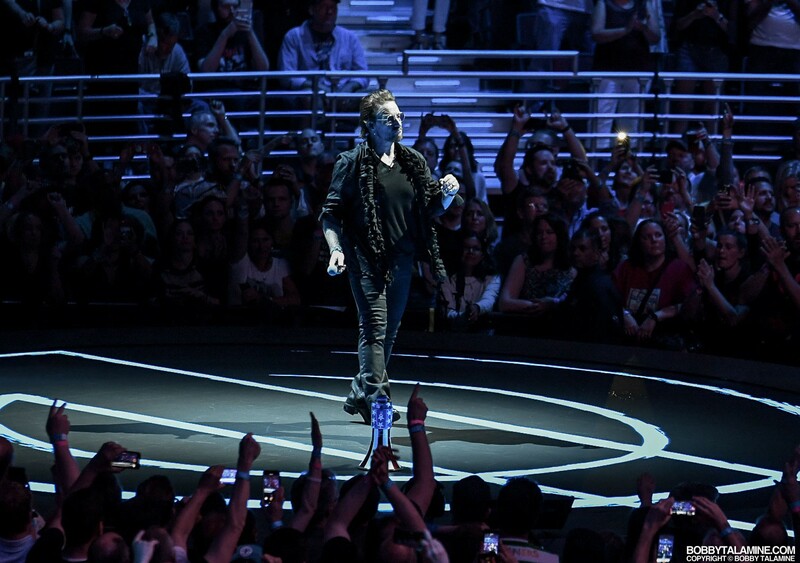 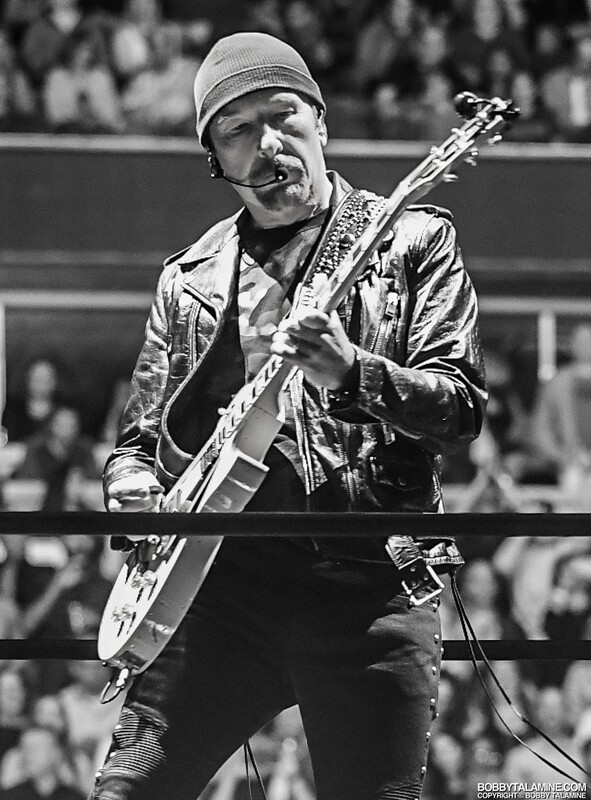 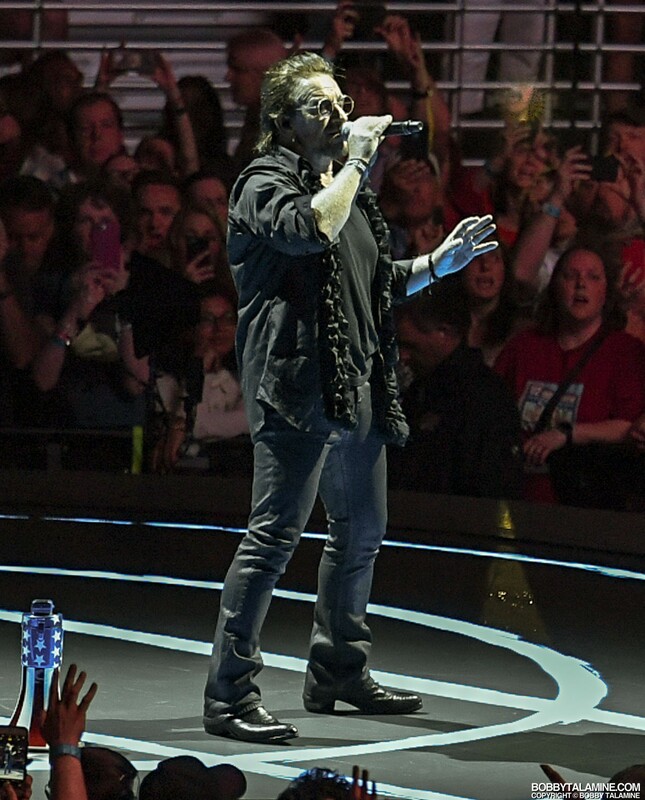 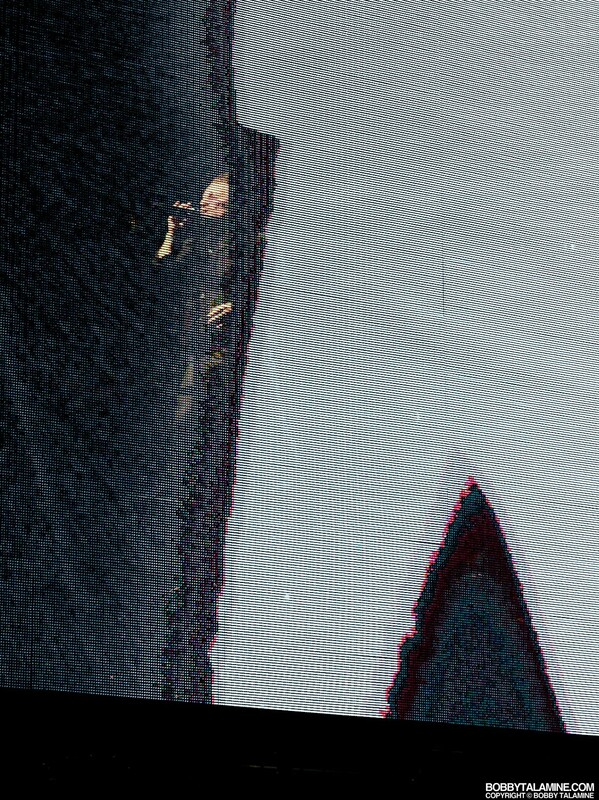 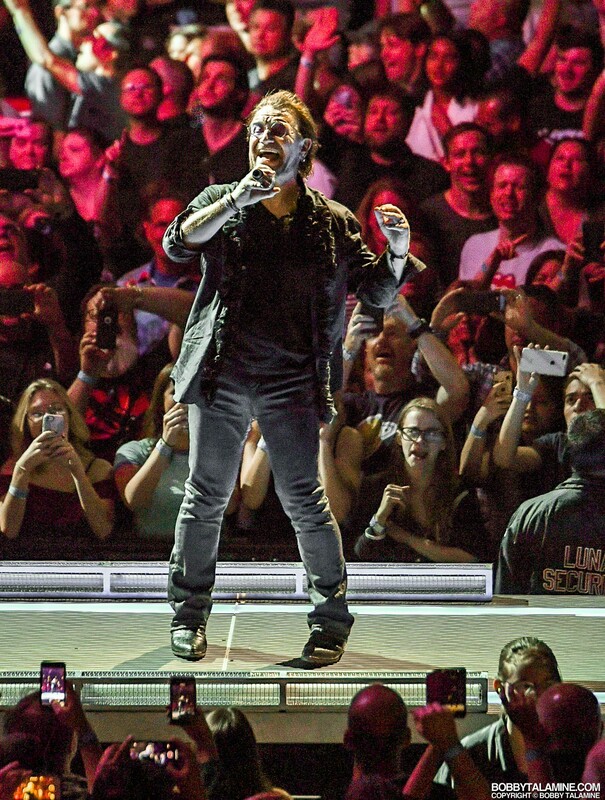 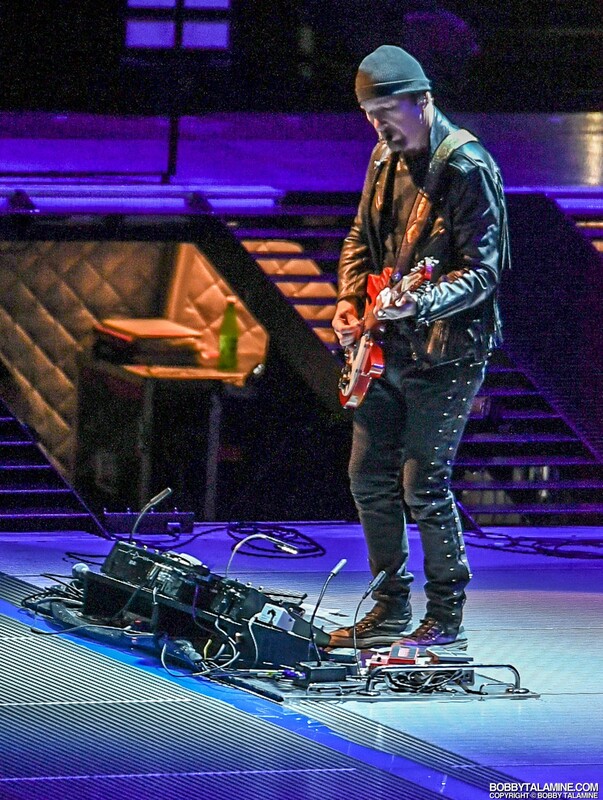 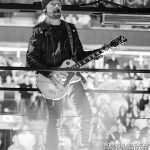 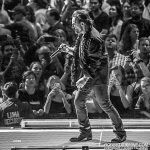 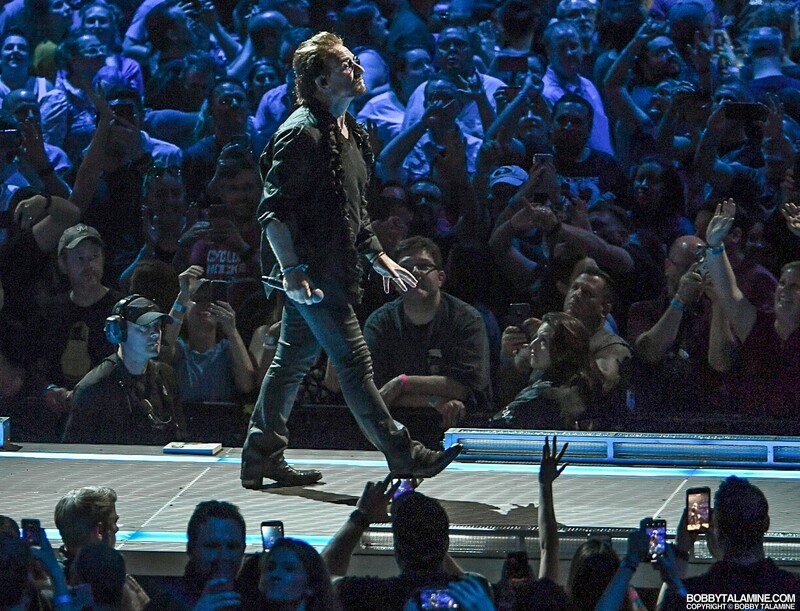 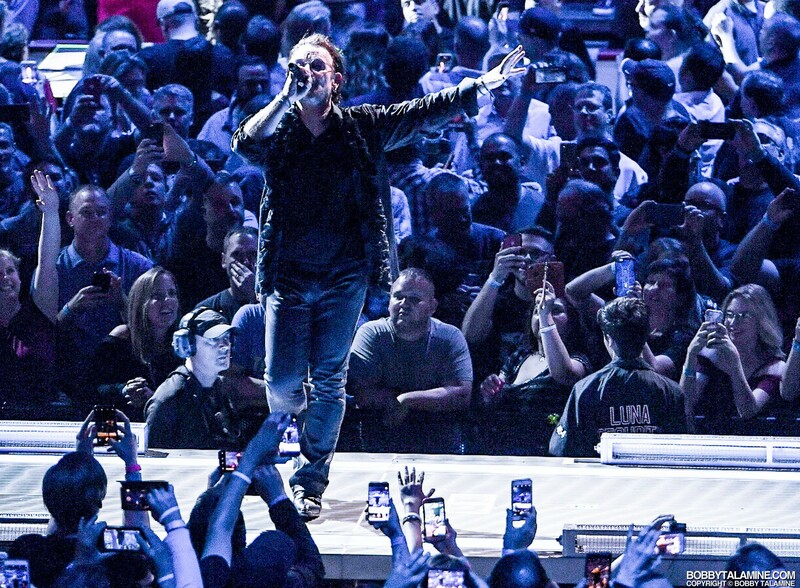 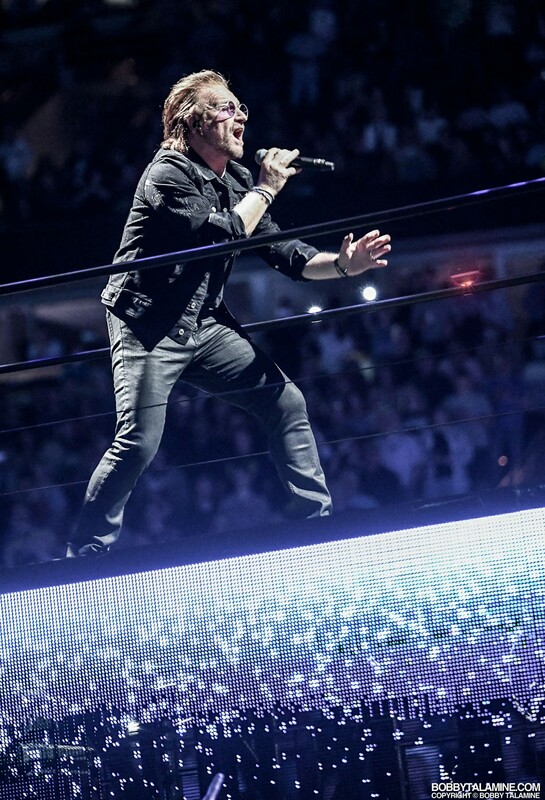 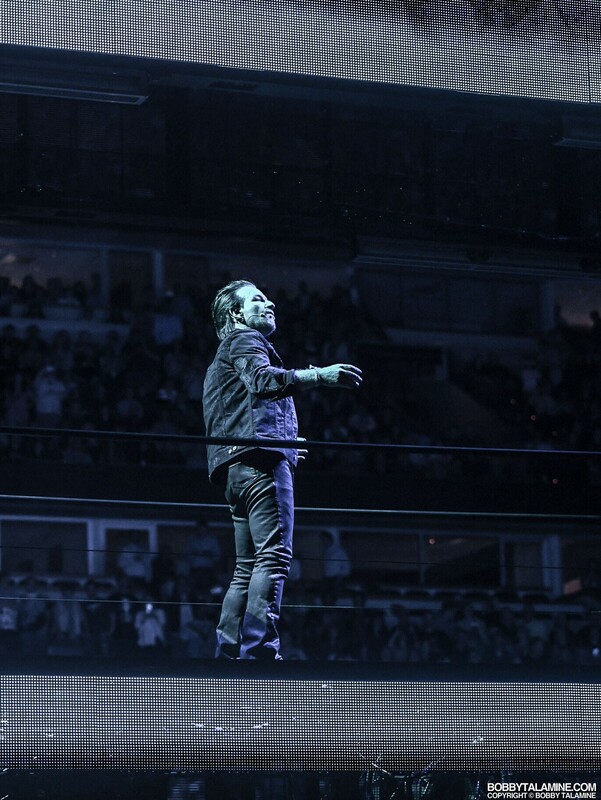 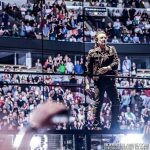 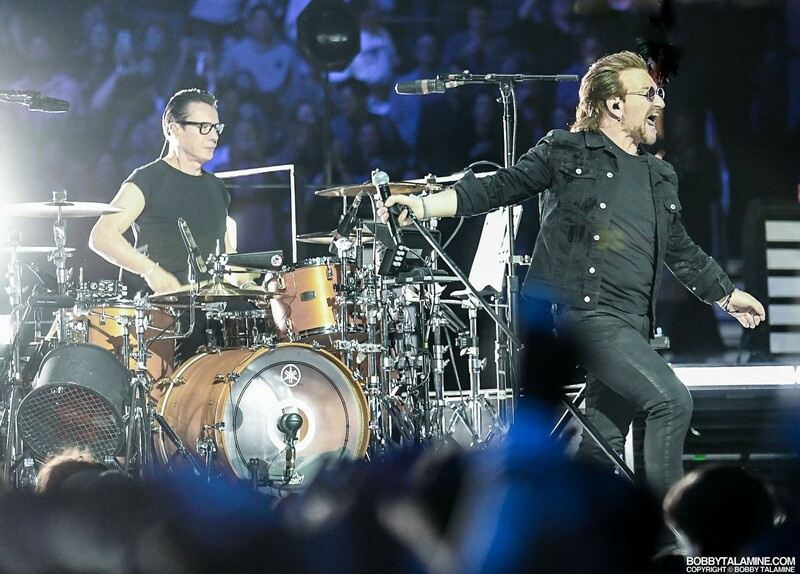 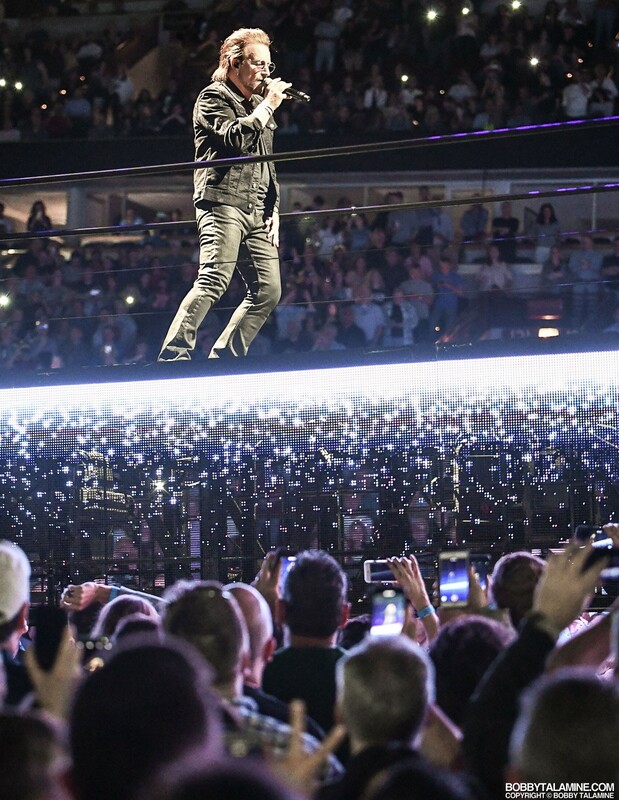 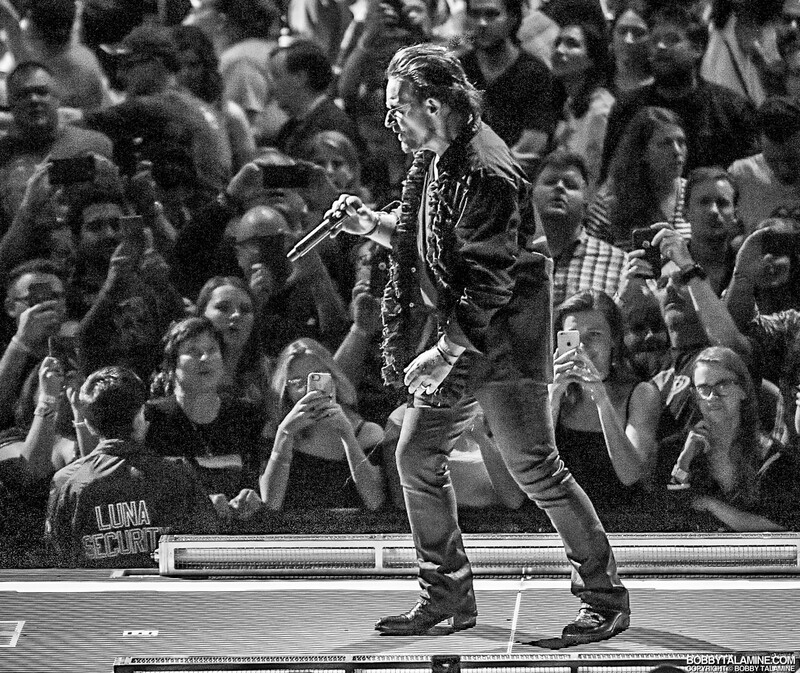 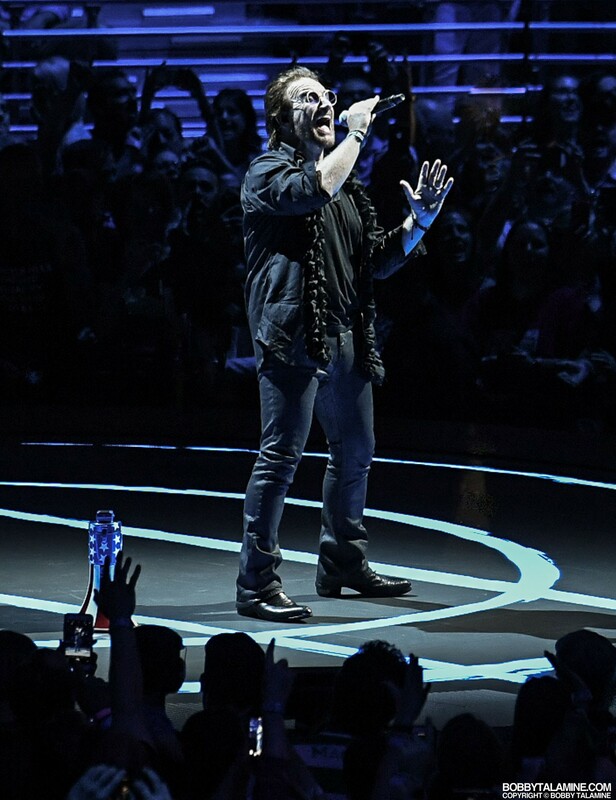 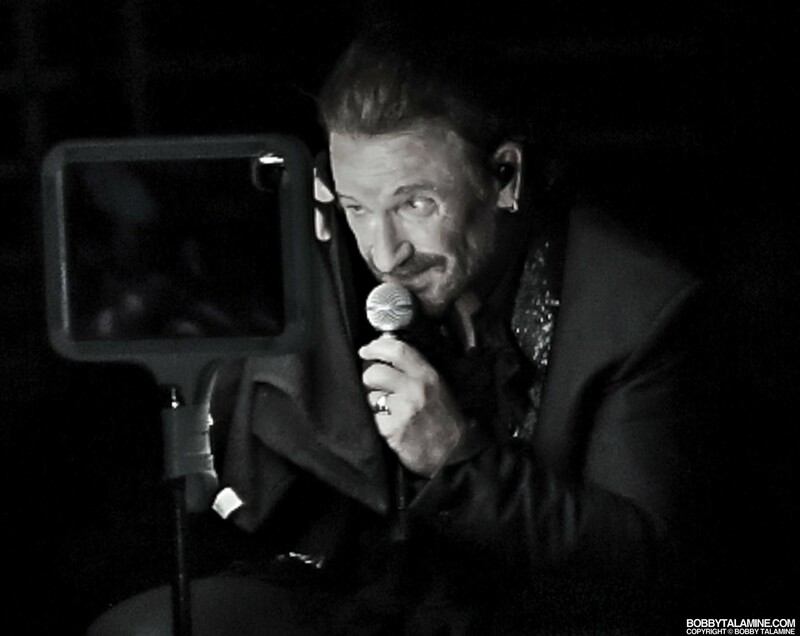 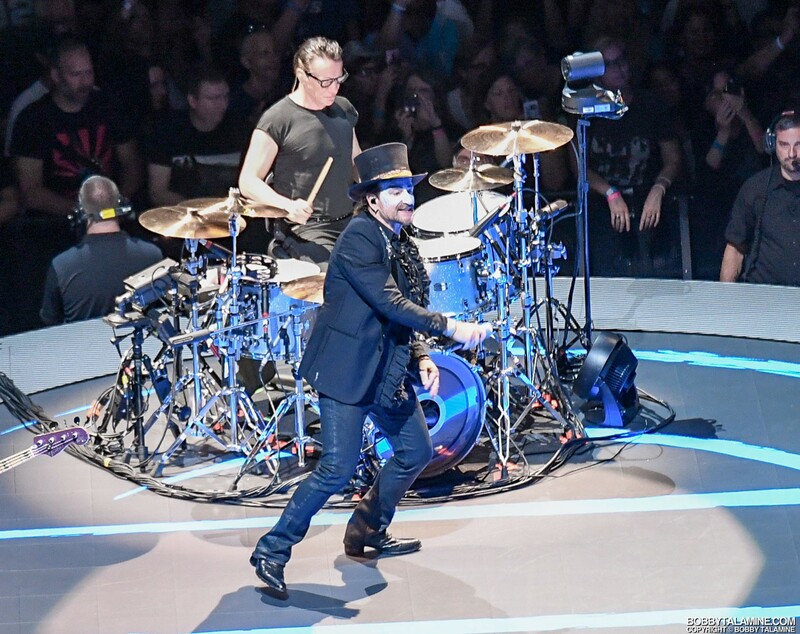 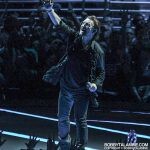 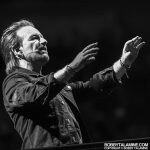 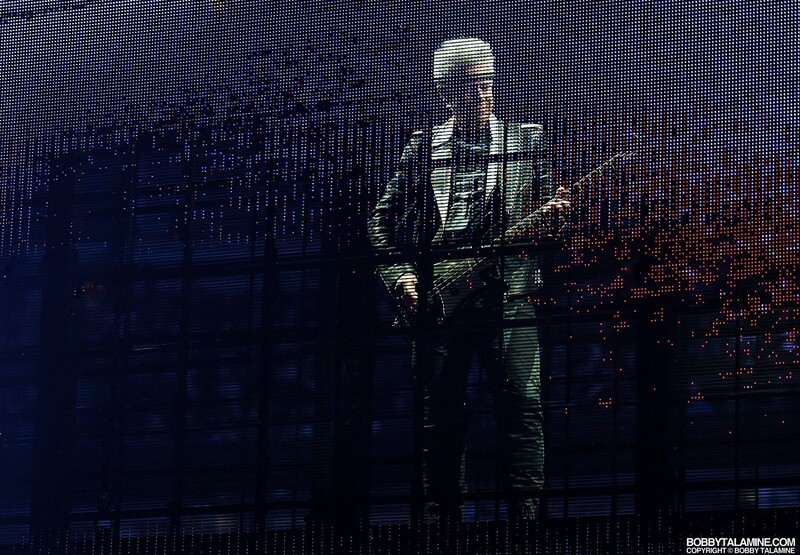 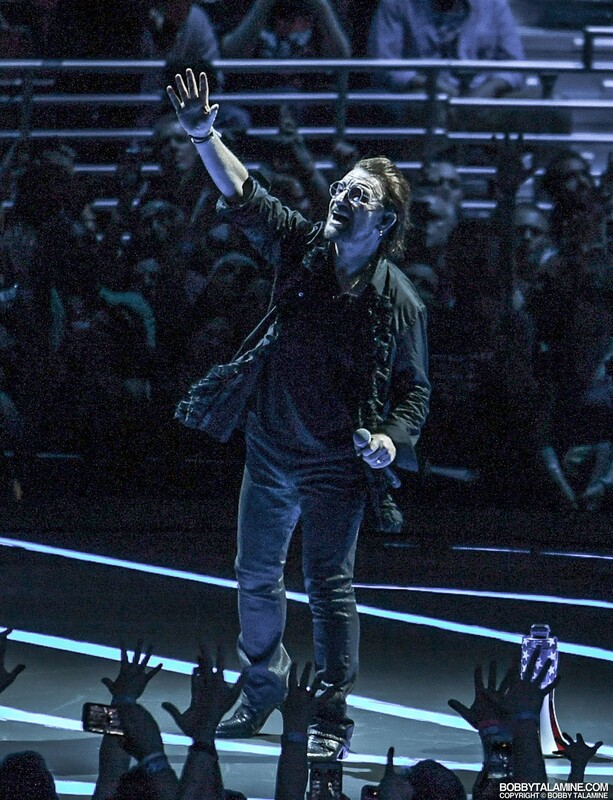 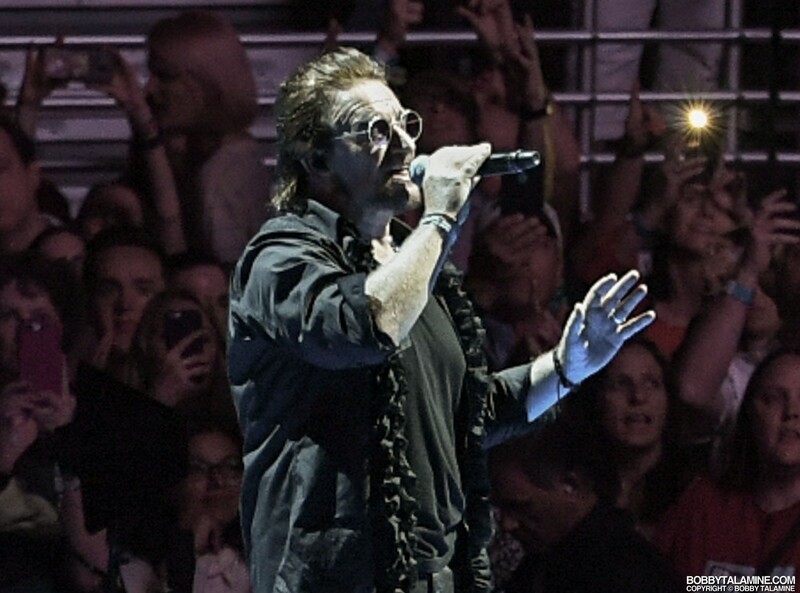 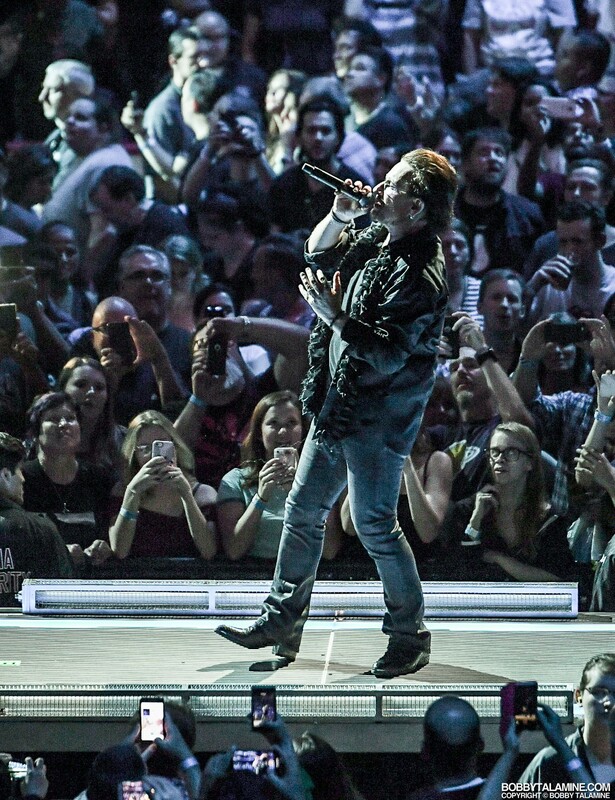 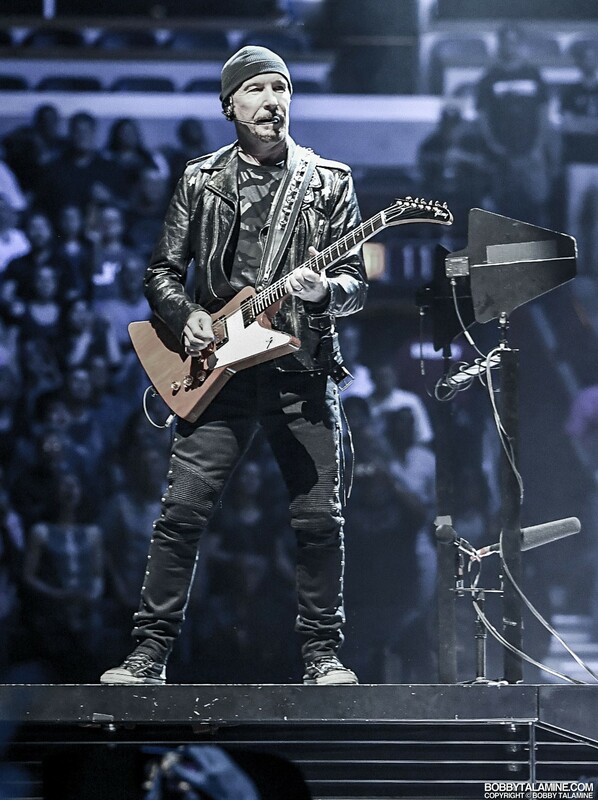 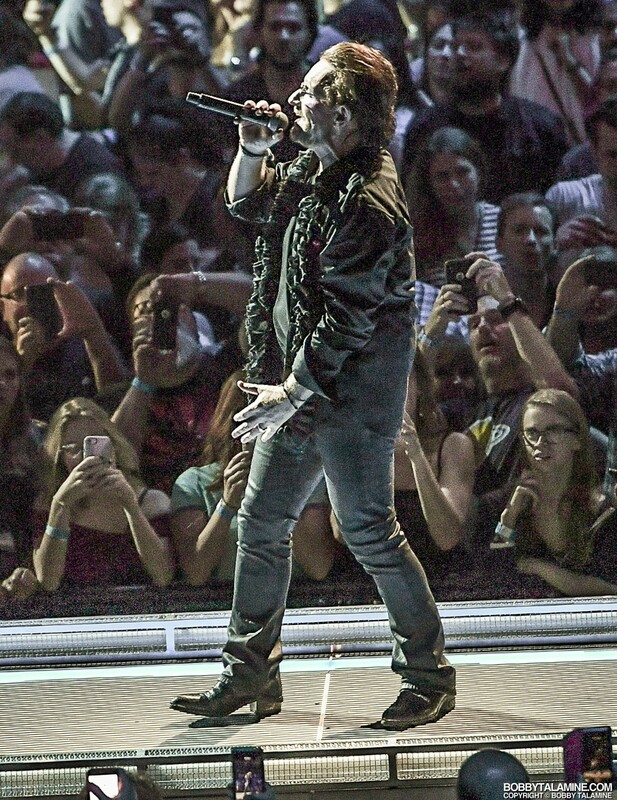 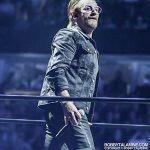 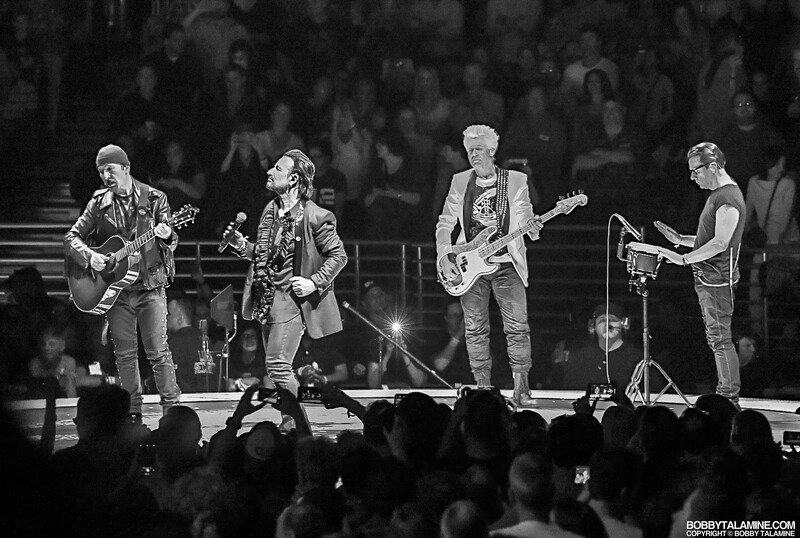 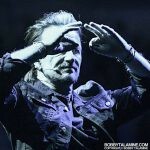 to lose this part of the show, to edit it or delete it completely would’ve been a huge mistake, simply because the show at this point is deeply personal to Bono, and also it builds from there when the LED screen is lifted, and getting the setlist to a more celebratory feel. 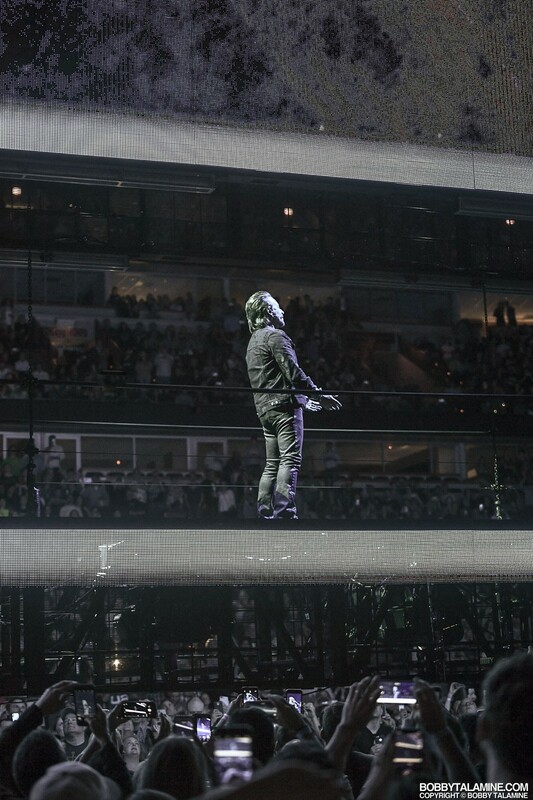 There’s a story to tell from beginning to end, and you better listen intently. 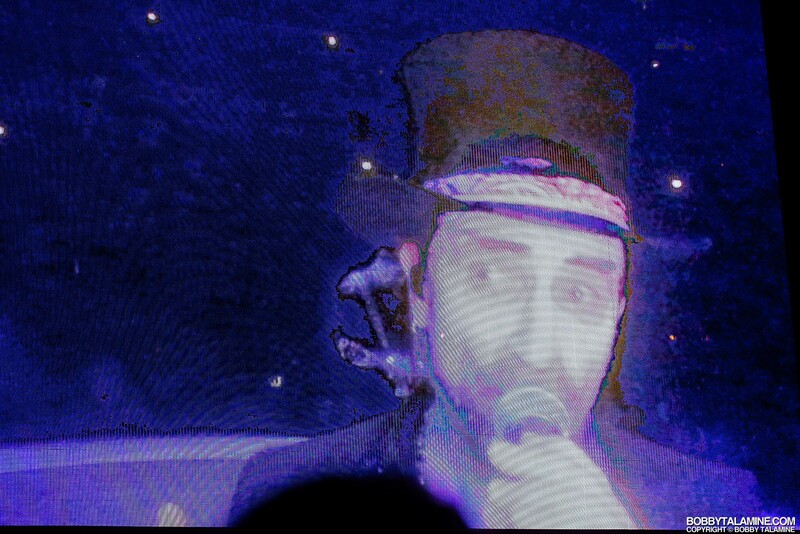 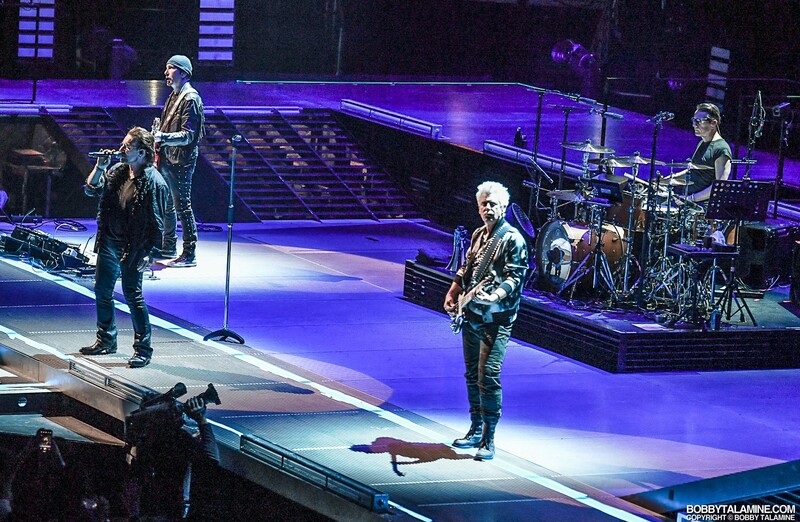 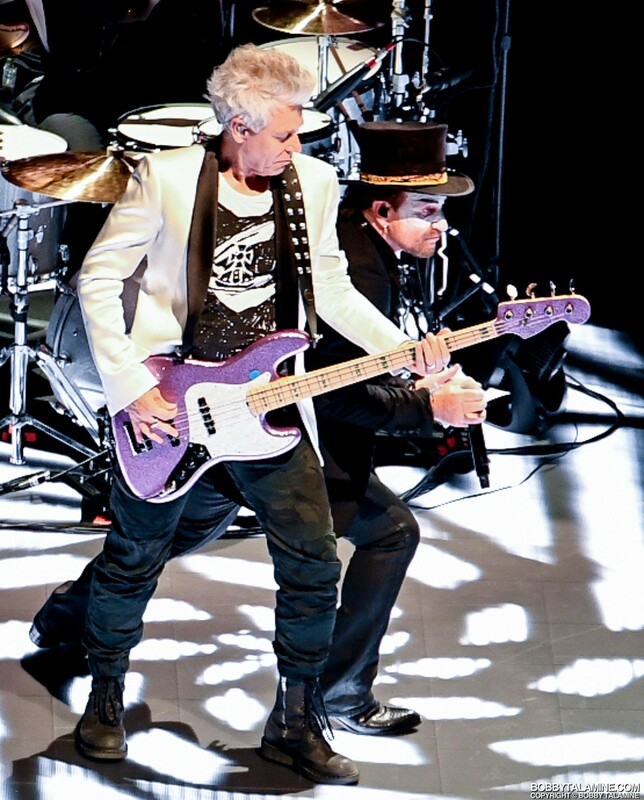 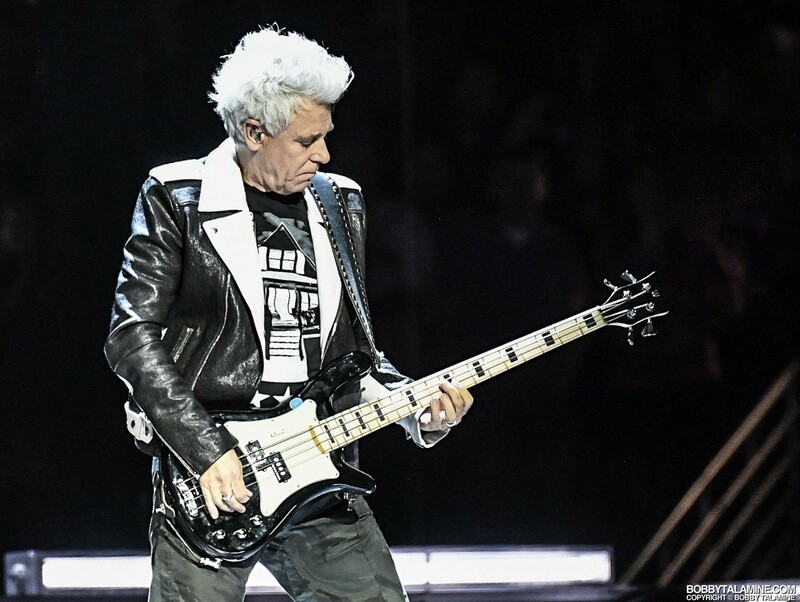 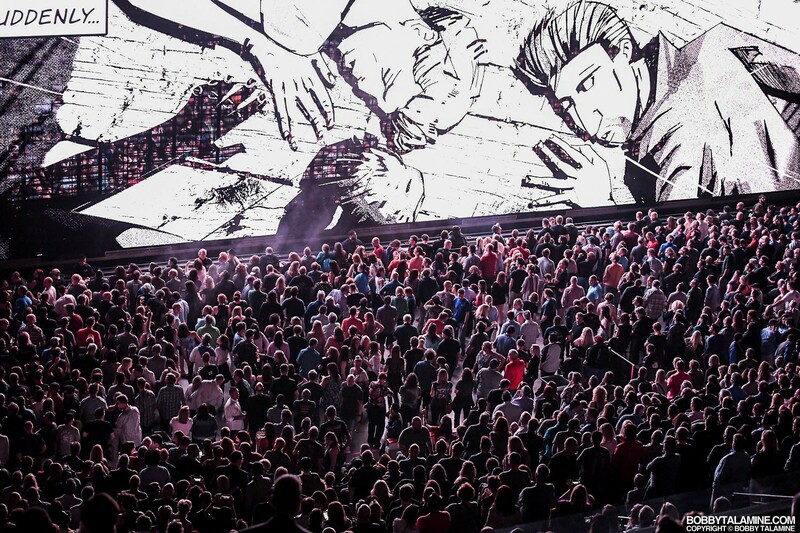 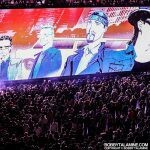 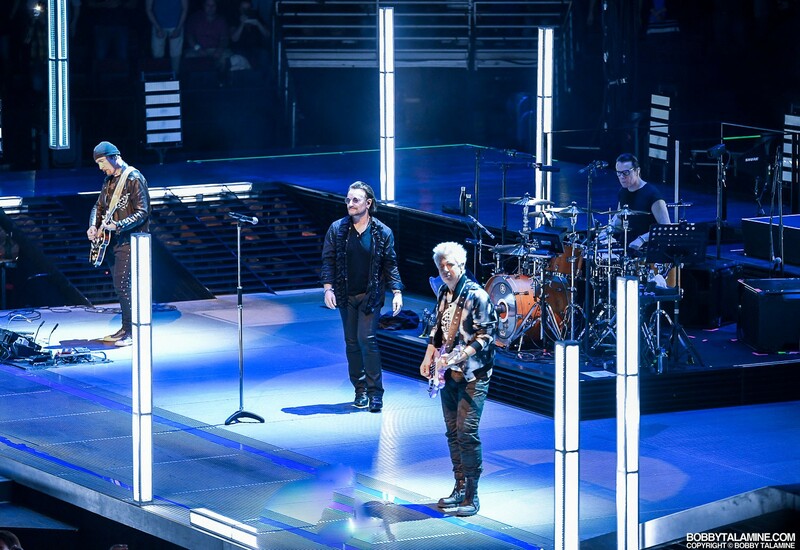 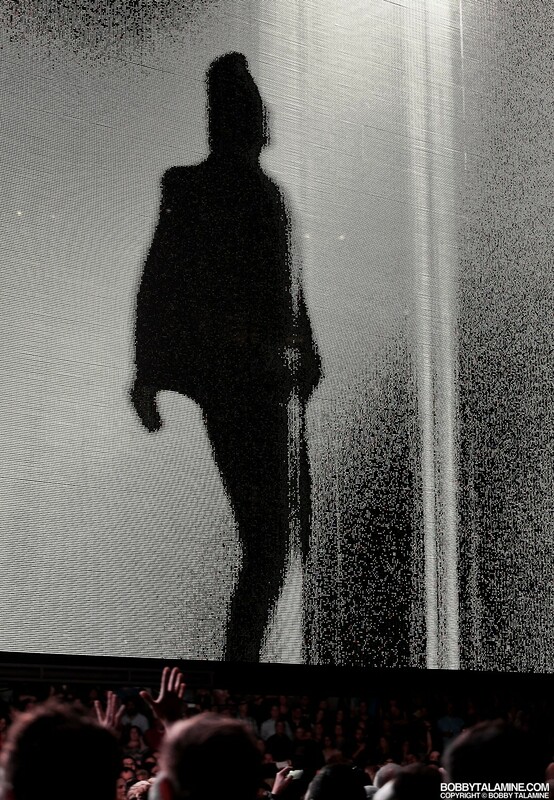 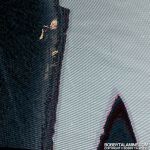 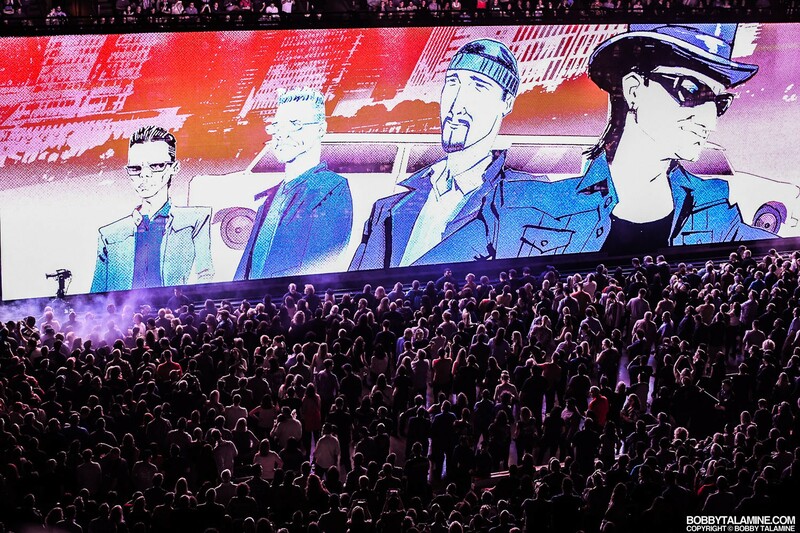 After a brief intermission of sorts, comic book images of the boys appear on the LED, showing the band’s journey to massive popularity, and appearing as if they’re superheroes. 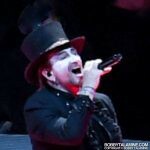 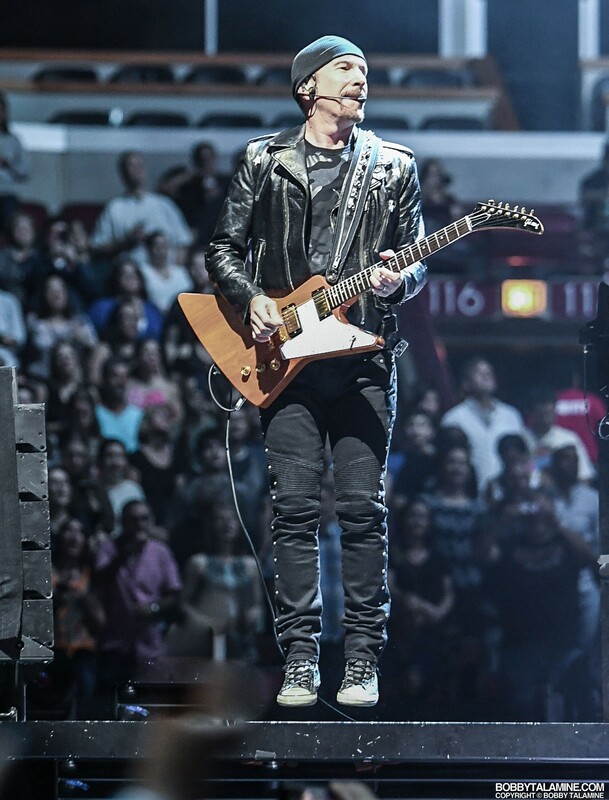 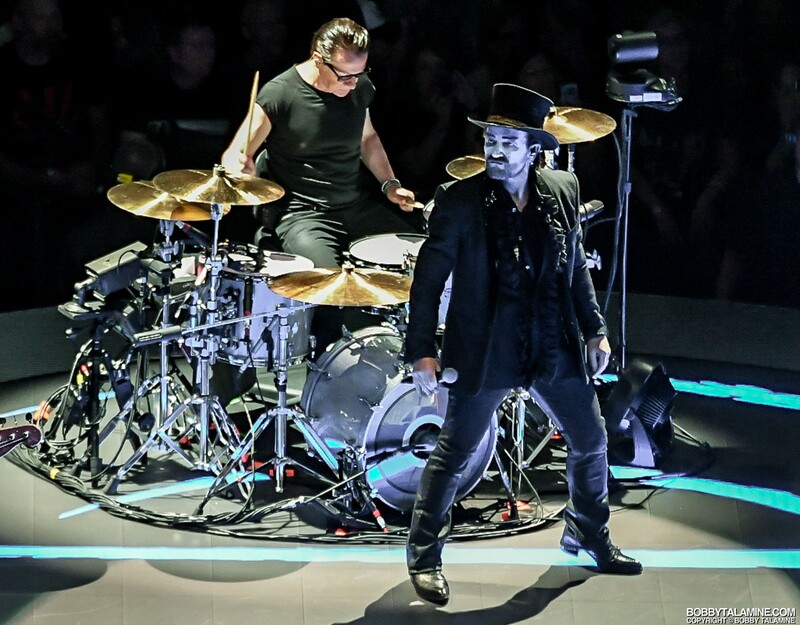 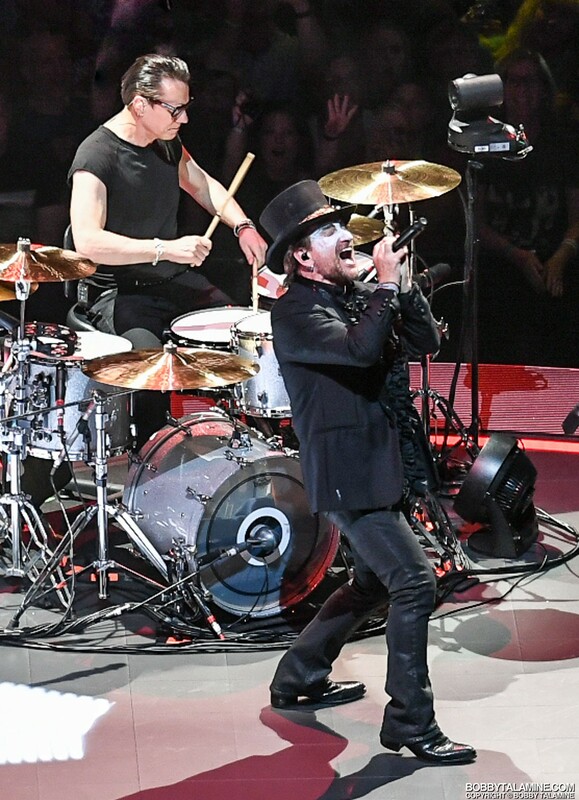 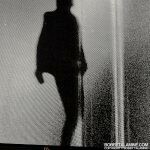 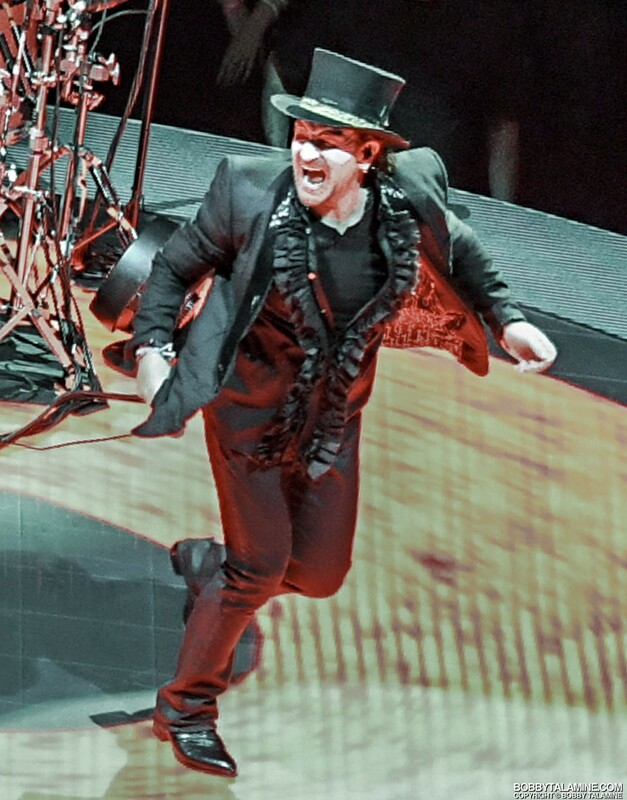 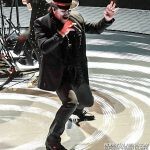 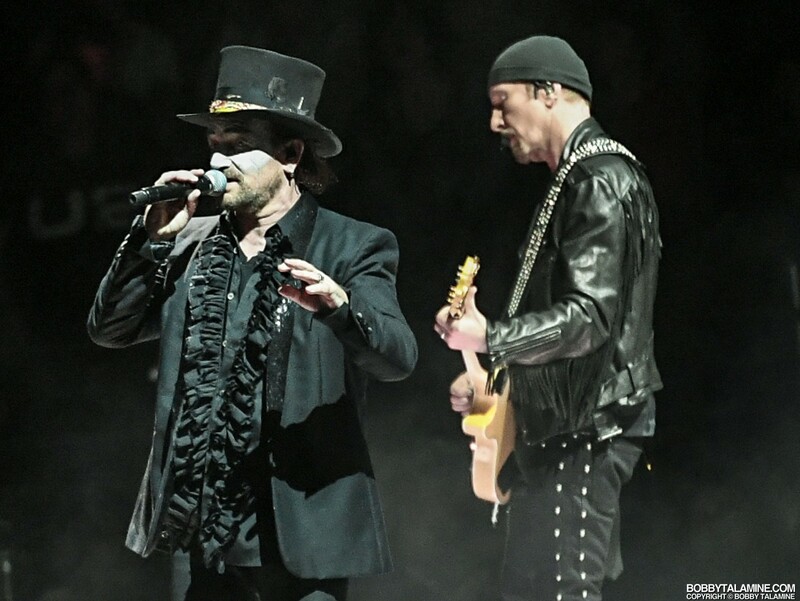 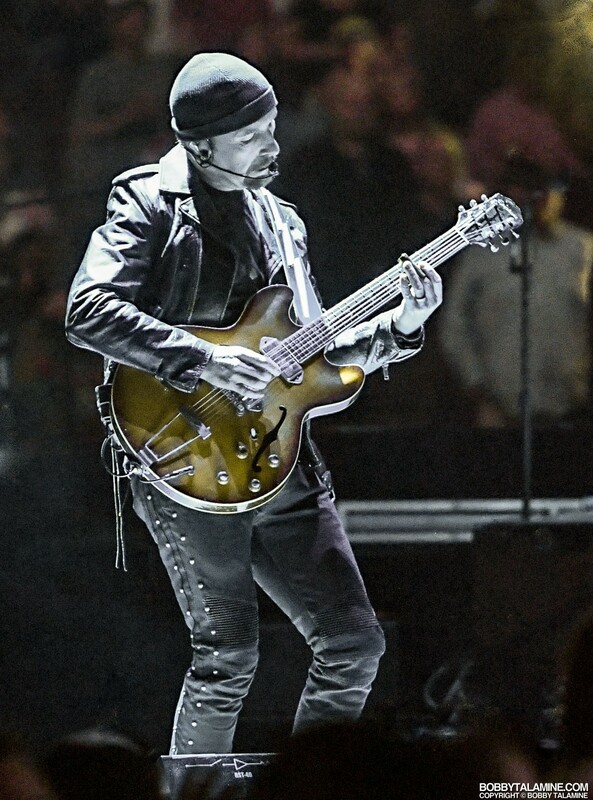 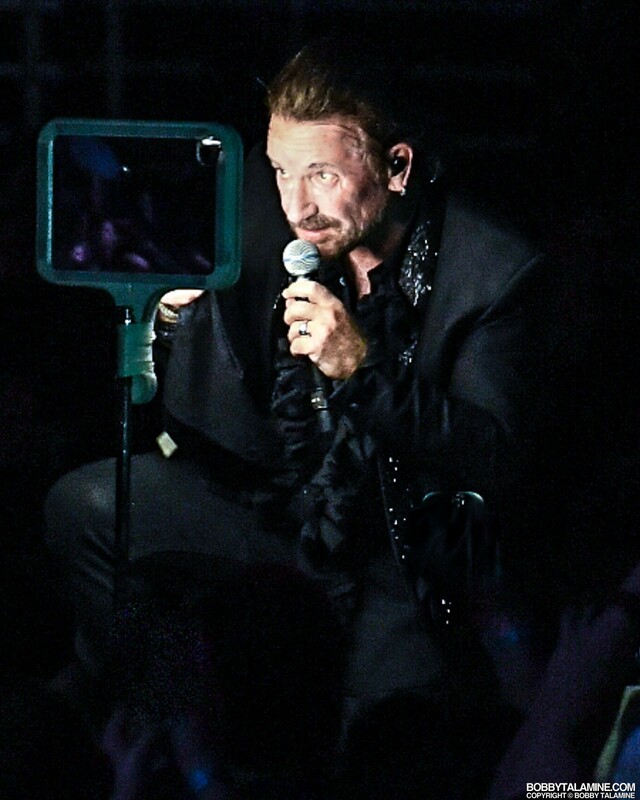 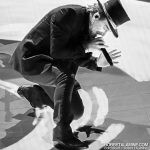 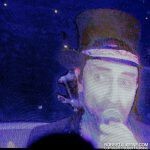 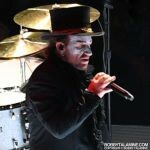 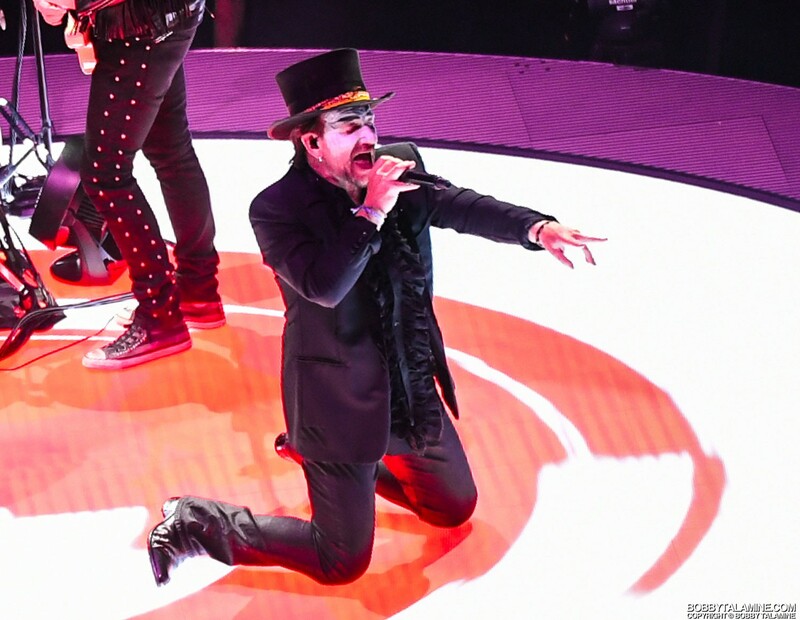 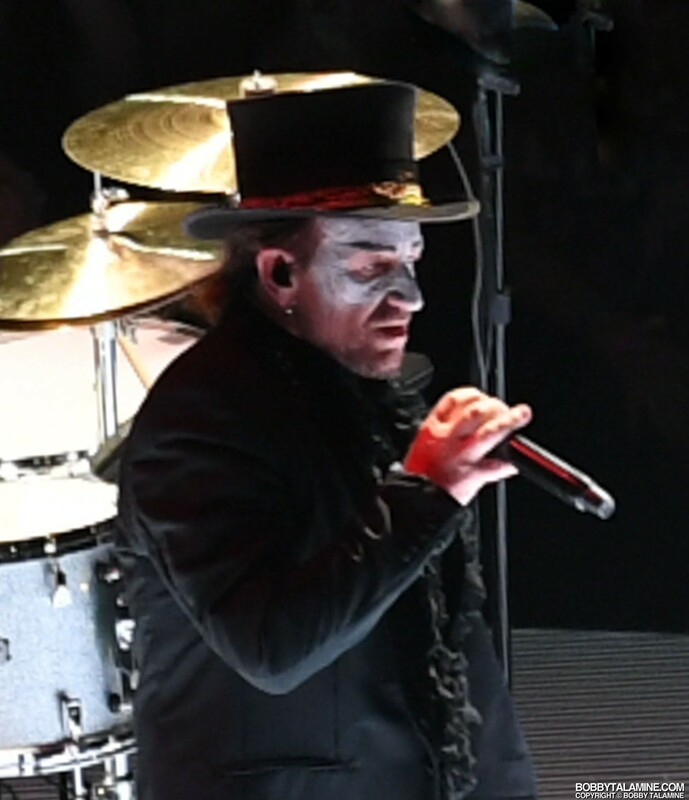 And then the one two three punch of “Elevation” into “Vertigo” into “Desire” that gets the crowd into a party mood quickly and easily before Bono begins speaking in that devilish alter ego of Mr. MacPhisto, resurrected once again from U2’s 1992/1993 Zoo TV Tour. 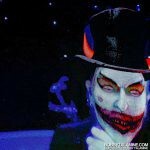 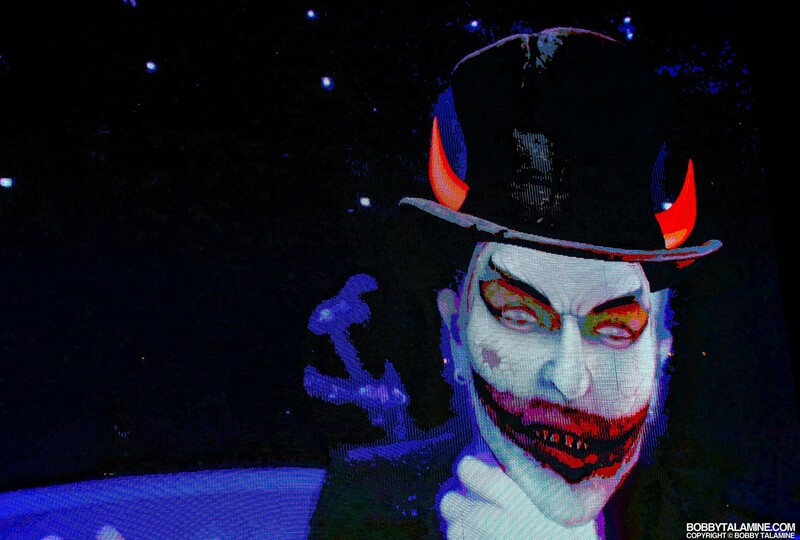 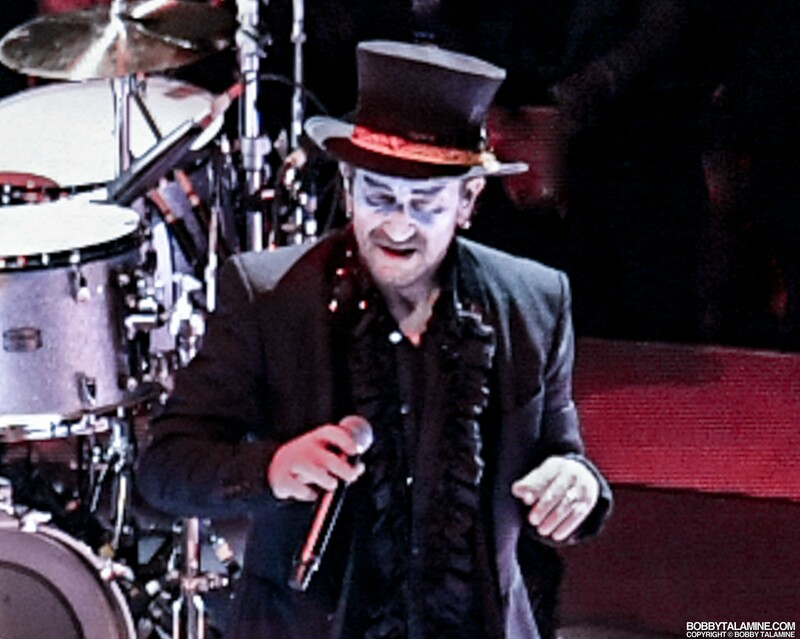 Although this is a somewhat mellower MacPhisto, no matter. 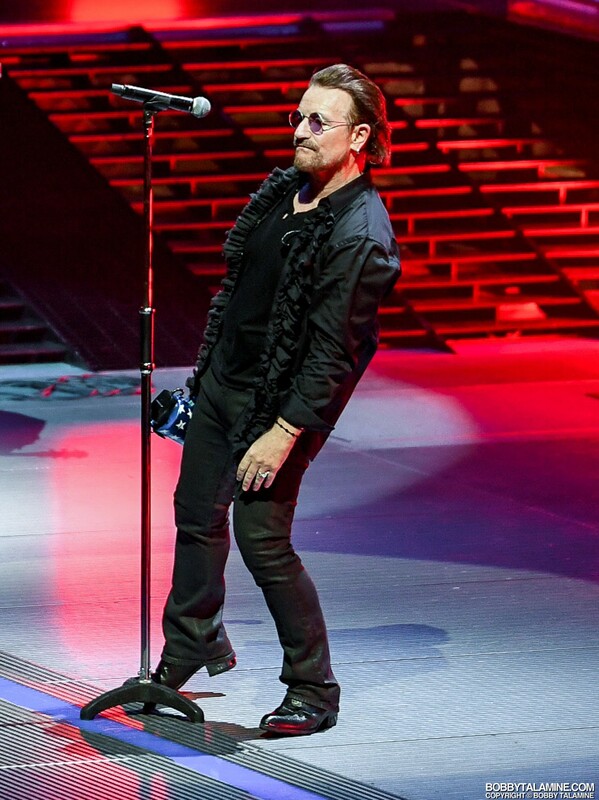 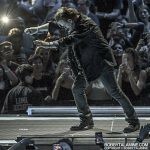 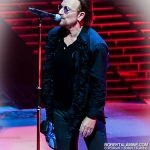 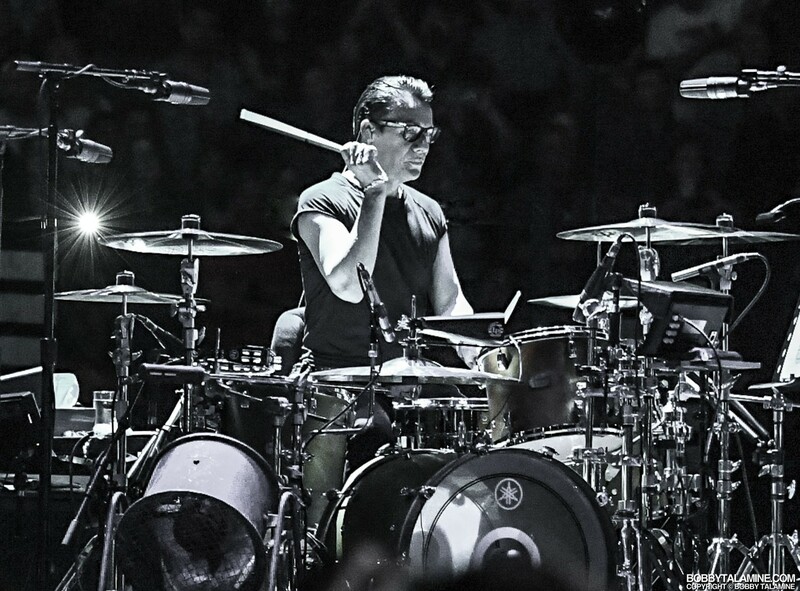 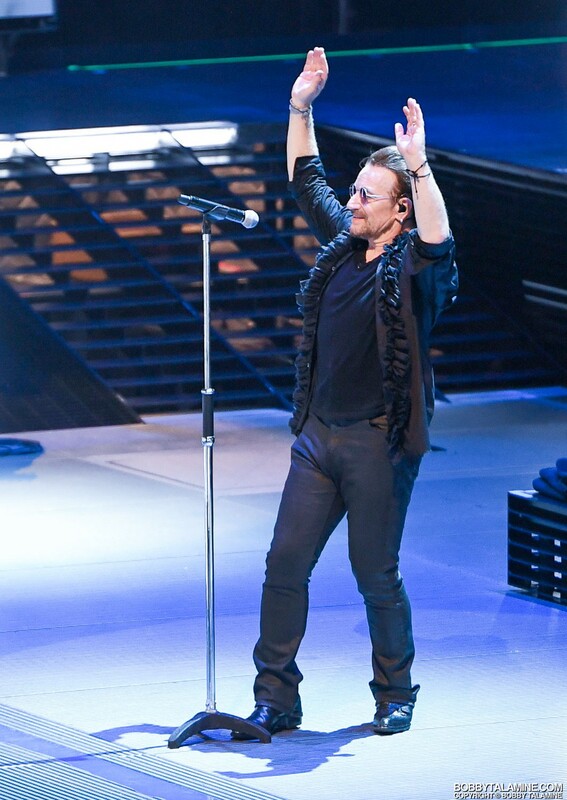 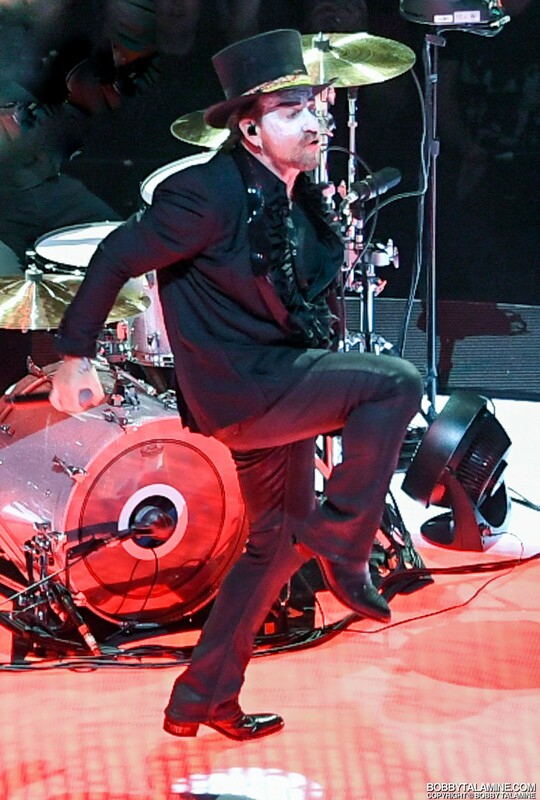 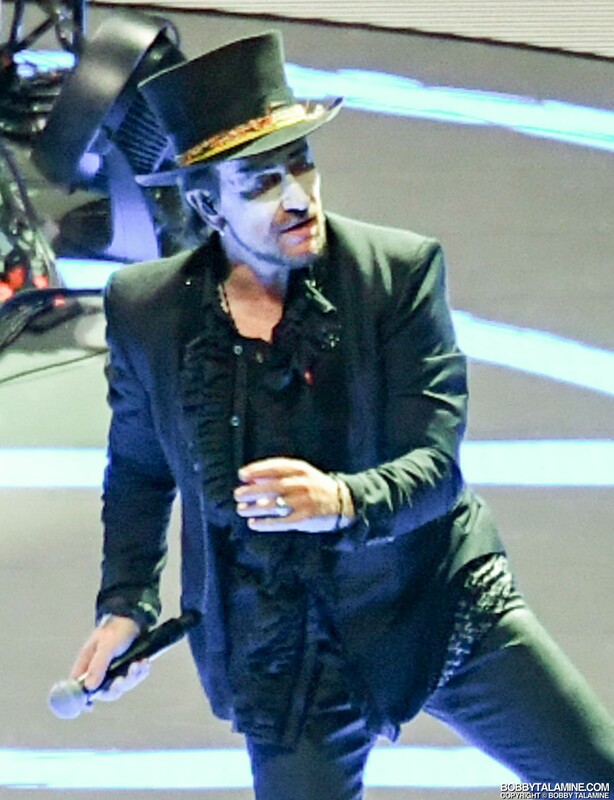 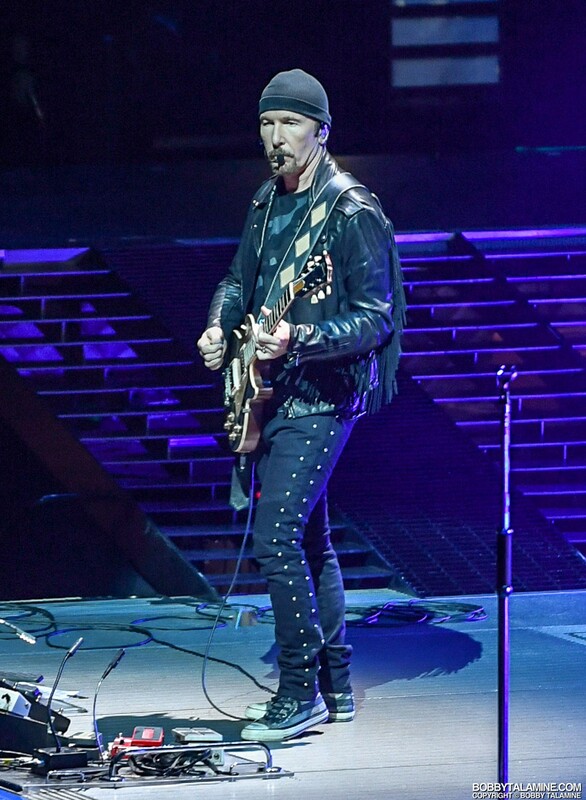 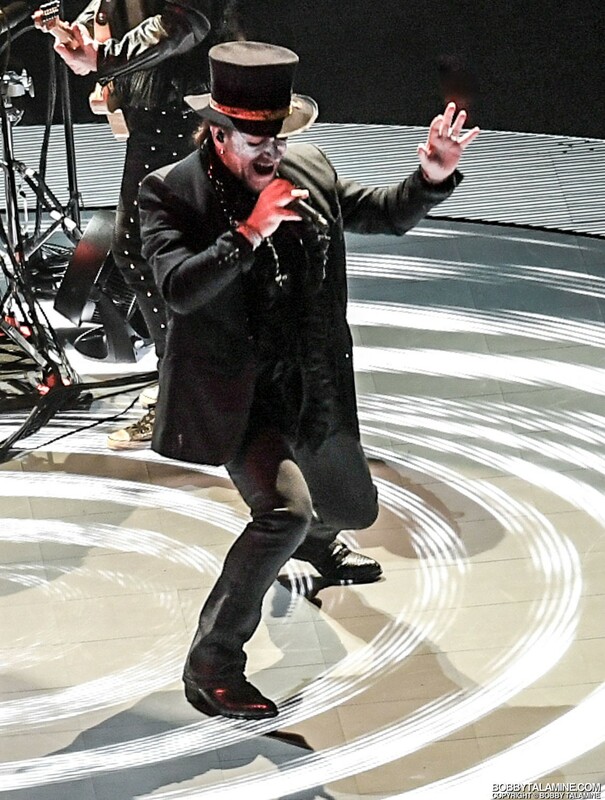 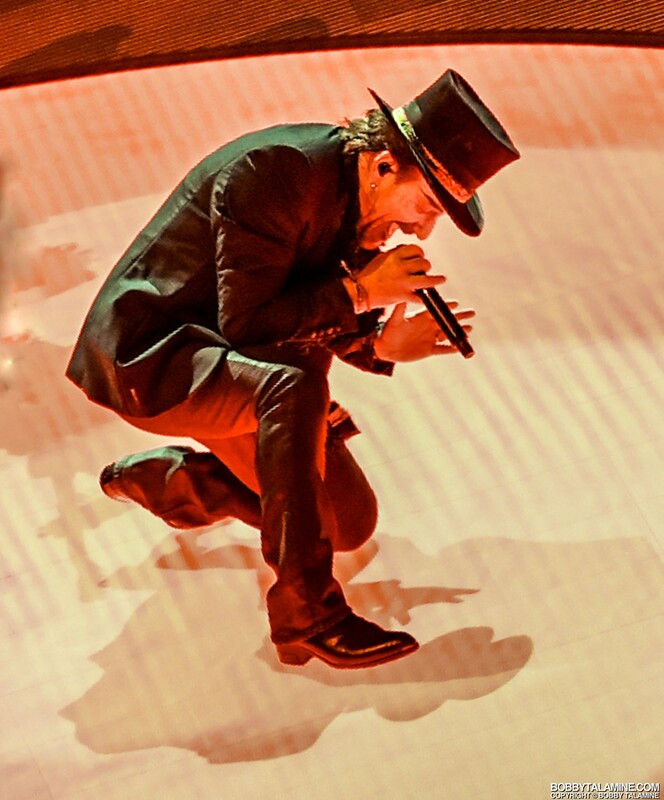 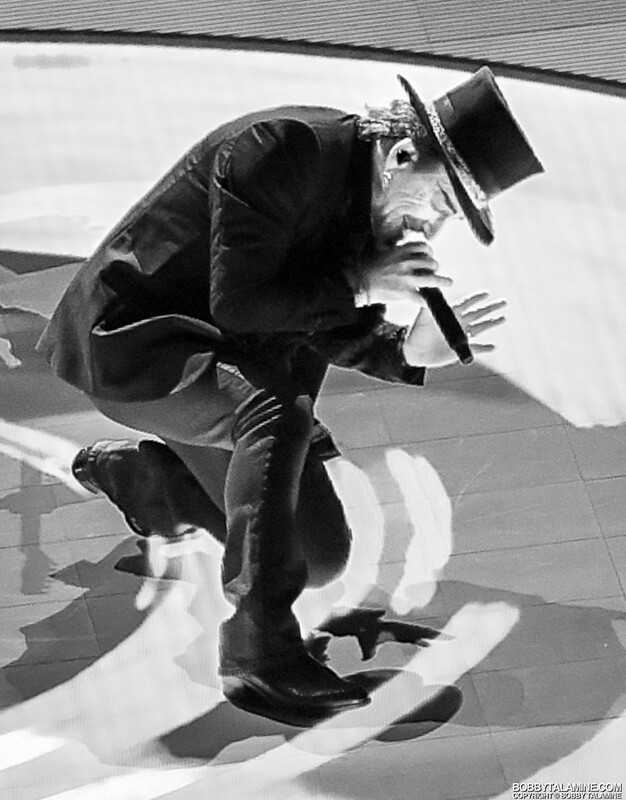 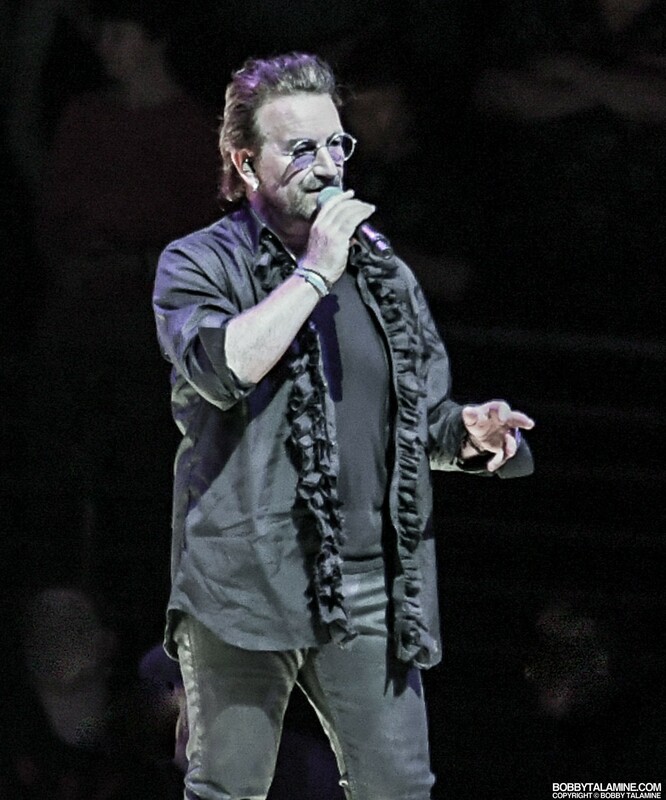 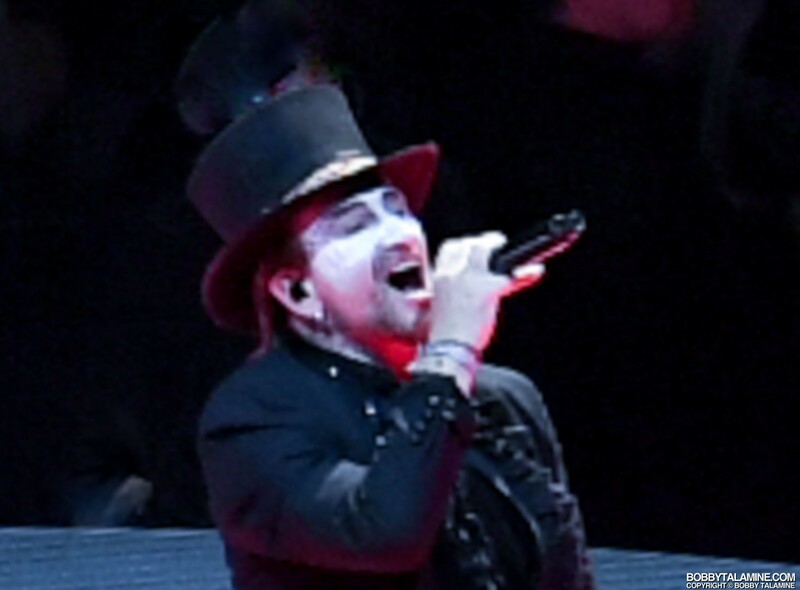 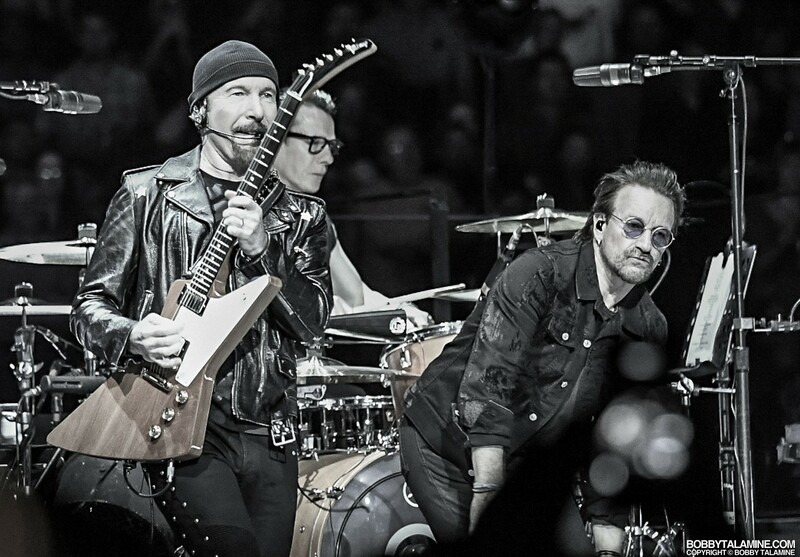 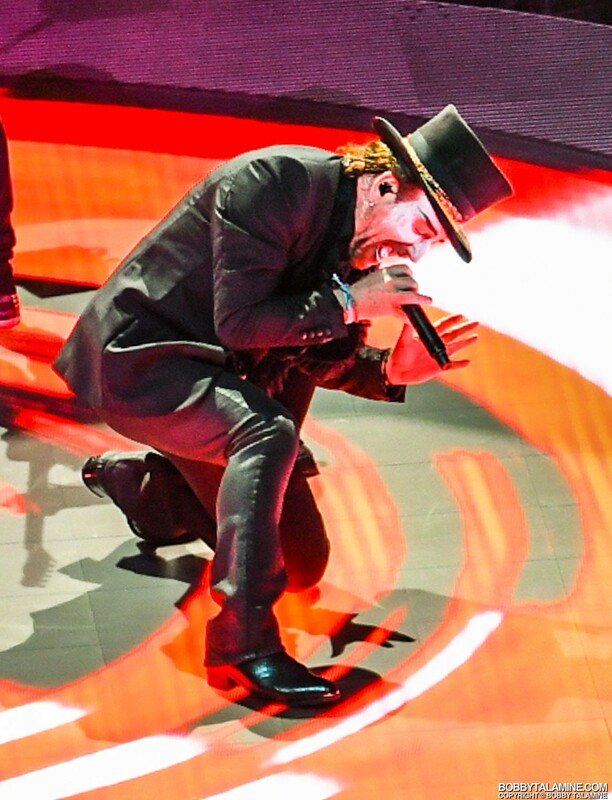 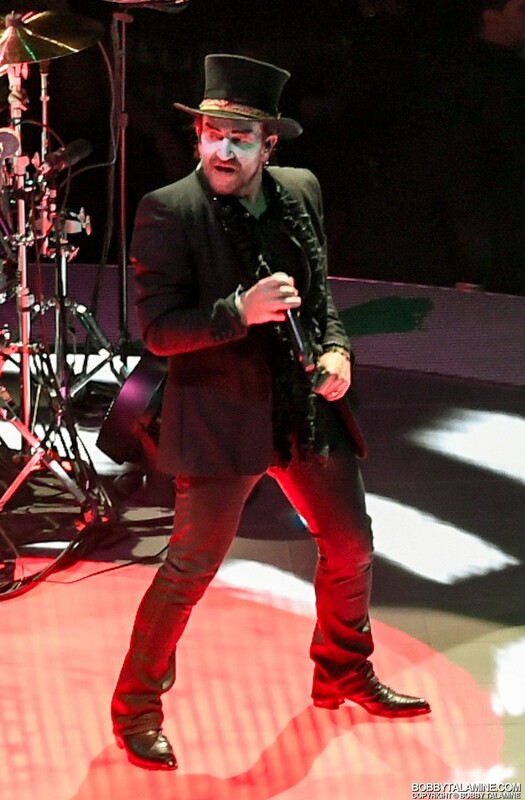 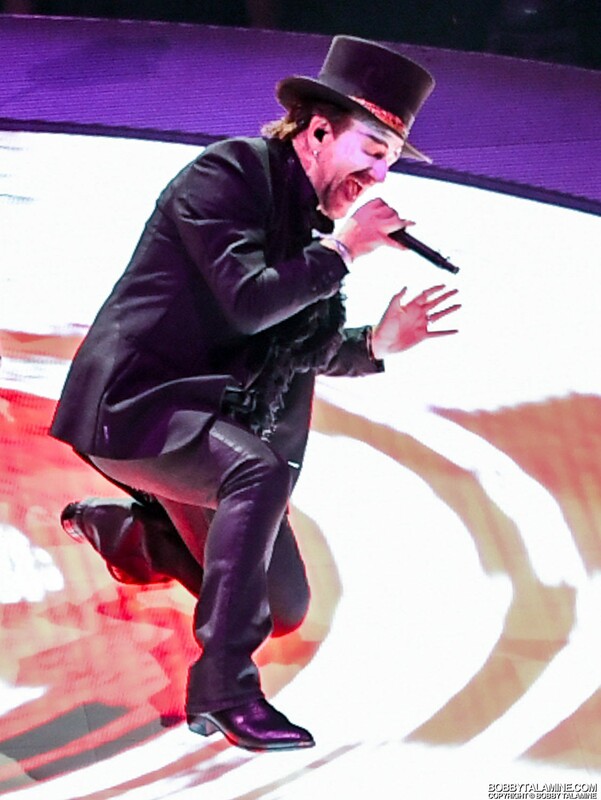 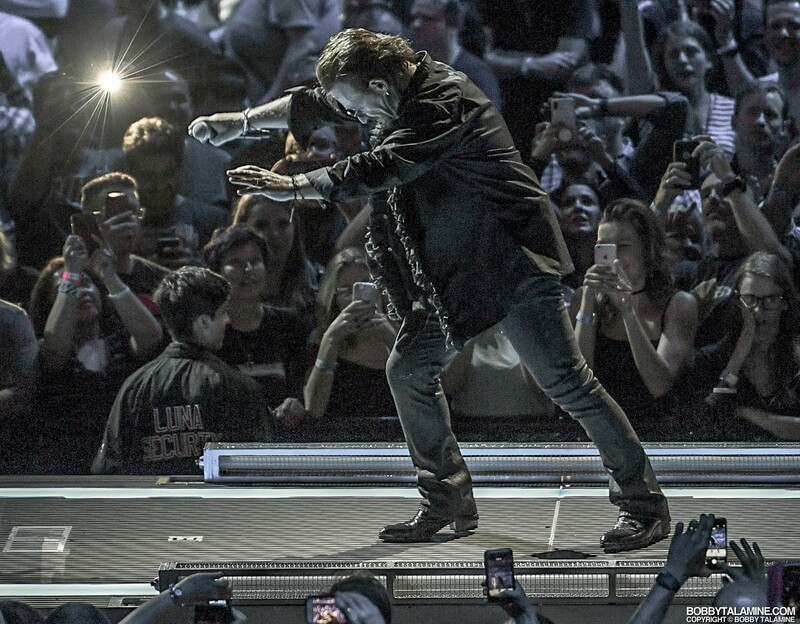 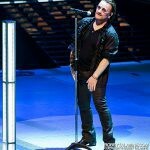 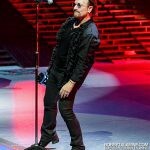 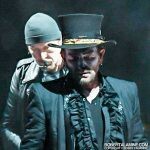 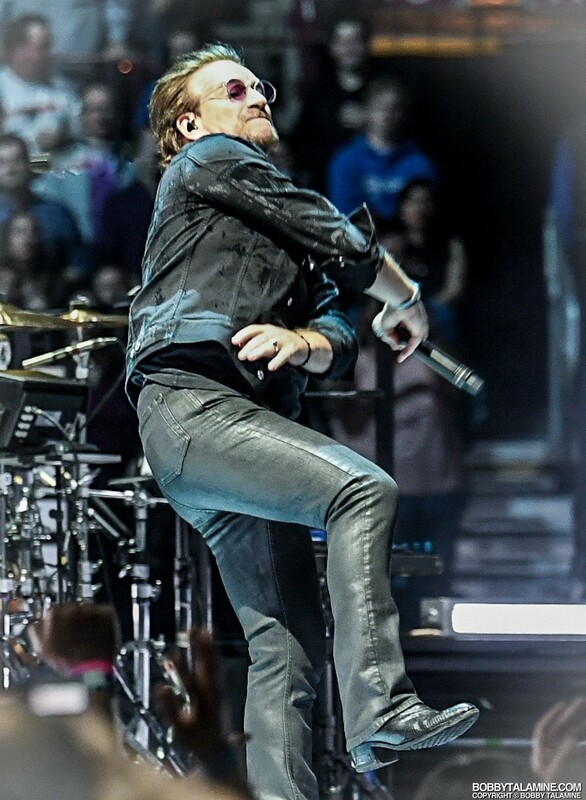 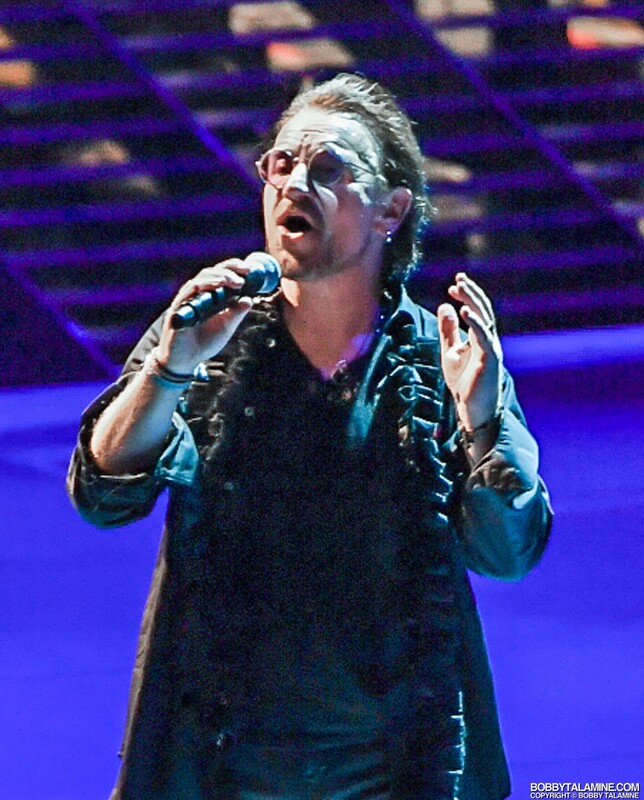 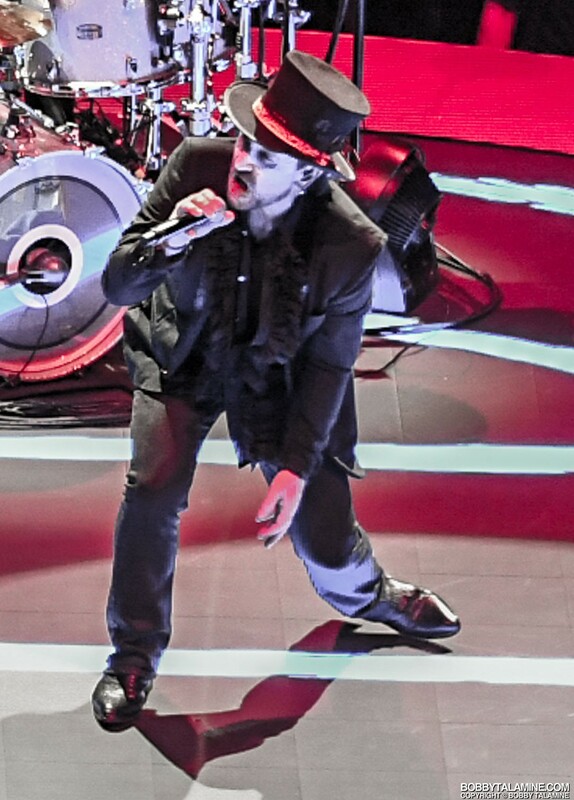 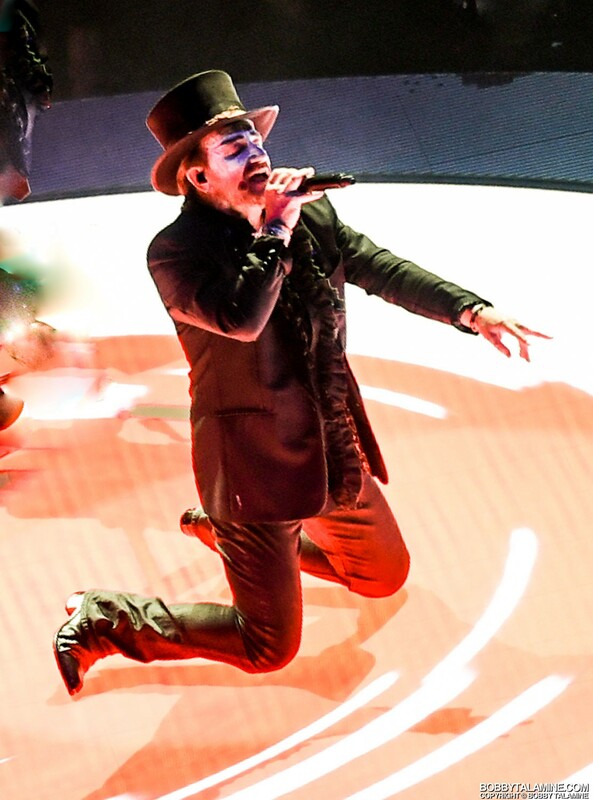 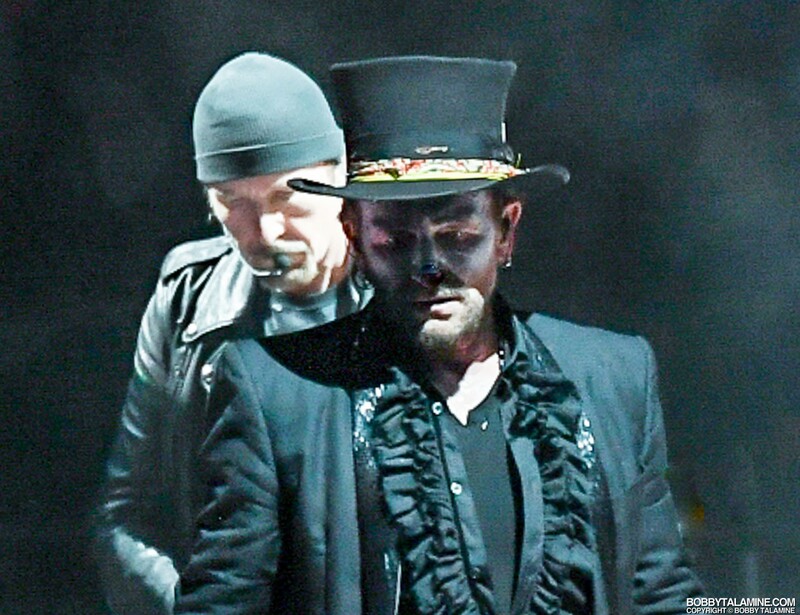 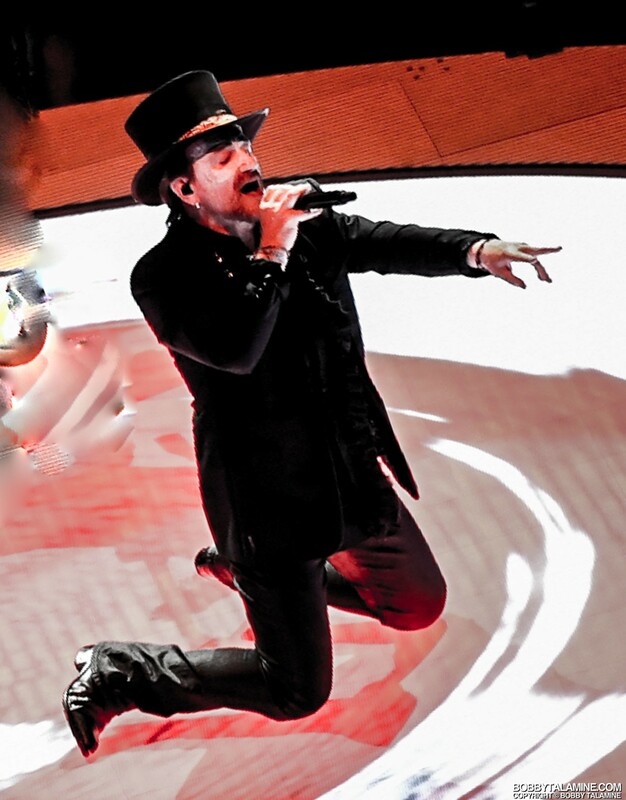 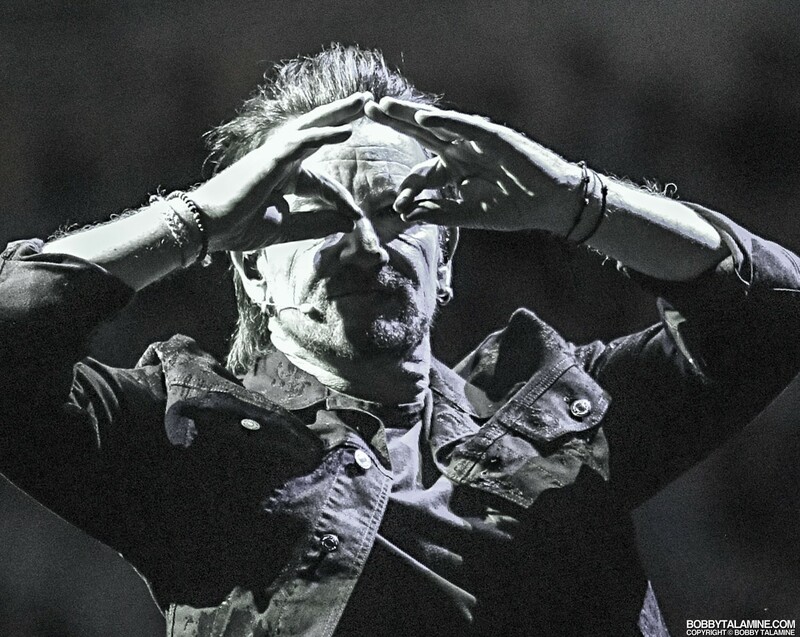 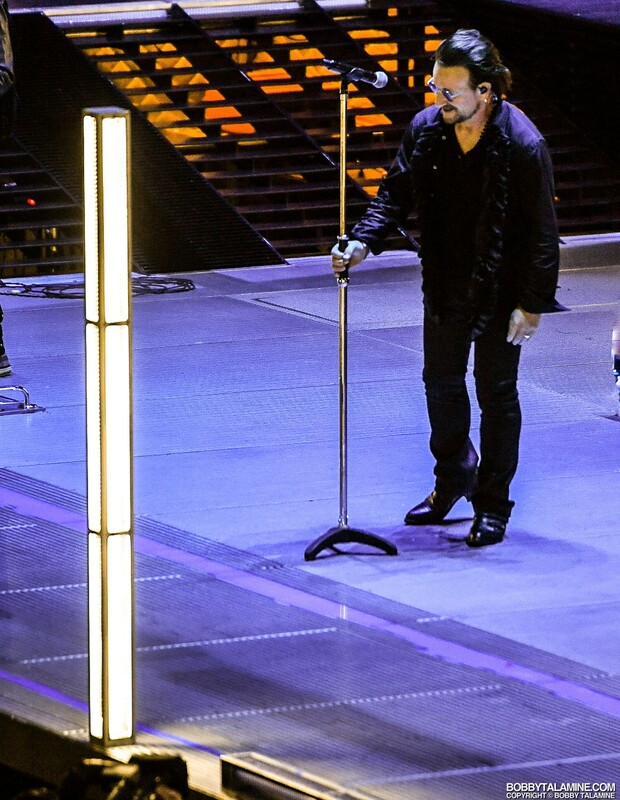 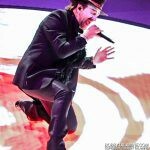 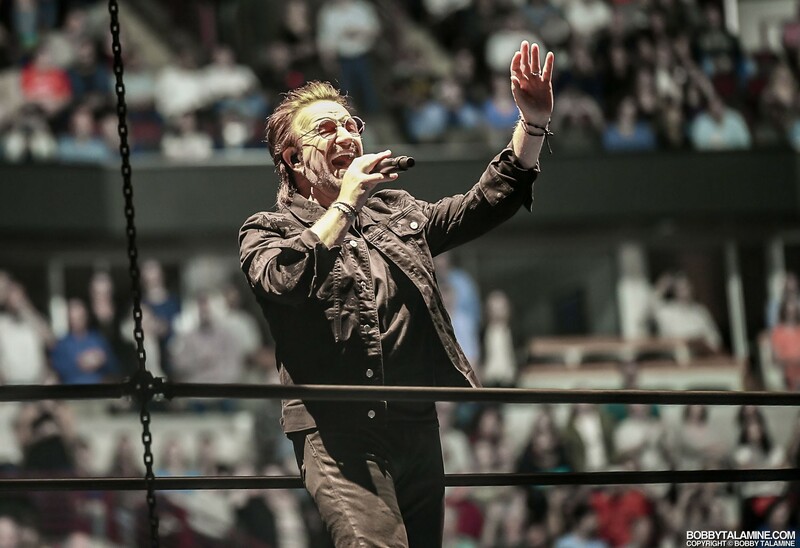 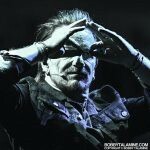 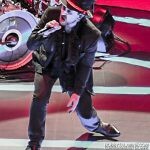 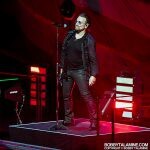 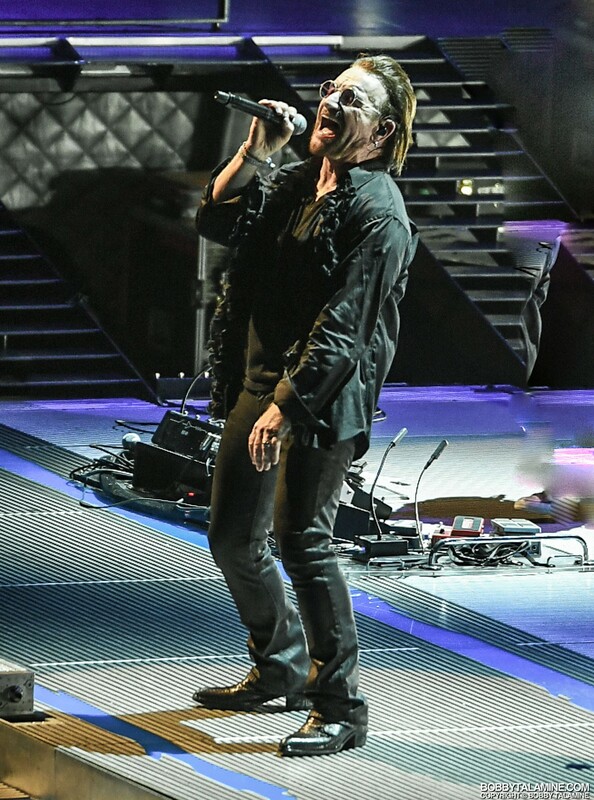 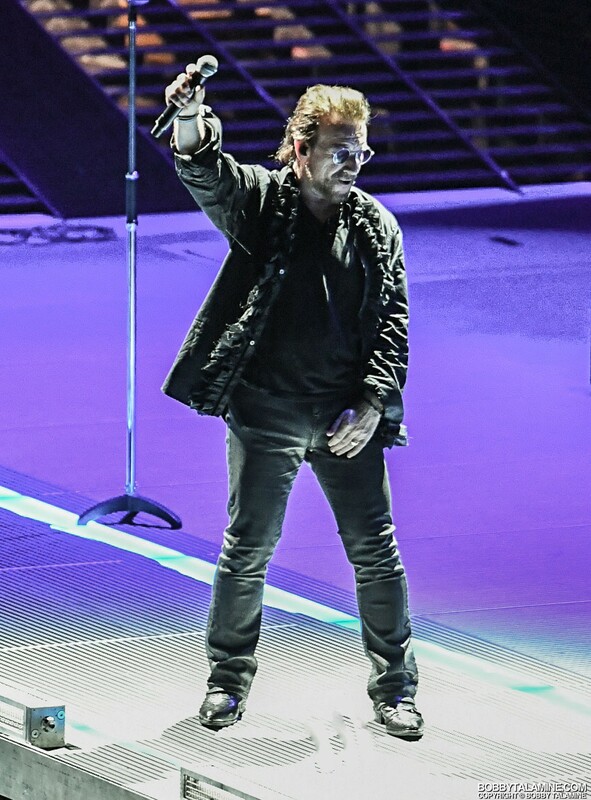 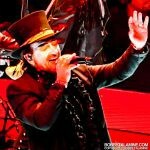 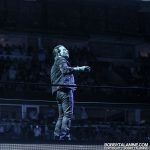 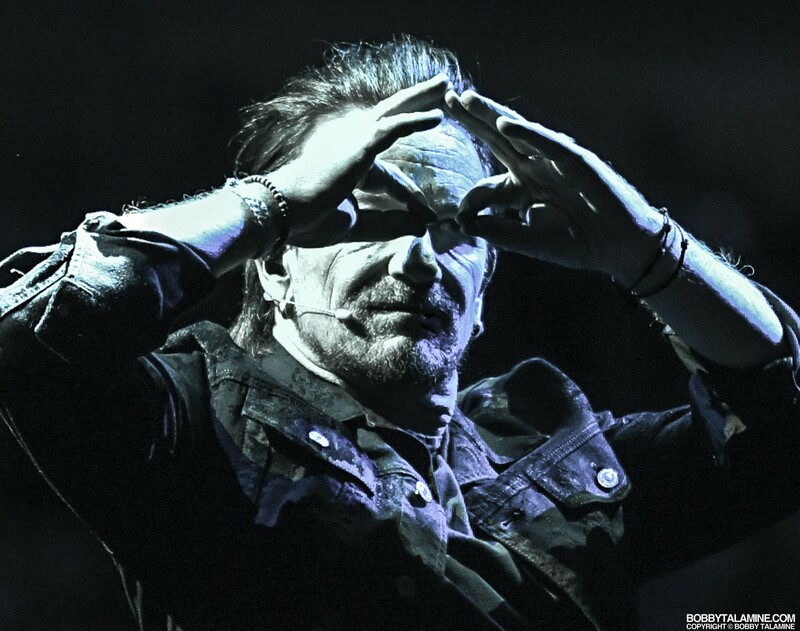 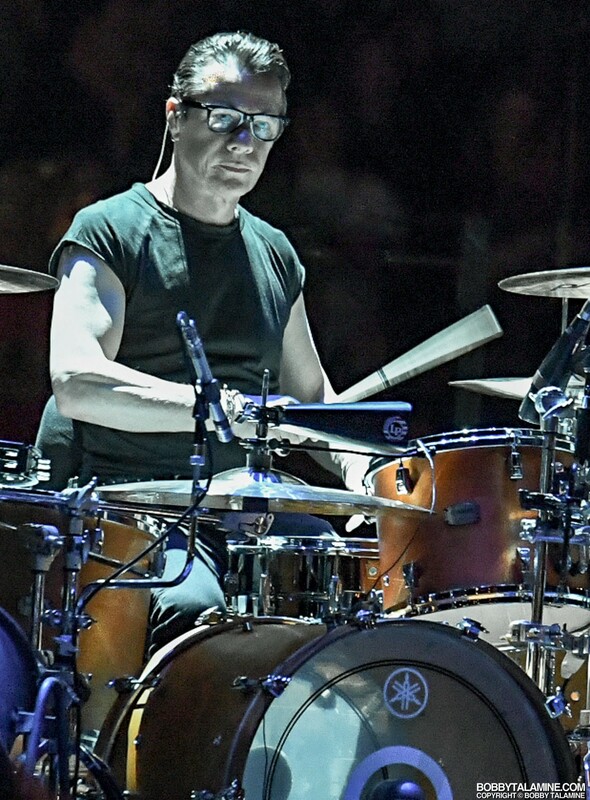 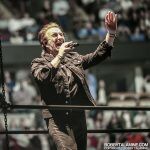 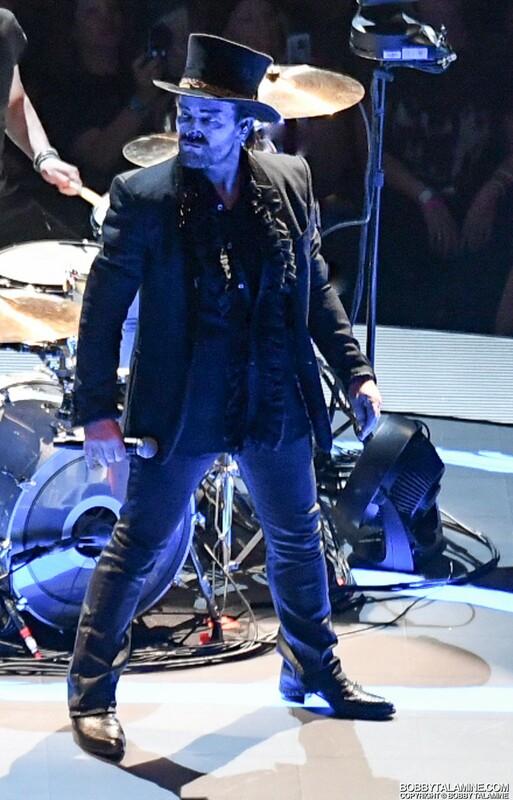 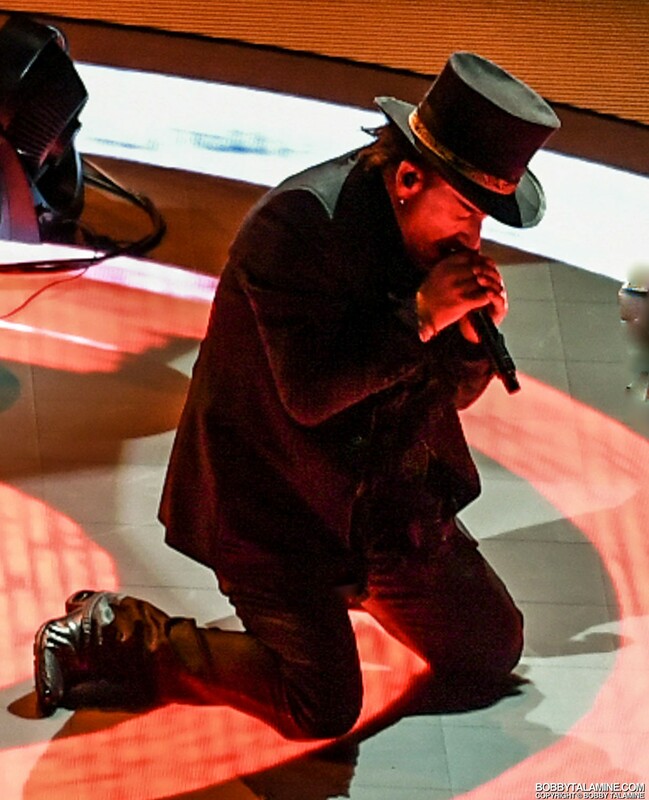 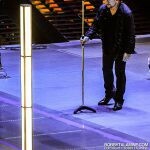 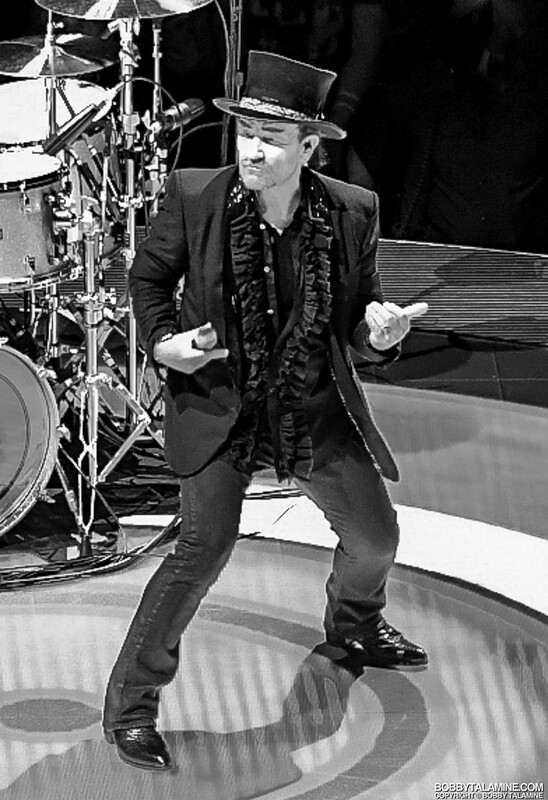 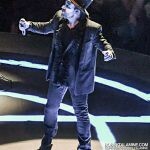 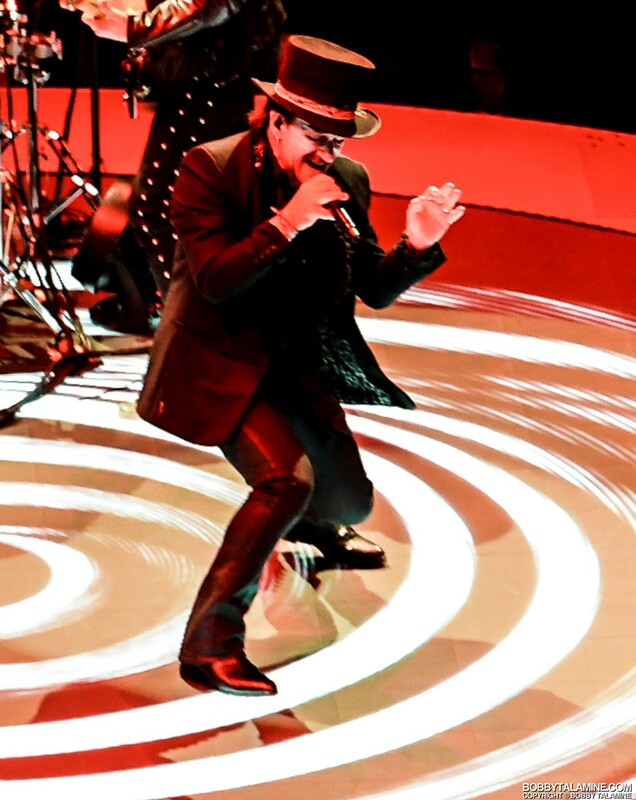 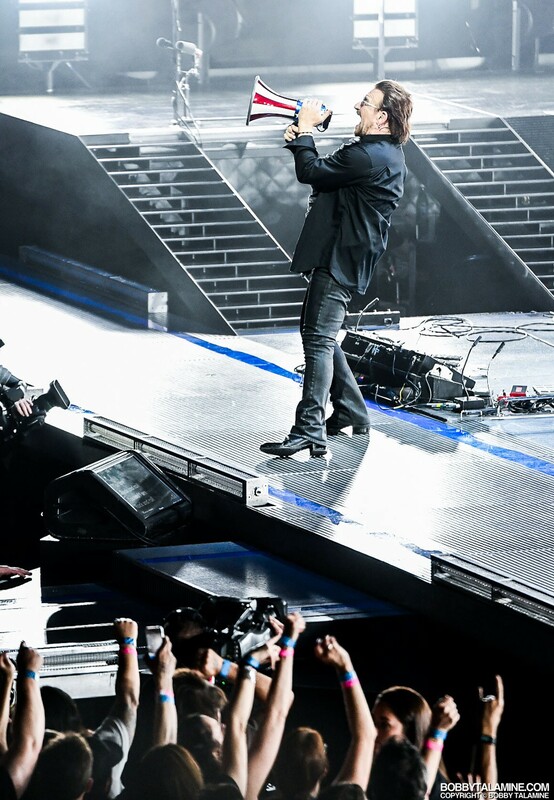 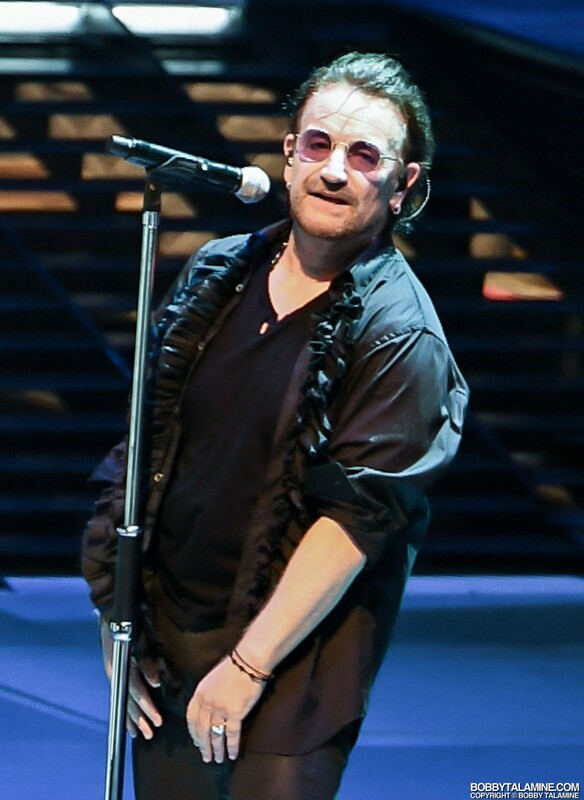 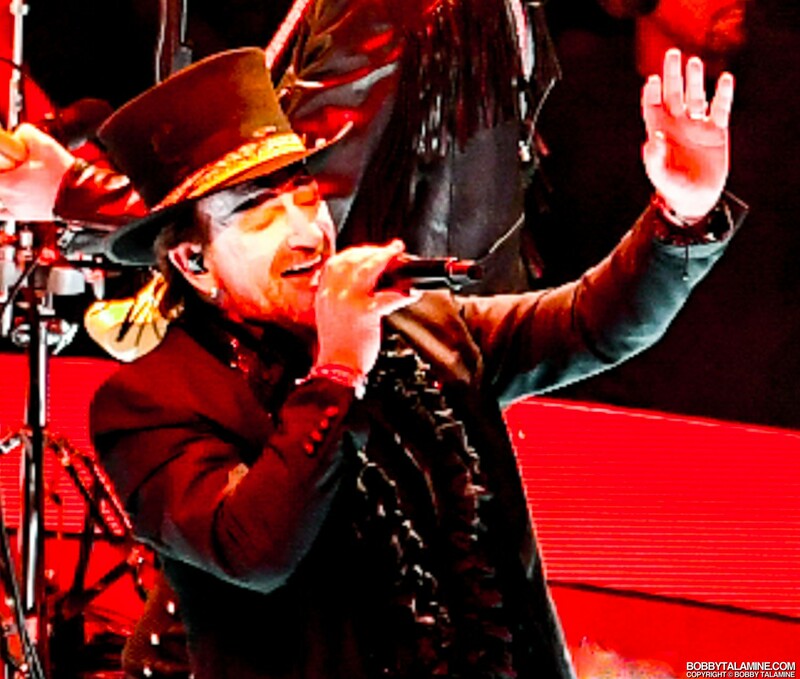 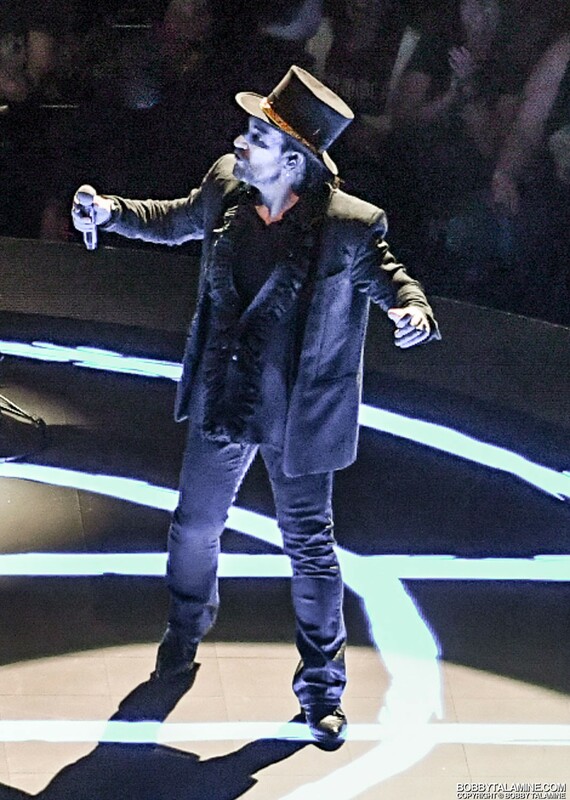 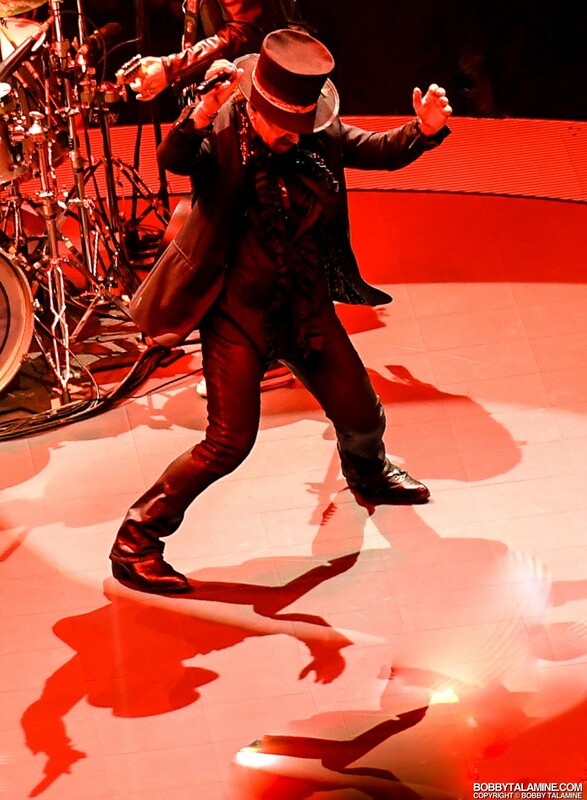 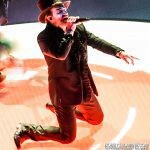 Bono still has ideas on the wicked and macabre to get his point across, maybe not swinging from the hips as of old. 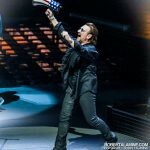 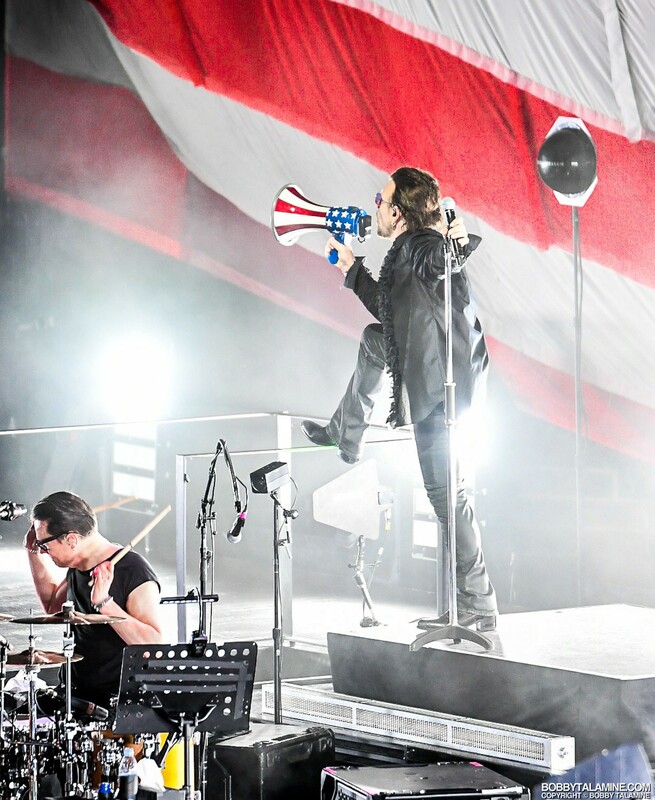 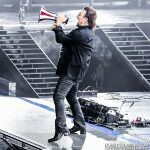 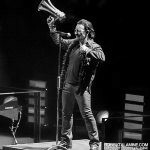 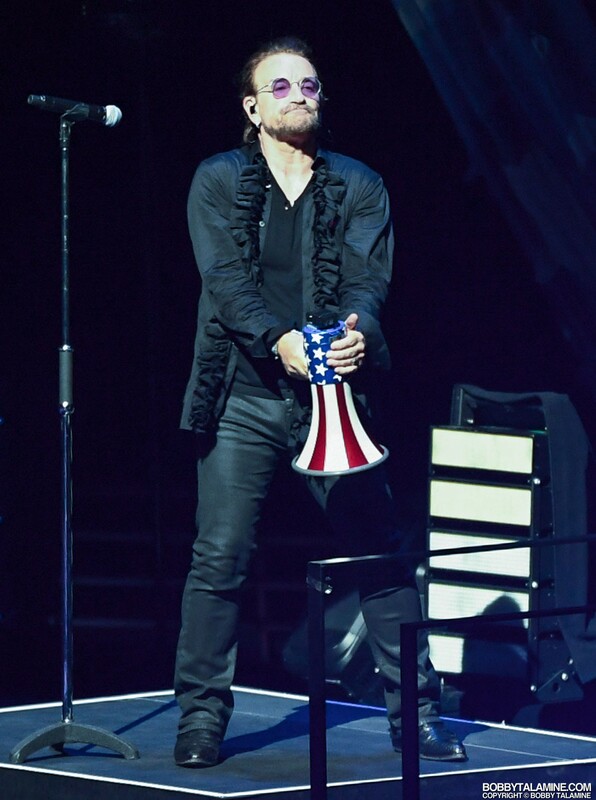 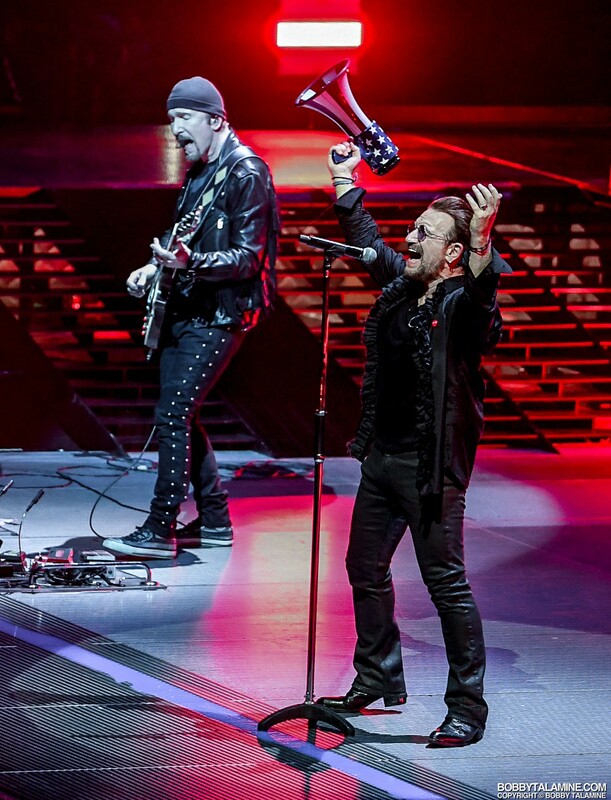 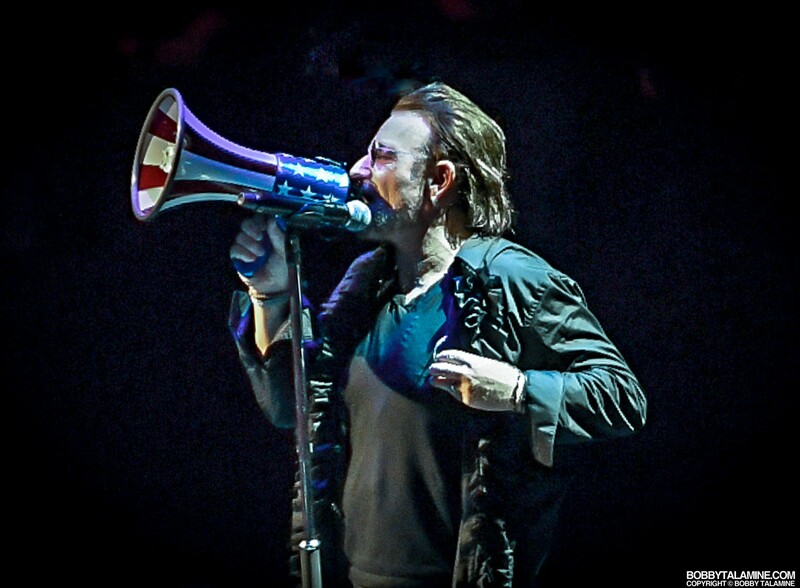 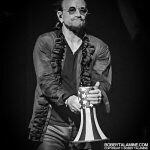 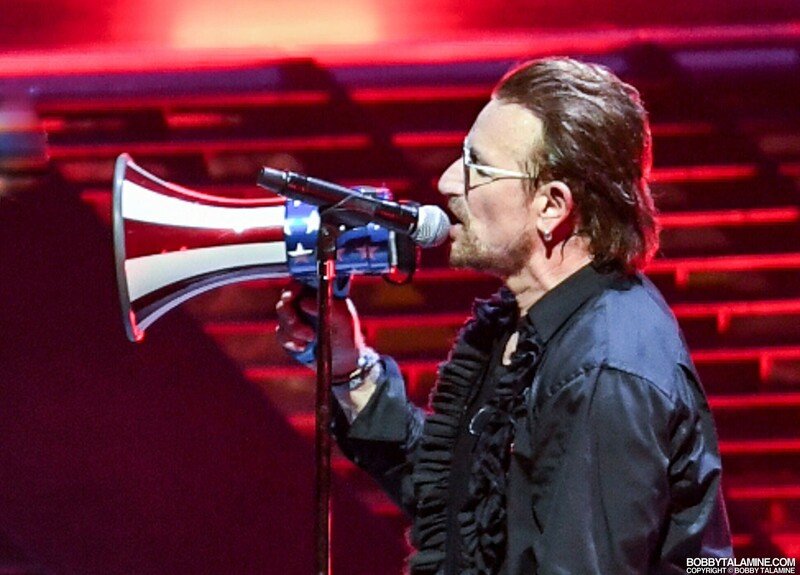 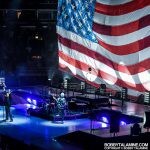 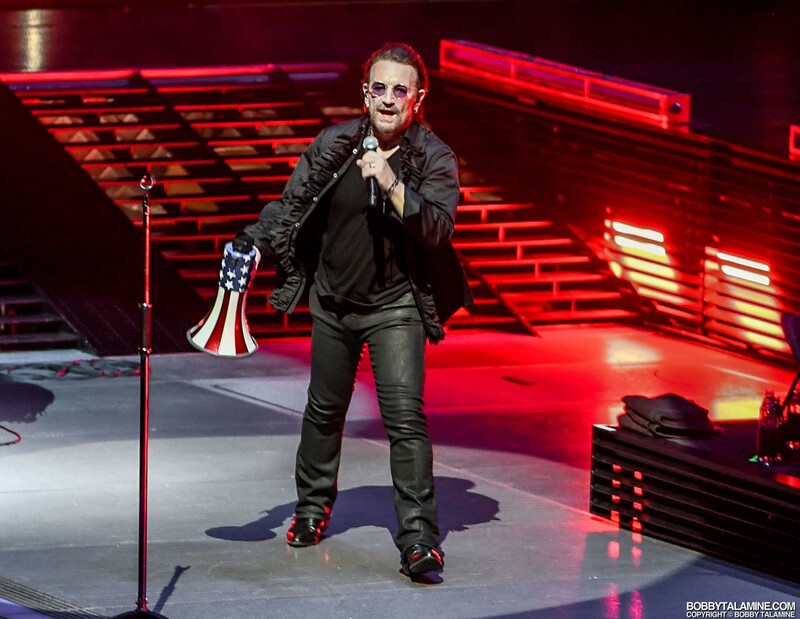 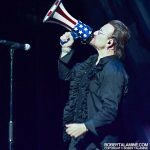 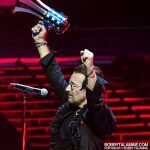 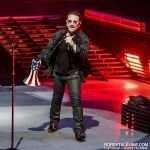 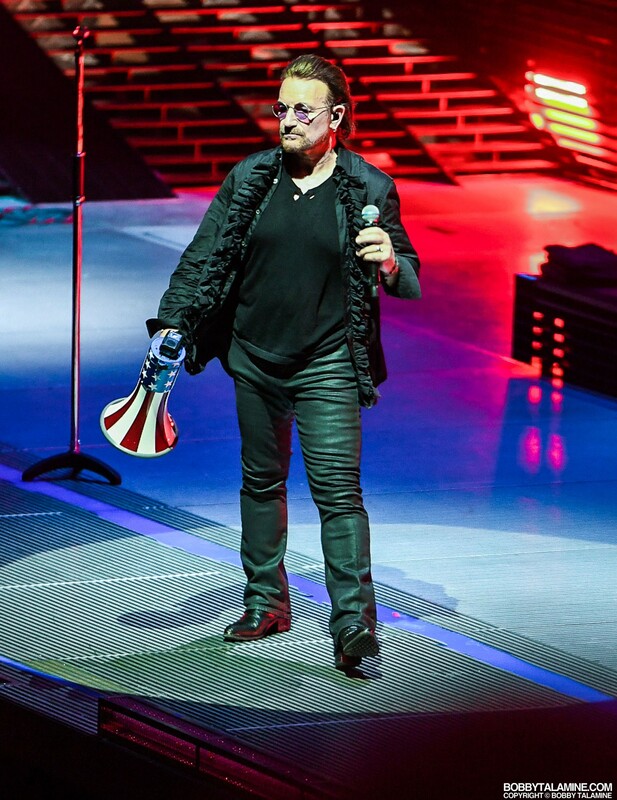 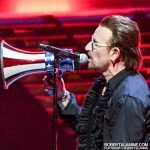 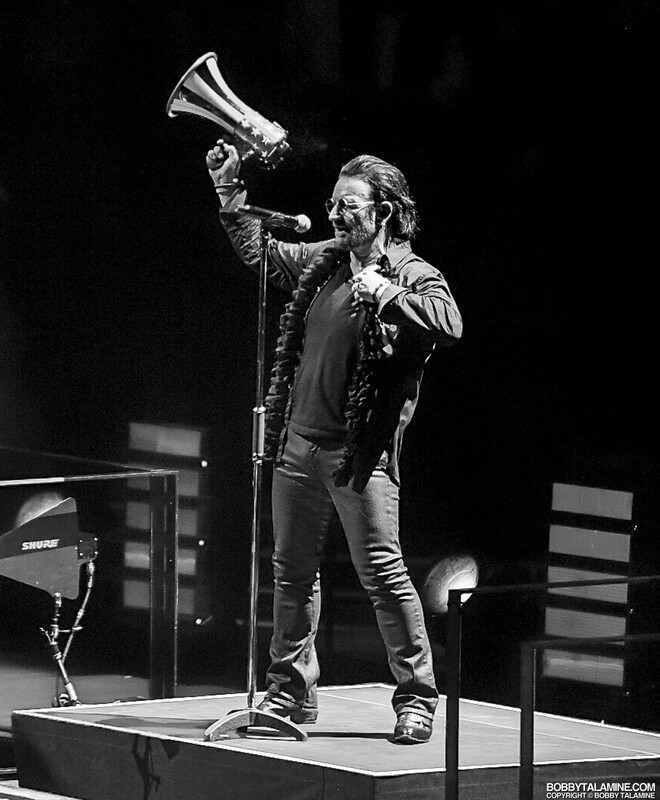 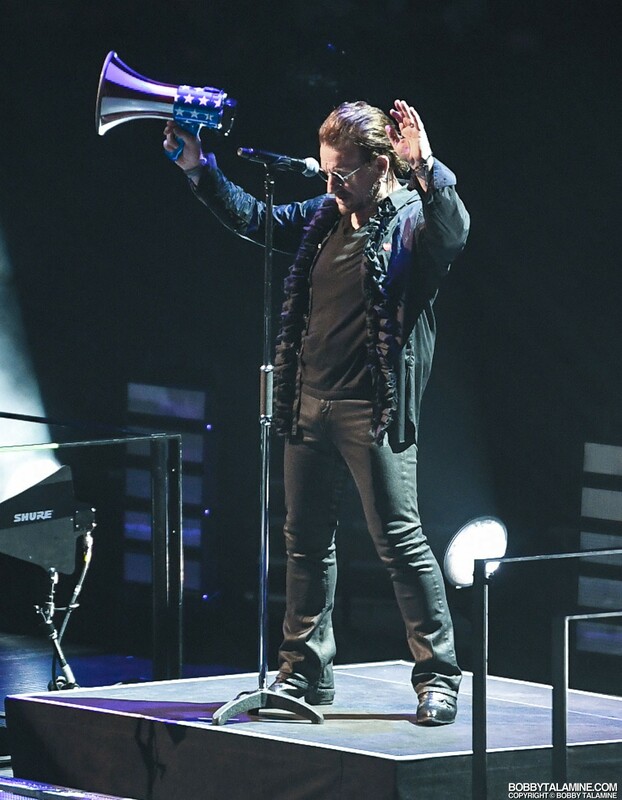 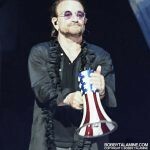 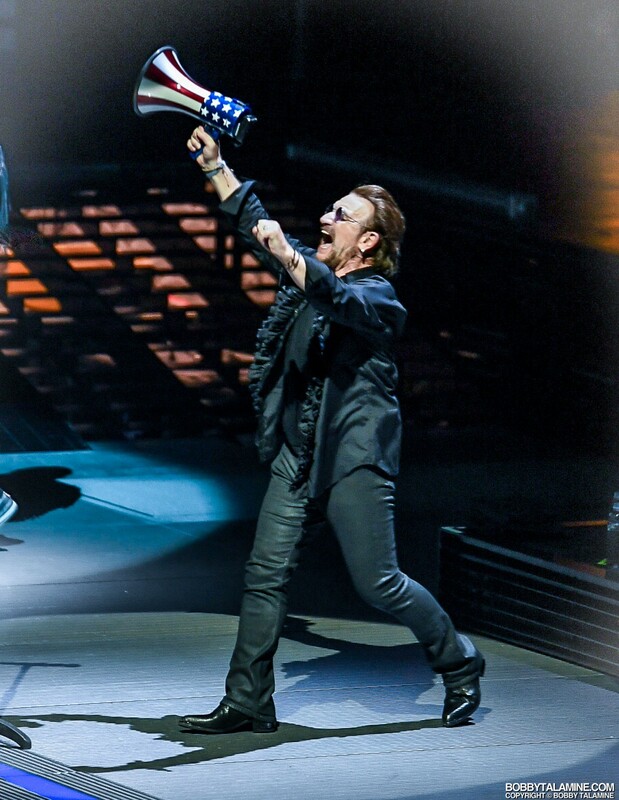 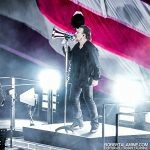 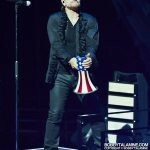 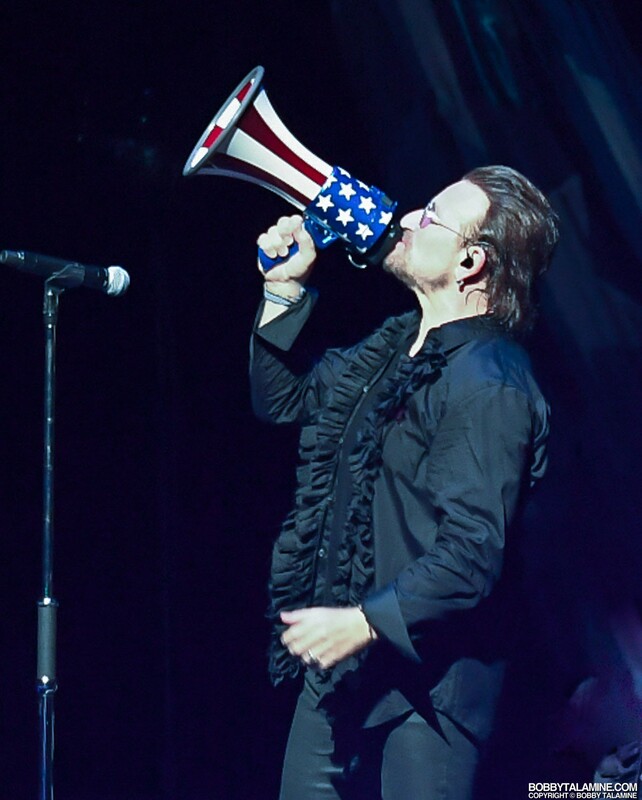 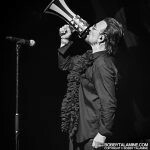 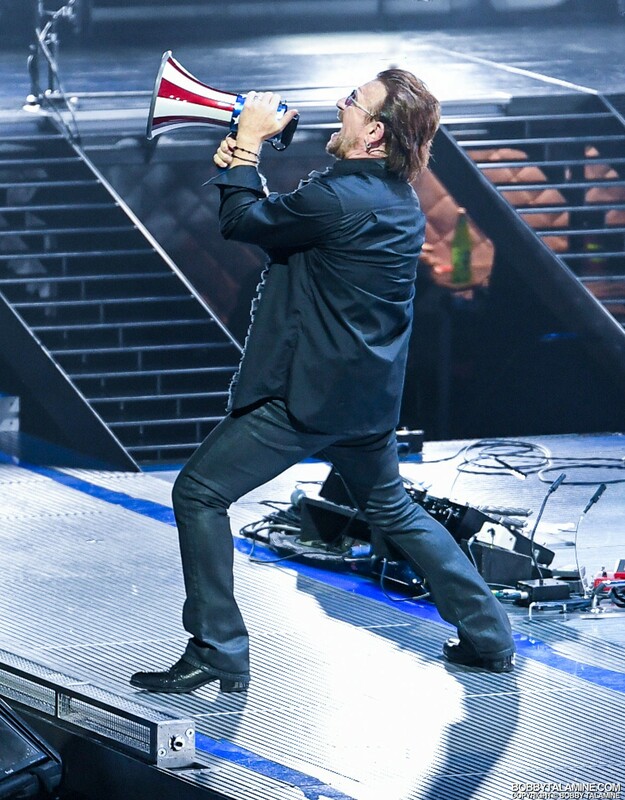 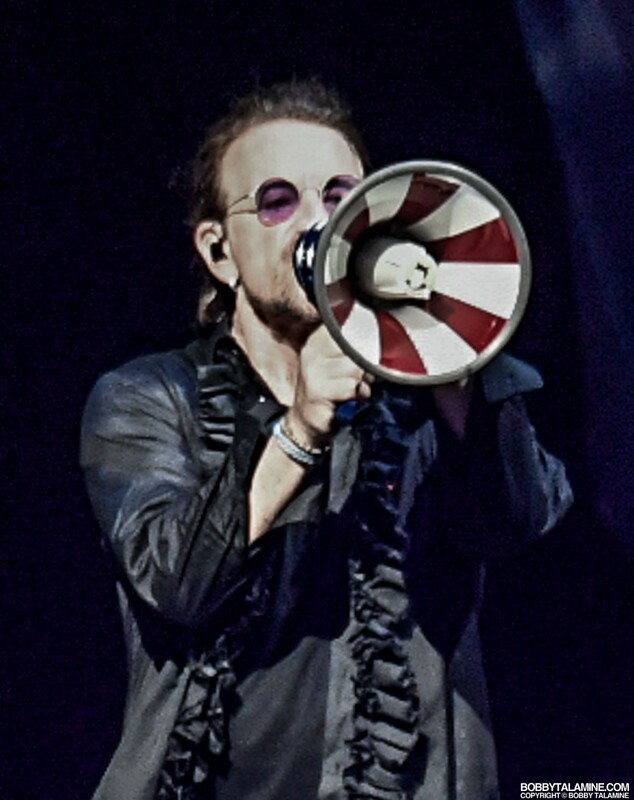 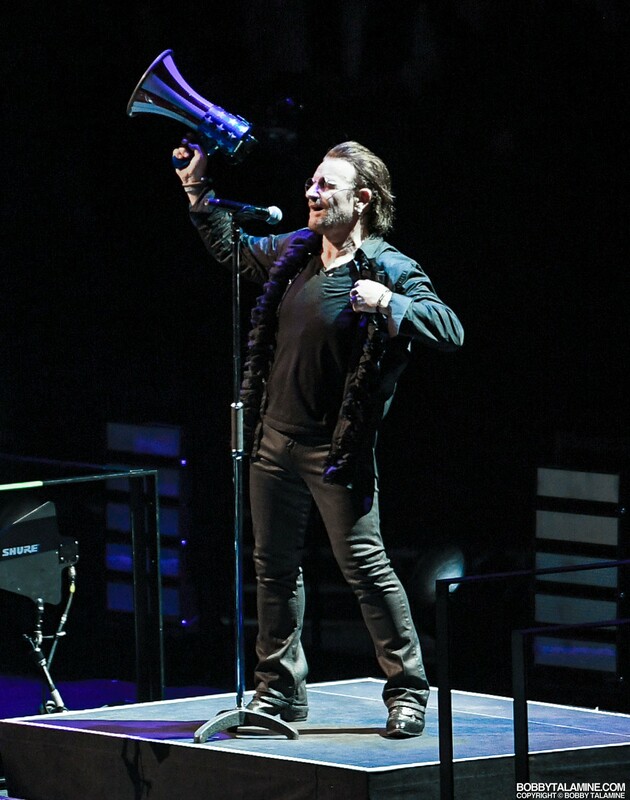 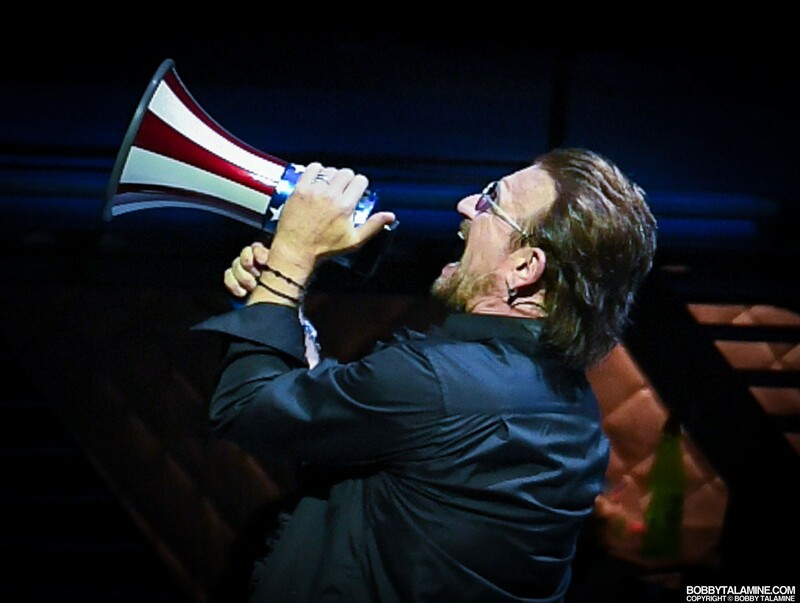 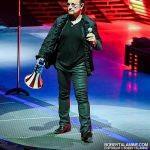 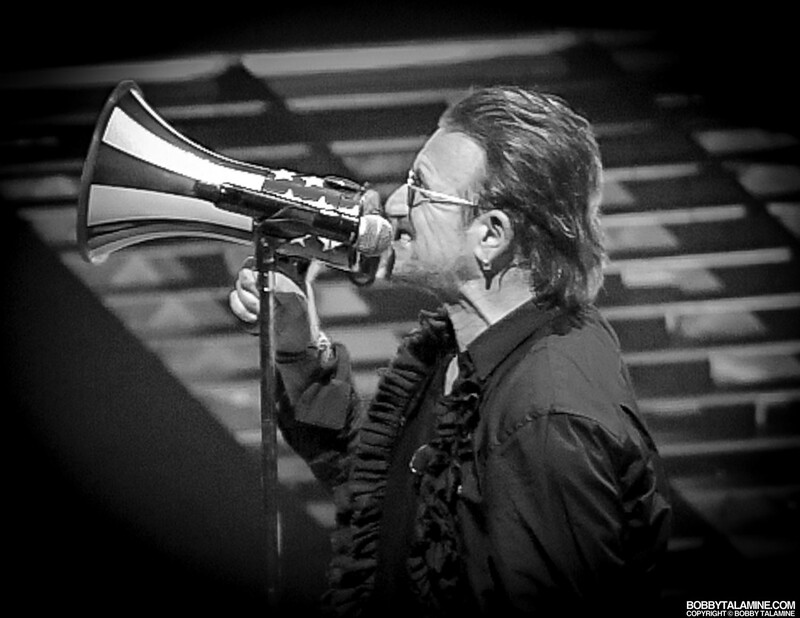 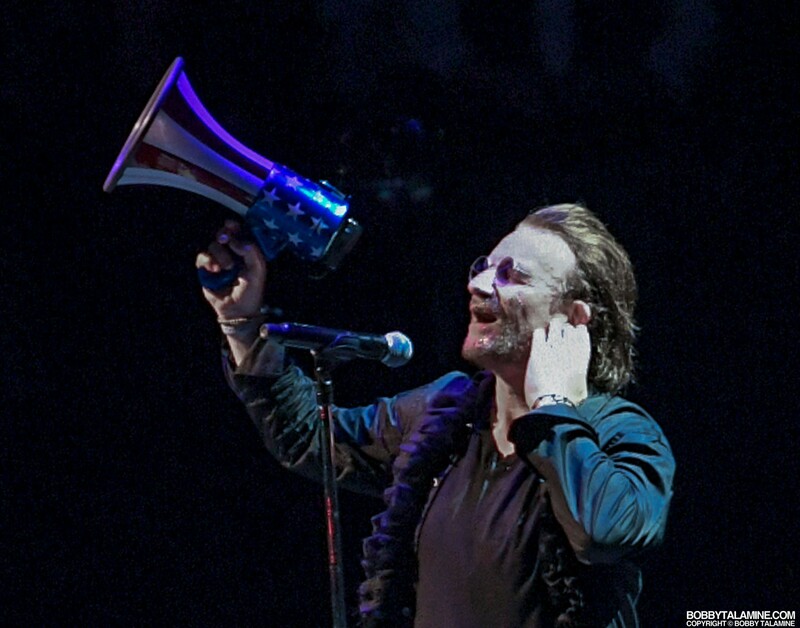 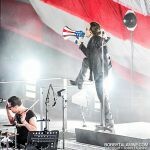 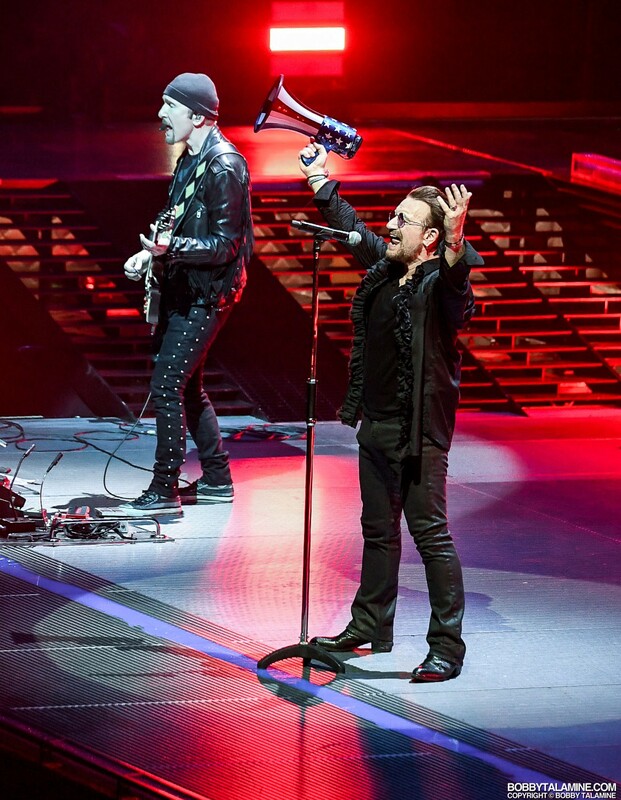 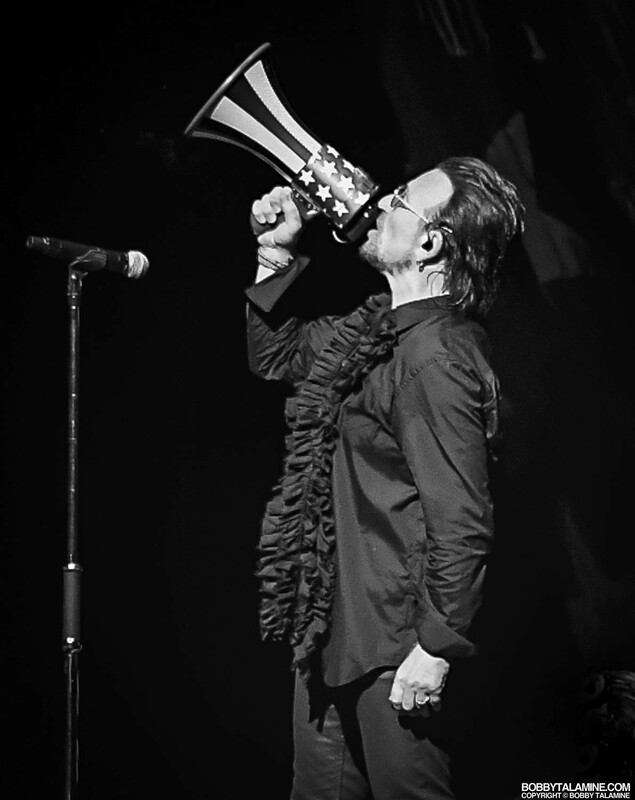 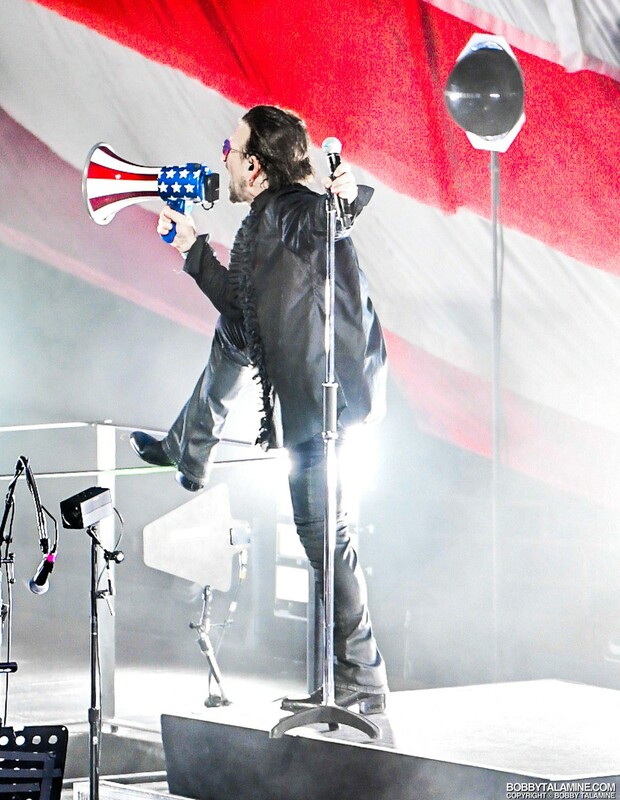 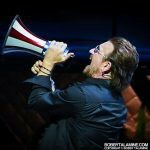 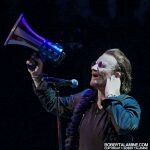 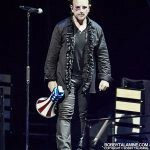 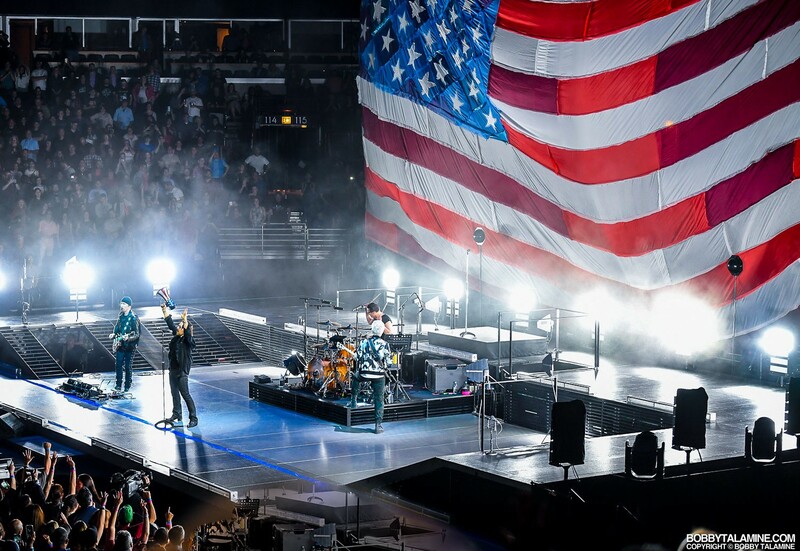 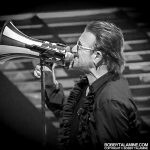 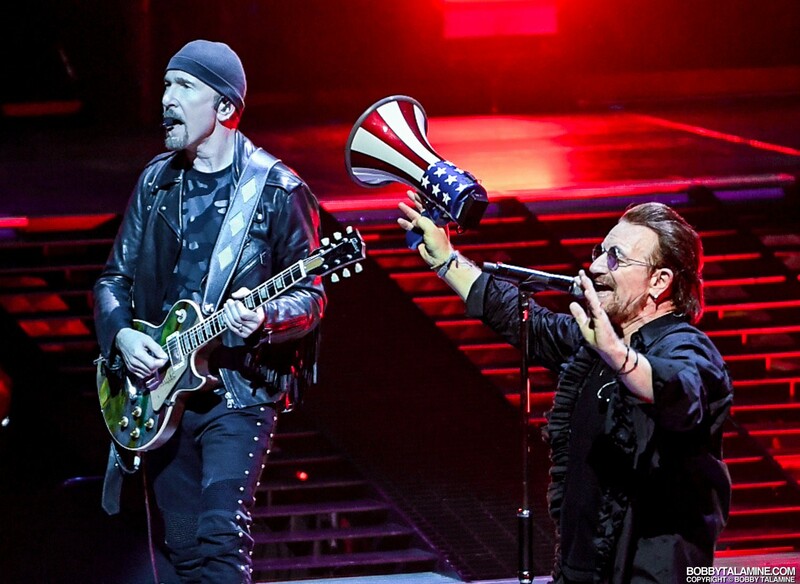 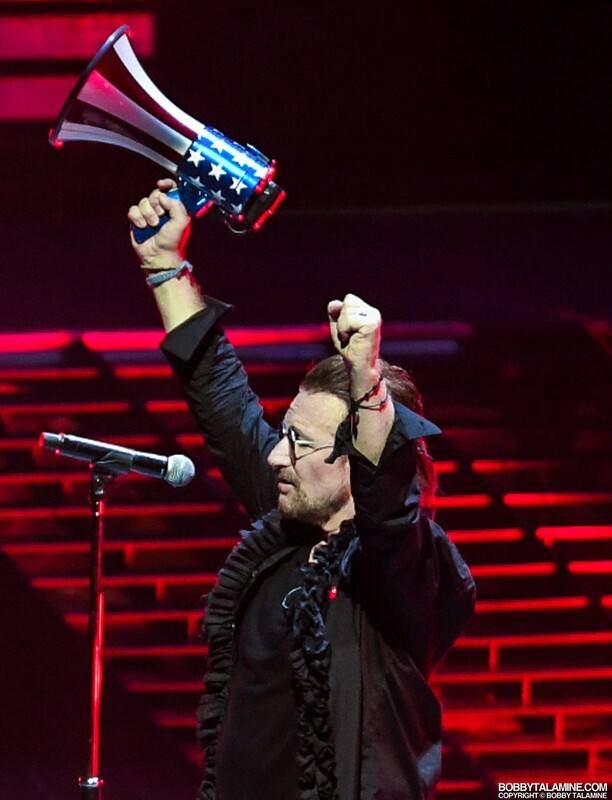 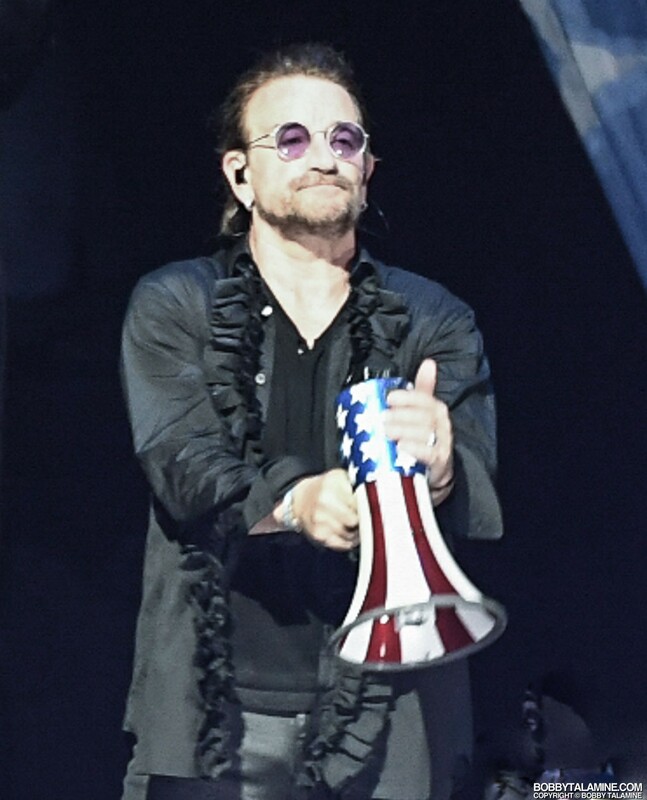 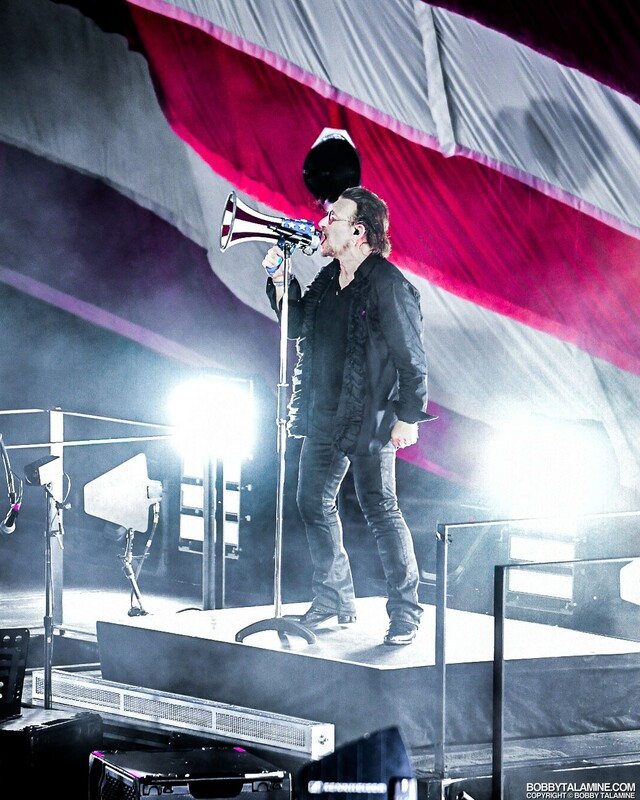 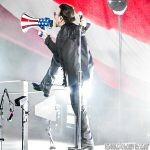 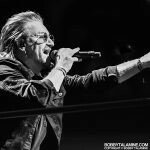 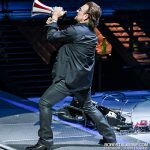 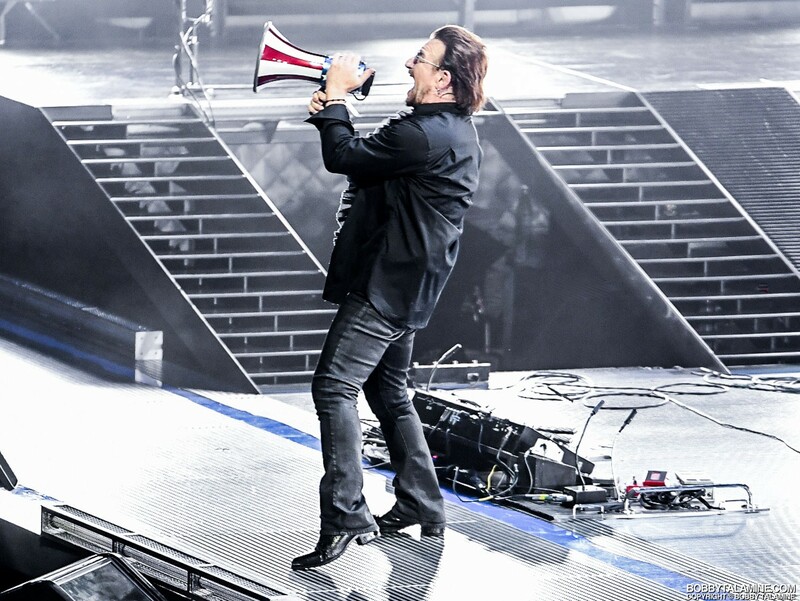 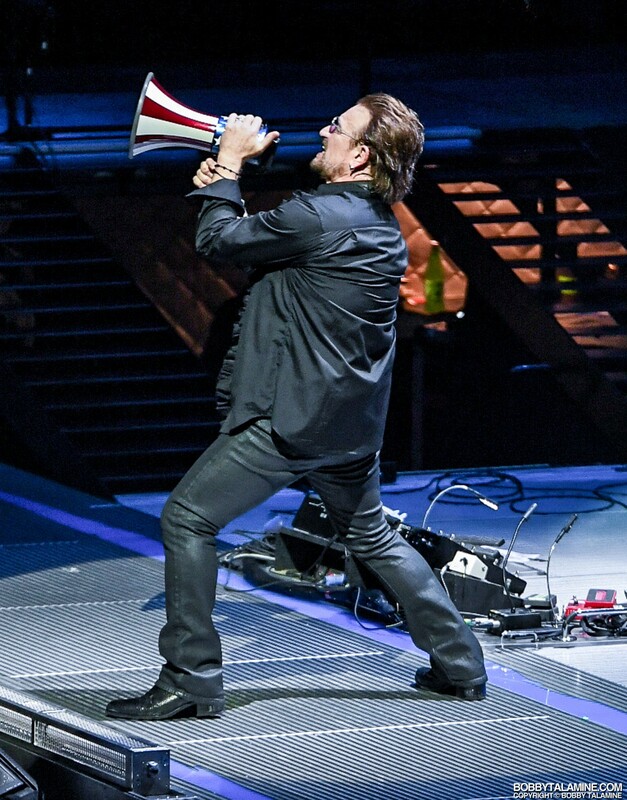 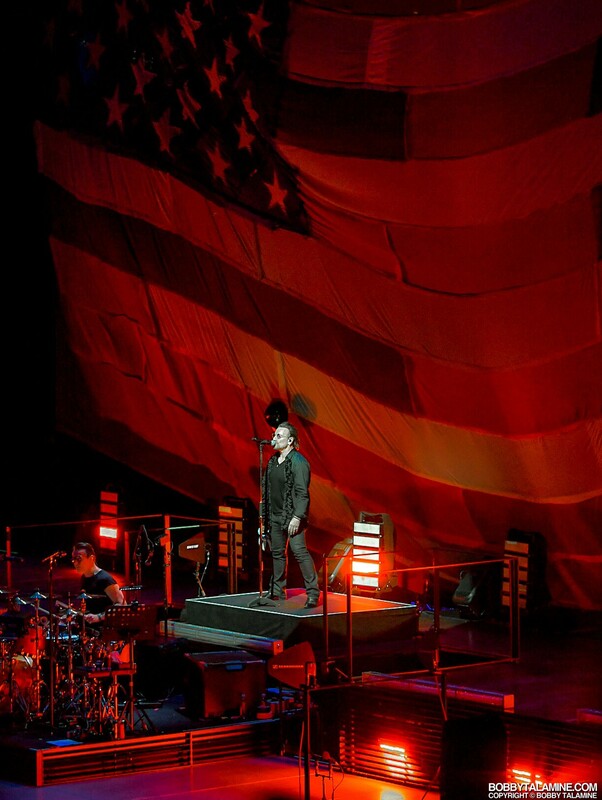 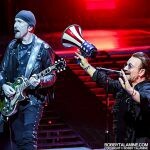 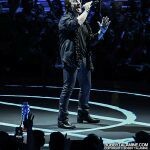 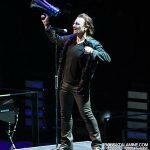 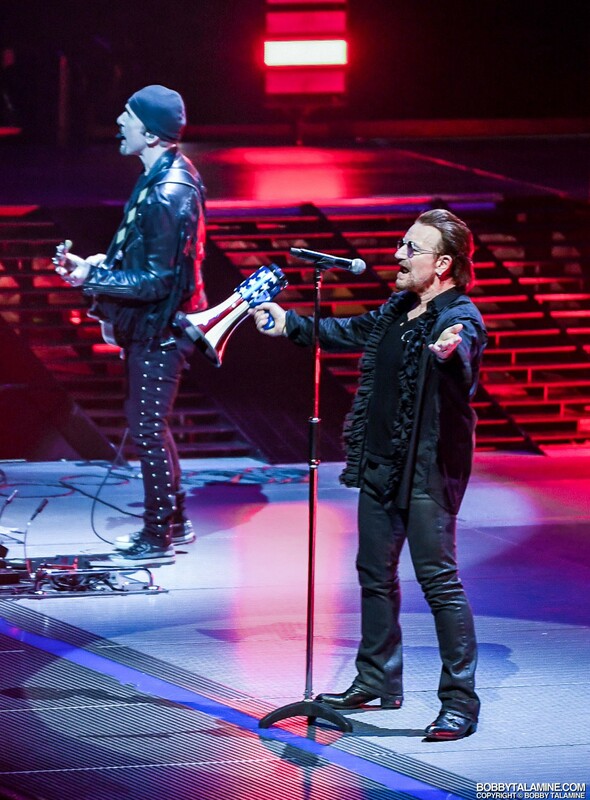 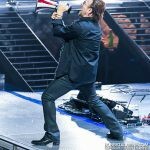 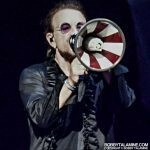 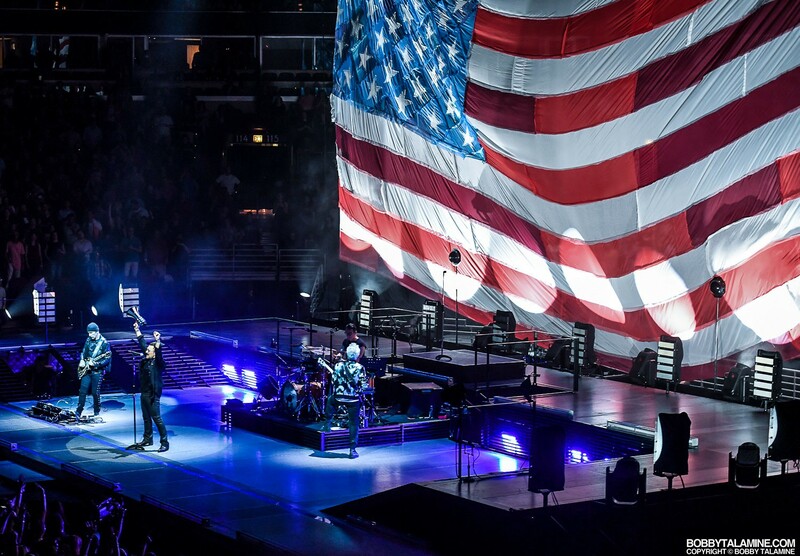 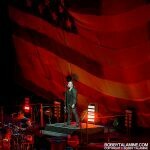 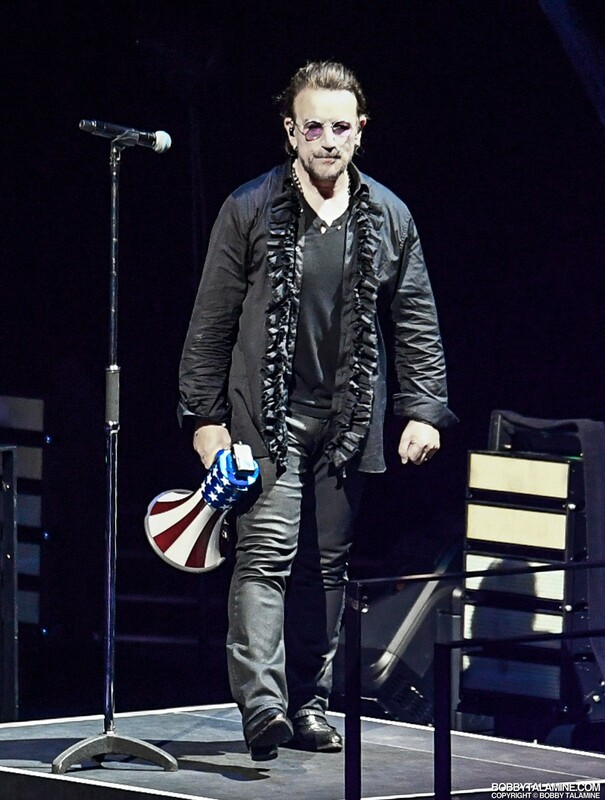 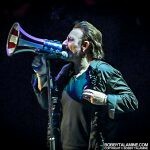 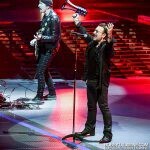 And on from there we went, bullhorn by Bono’s side depending on the song, back to the main stage with a backdrop of a gargantuan American flag, vertical white strobe lights illuminating the stage righgt and left / center to the back, and the GA floor getting so into it. 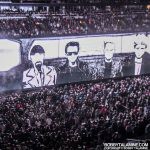 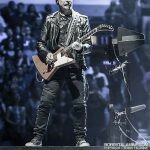 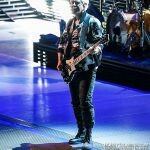 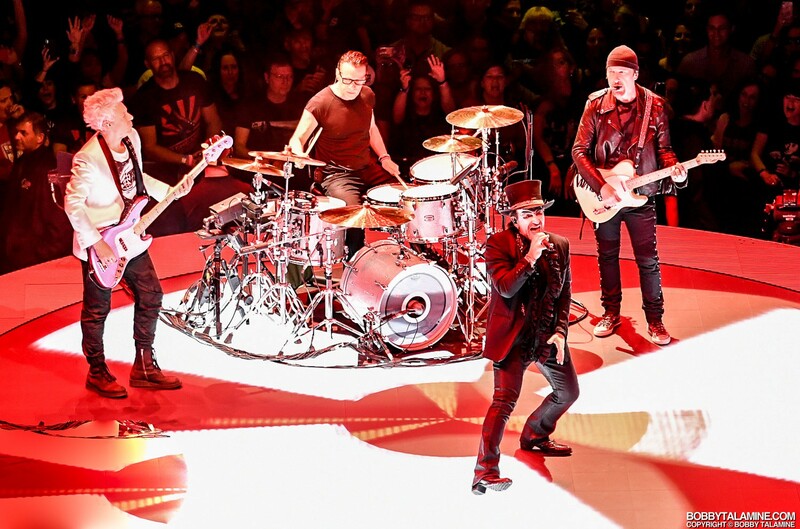 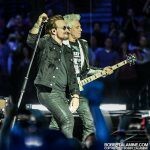 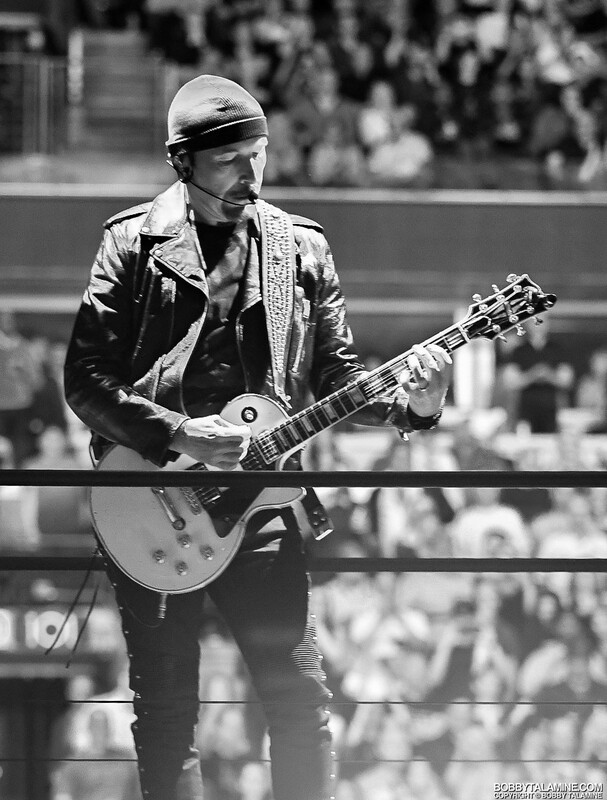 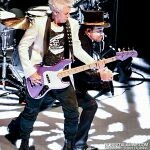 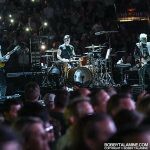 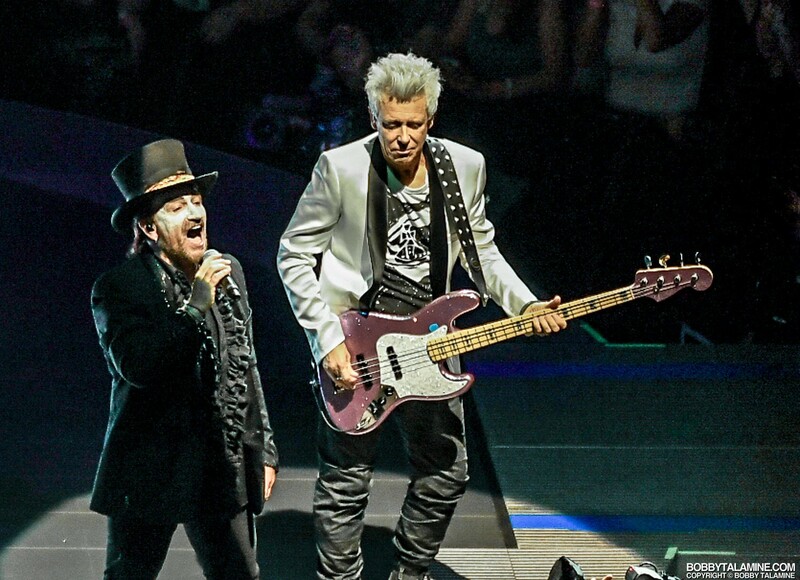 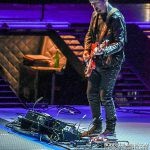 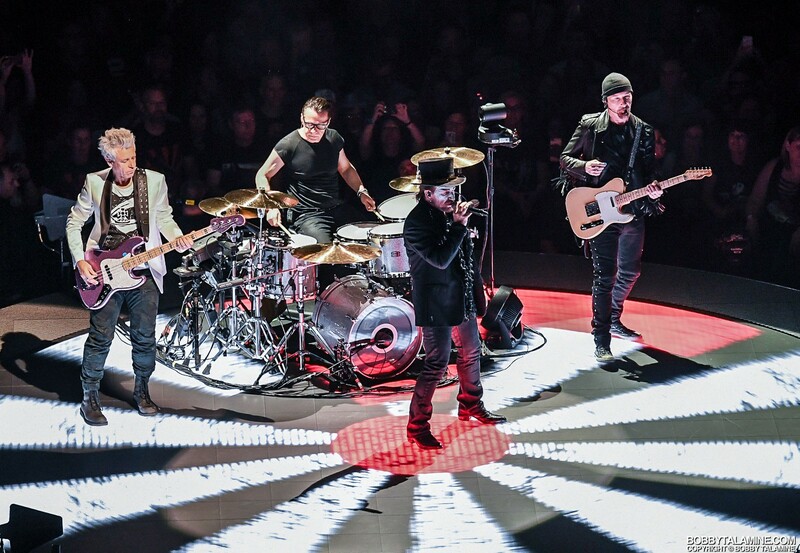 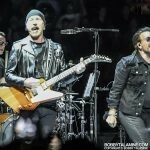 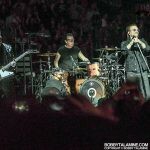 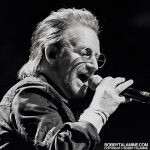 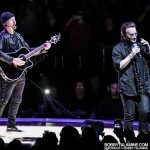 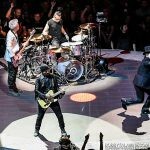 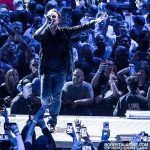 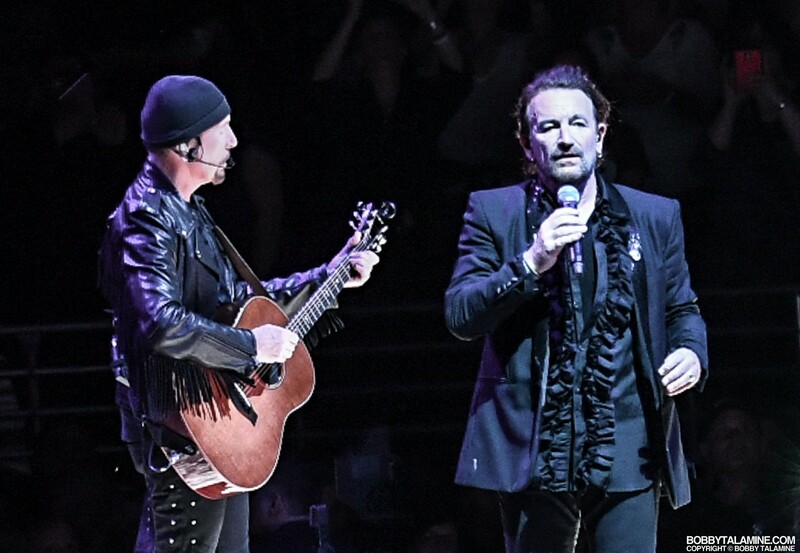 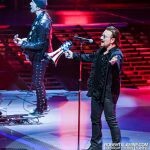 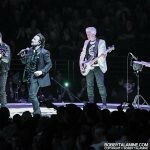 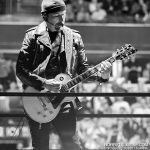 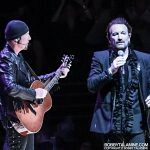 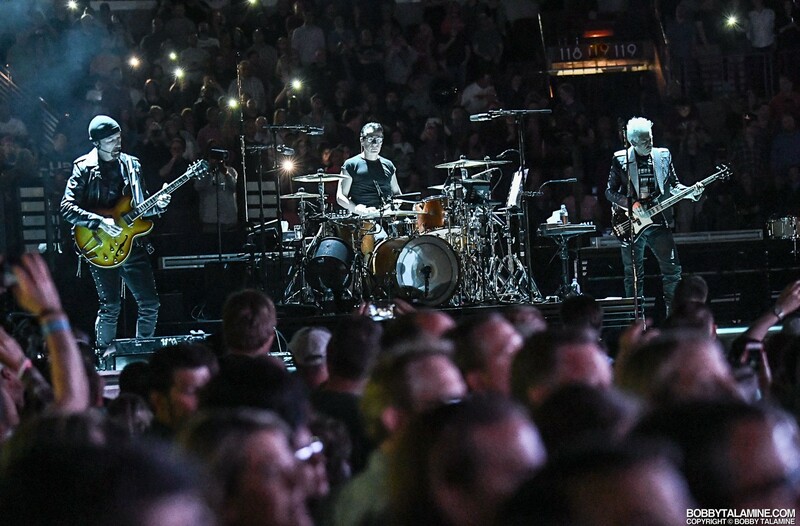 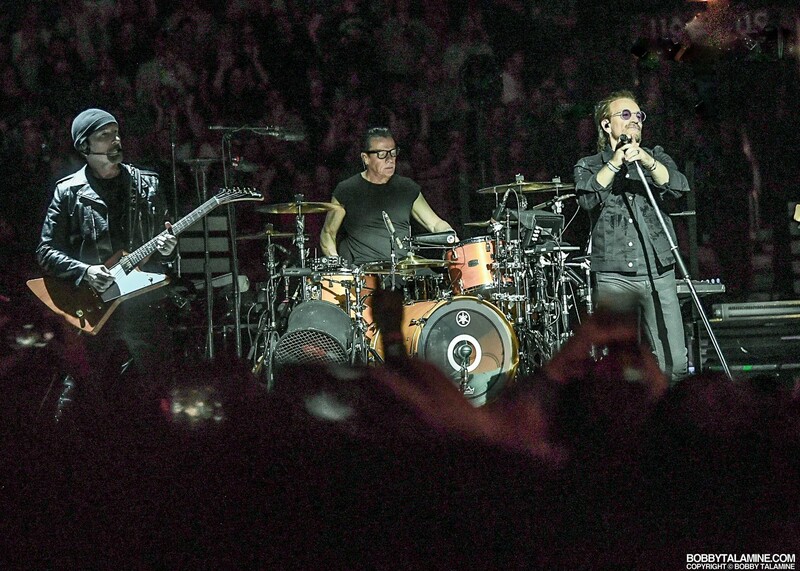 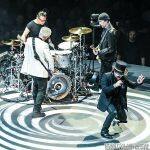 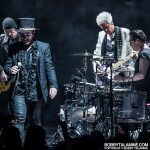 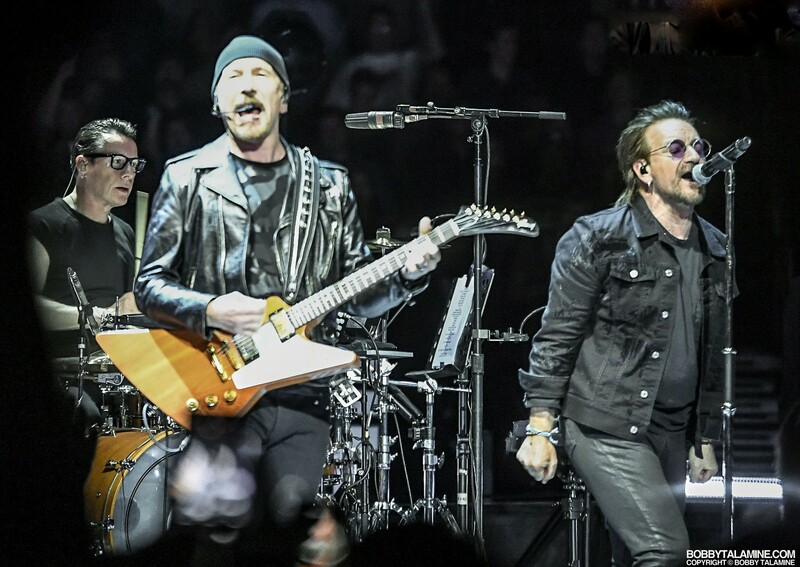 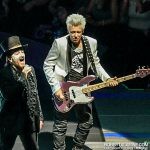 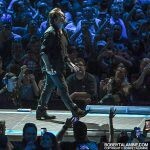 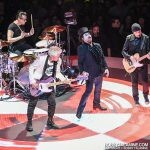 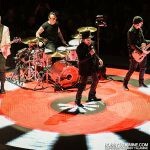 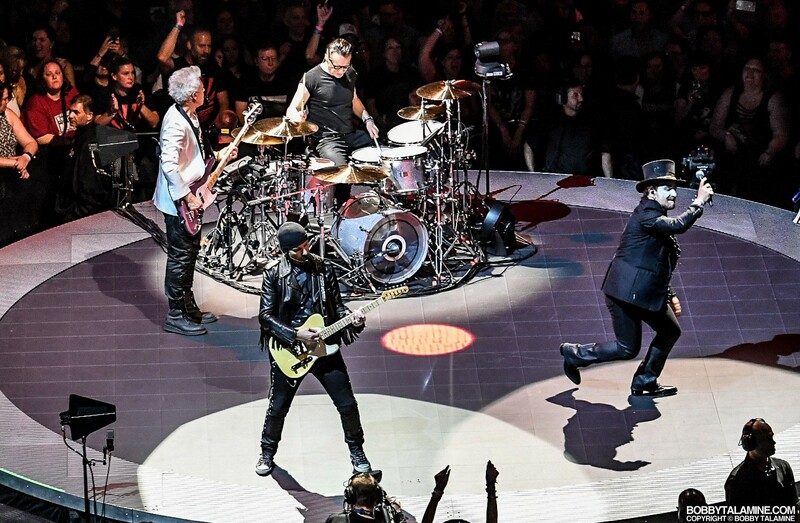 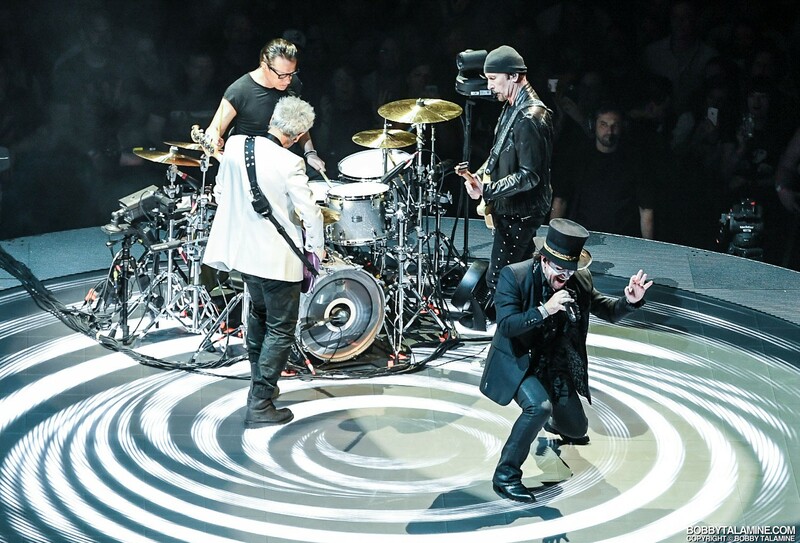 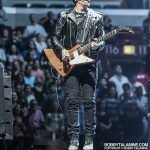 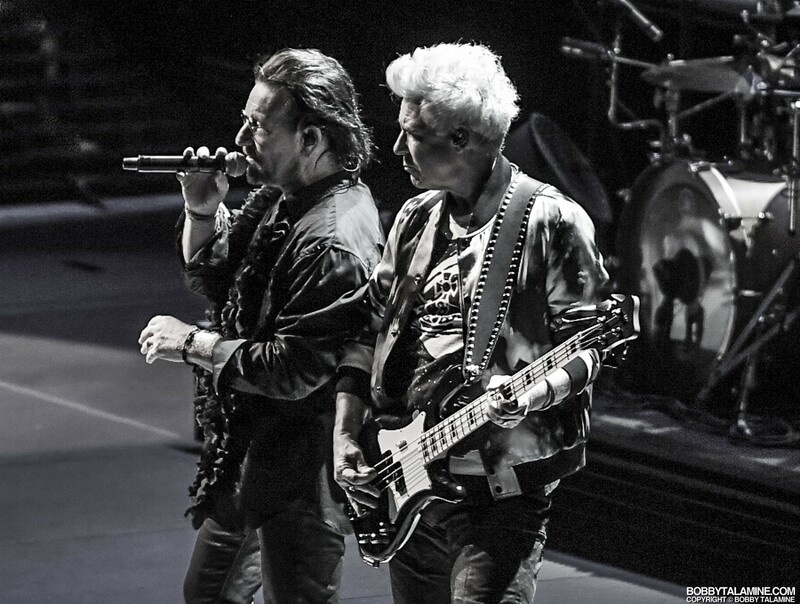 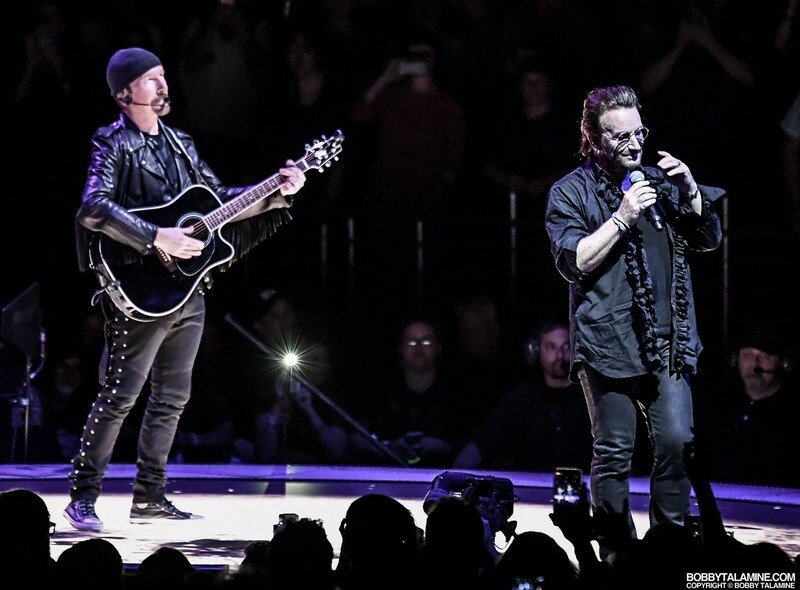 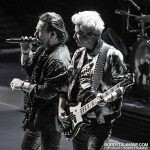 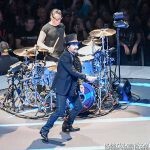 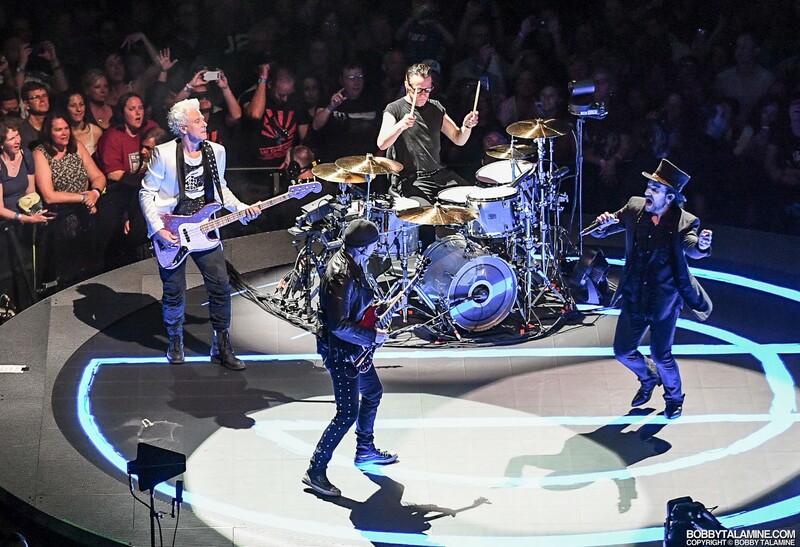 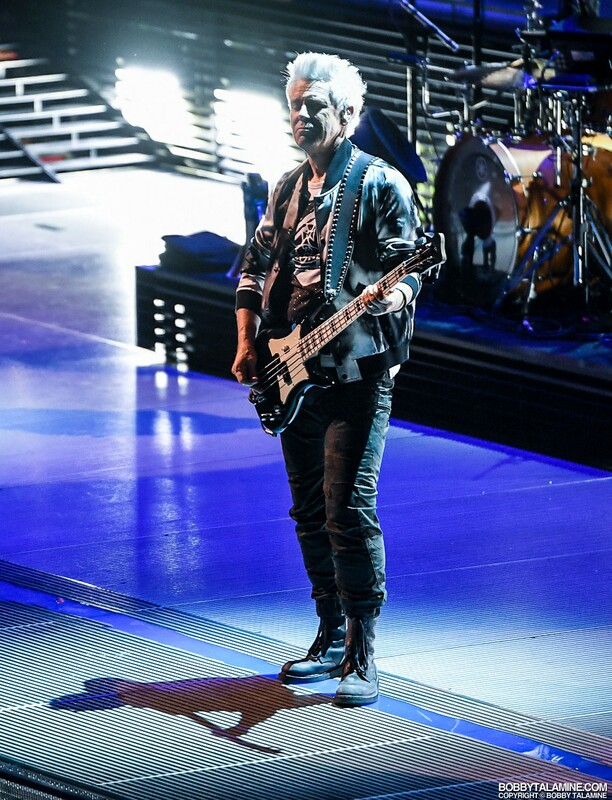 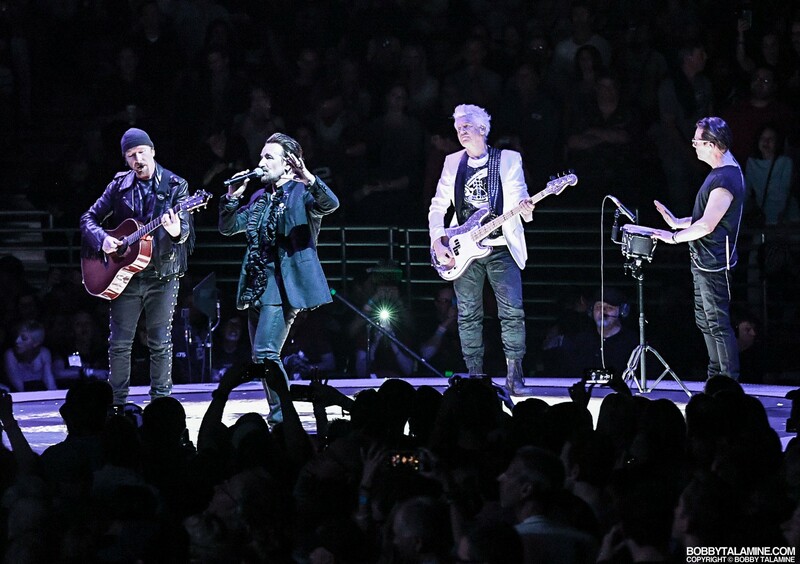 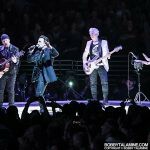 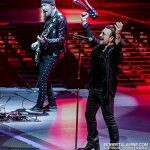 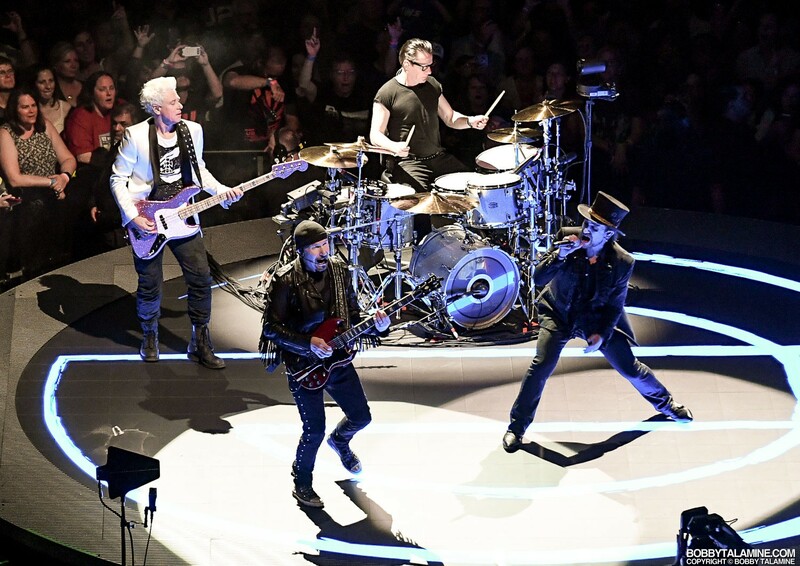 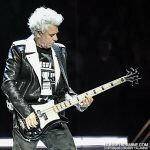 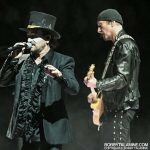 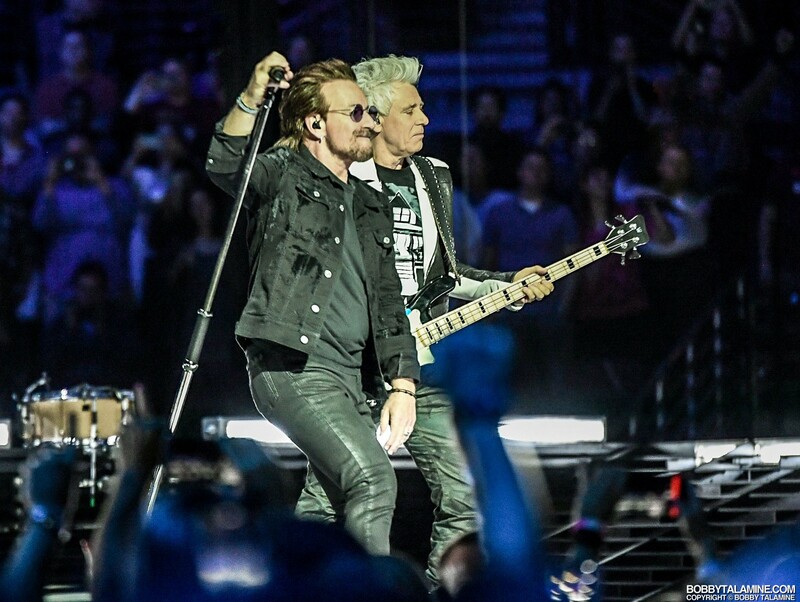 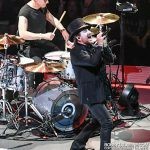 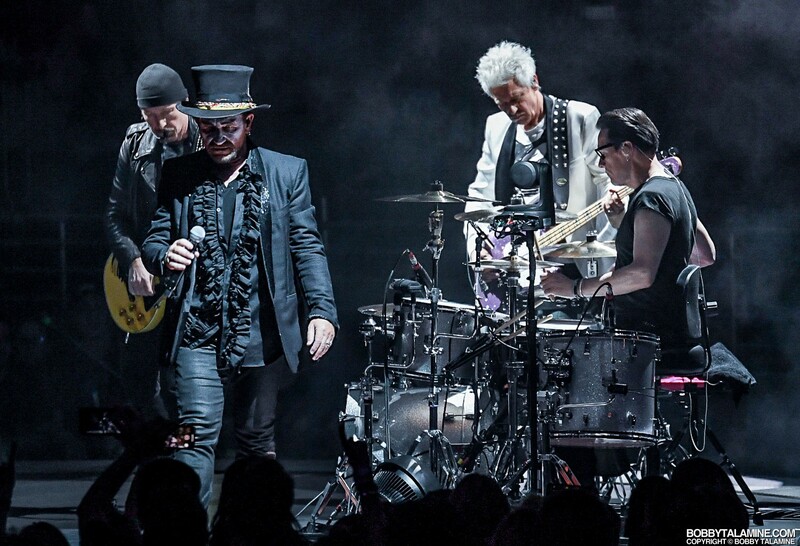 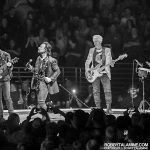 The boys of U2 have altered their setlist, dialed down the anthem songs, and have made a relevant setlist that is poignant for these crazy times we live in. 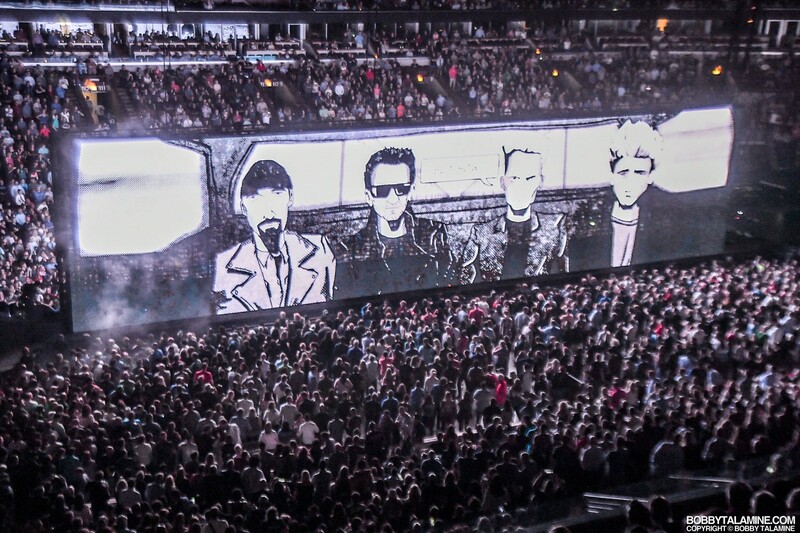 All n’ all, a decent show with keen delivery from the boys of Dublin.